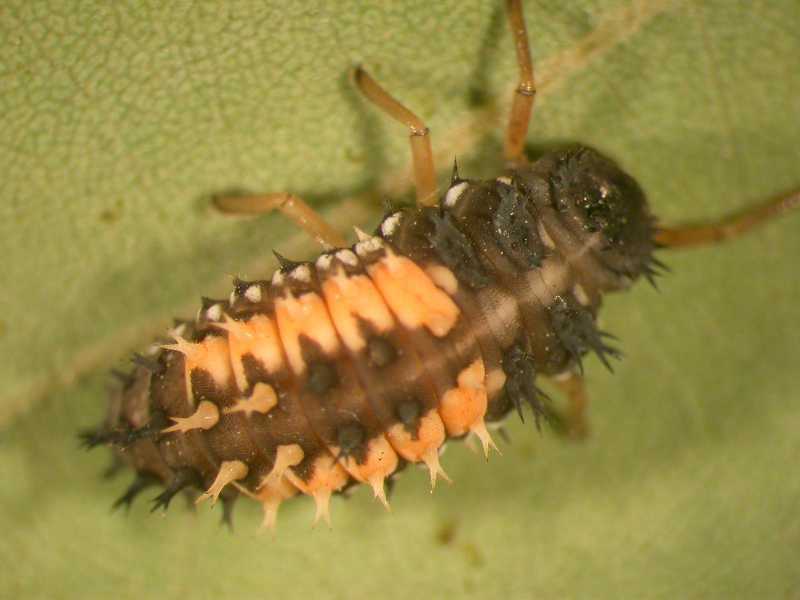 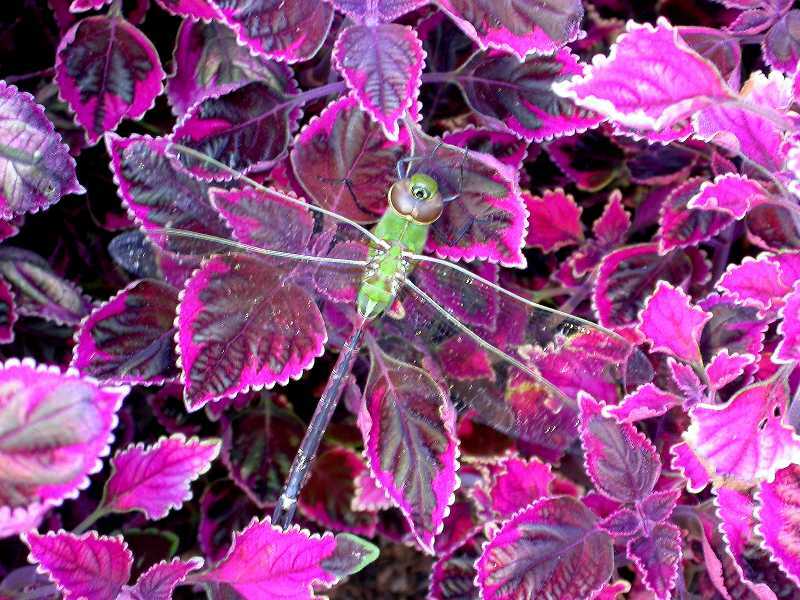 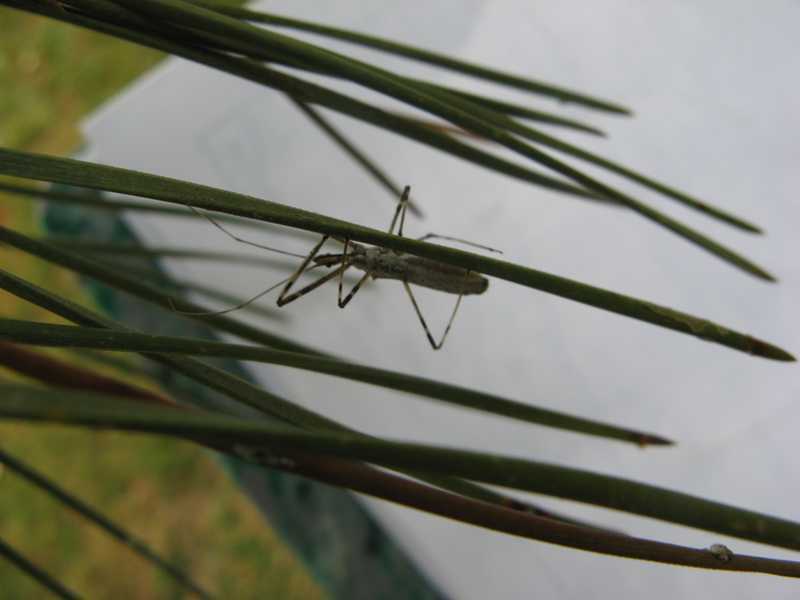 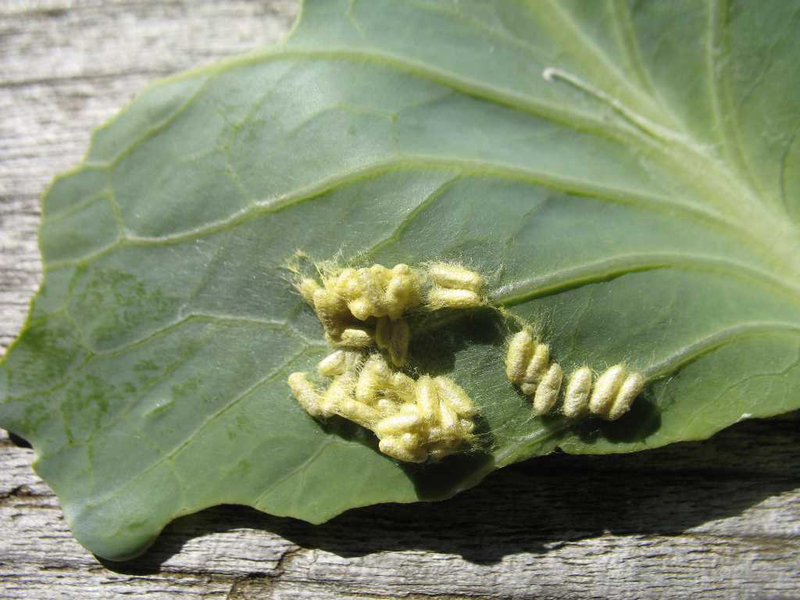 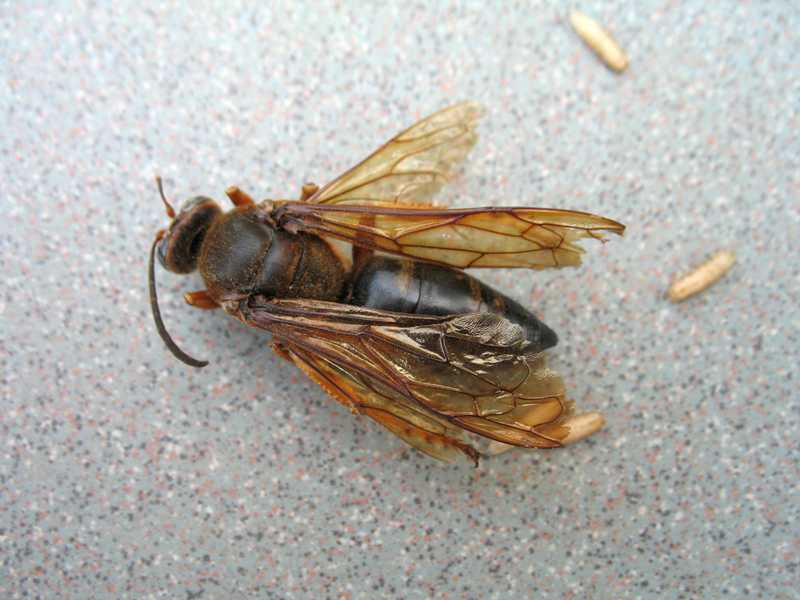 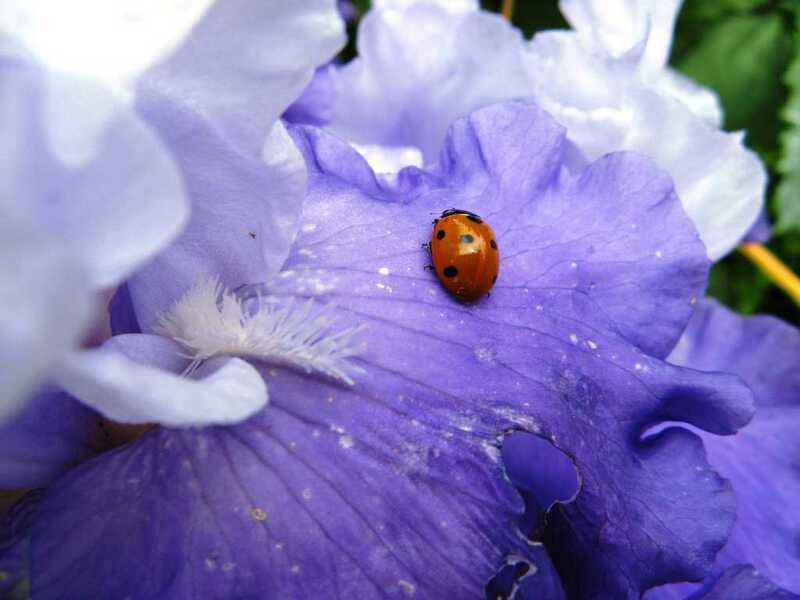 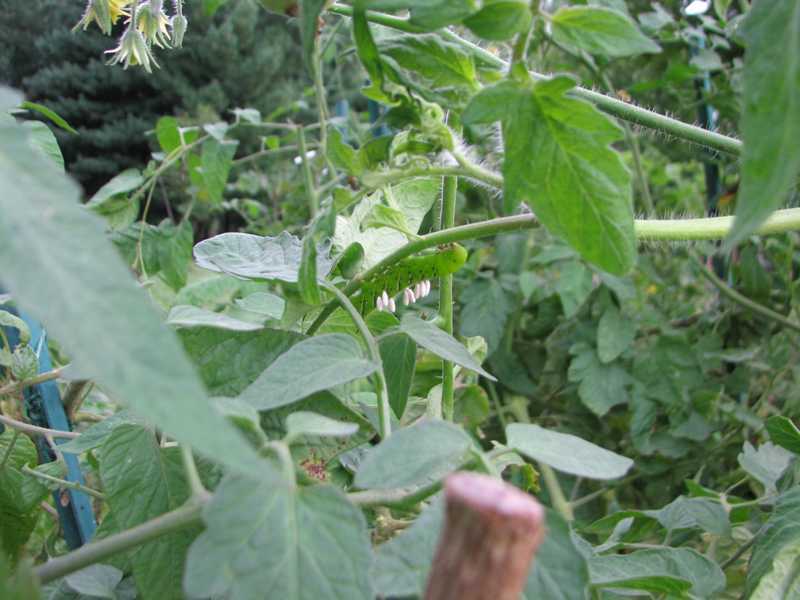 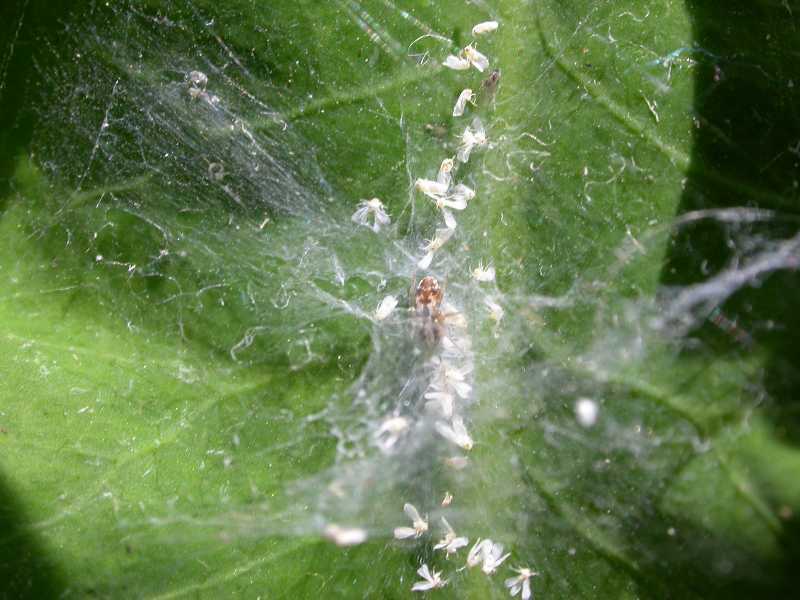 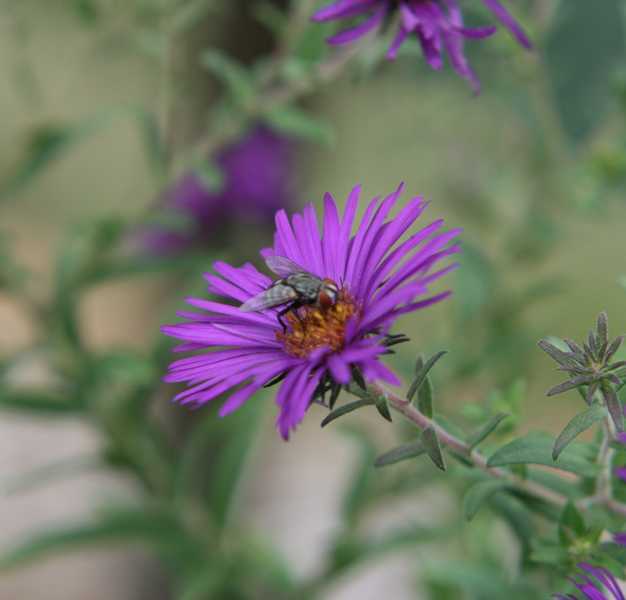 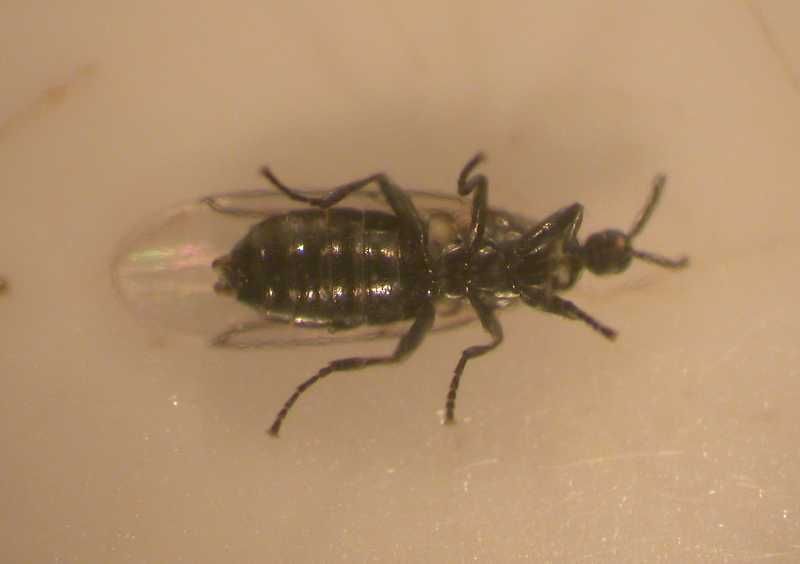 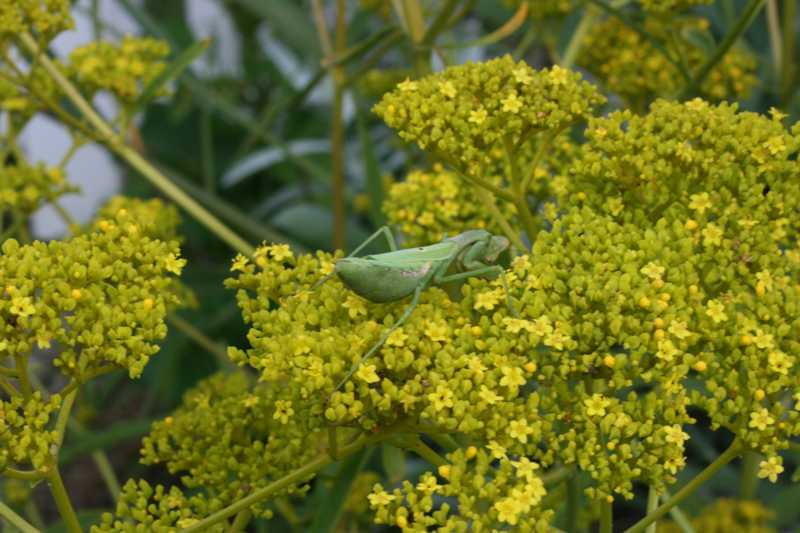 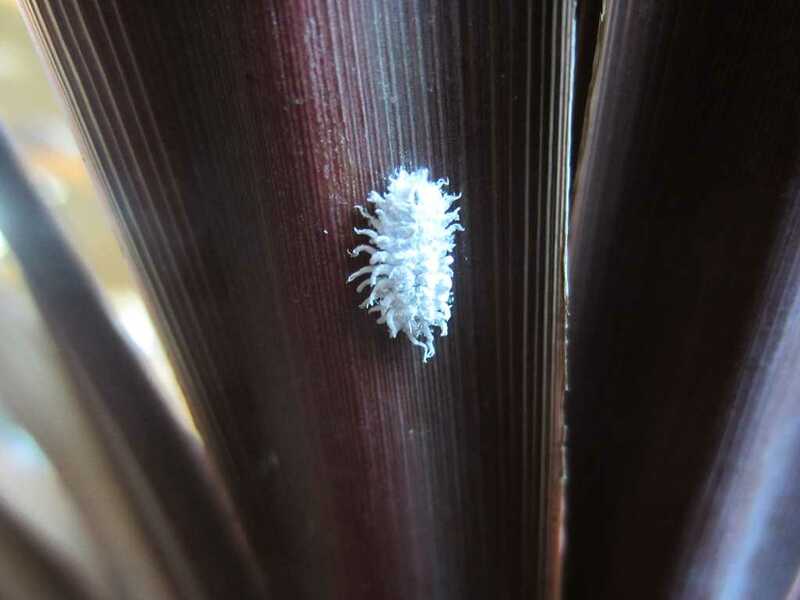 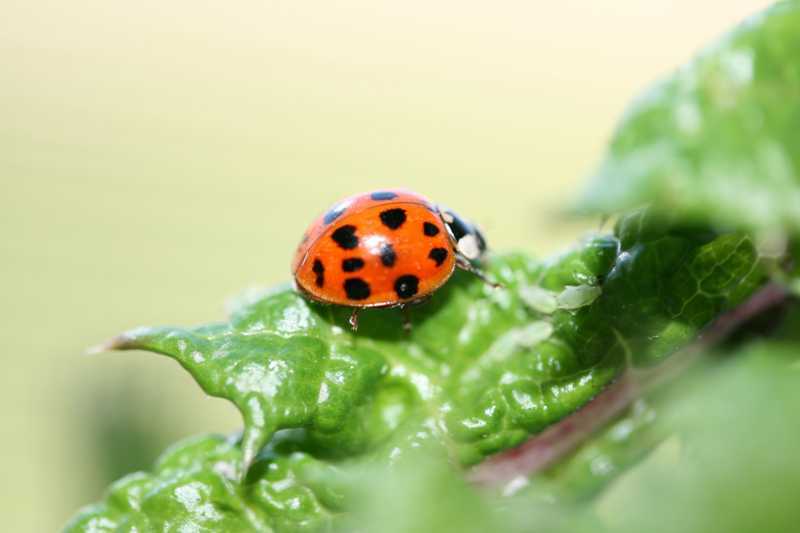 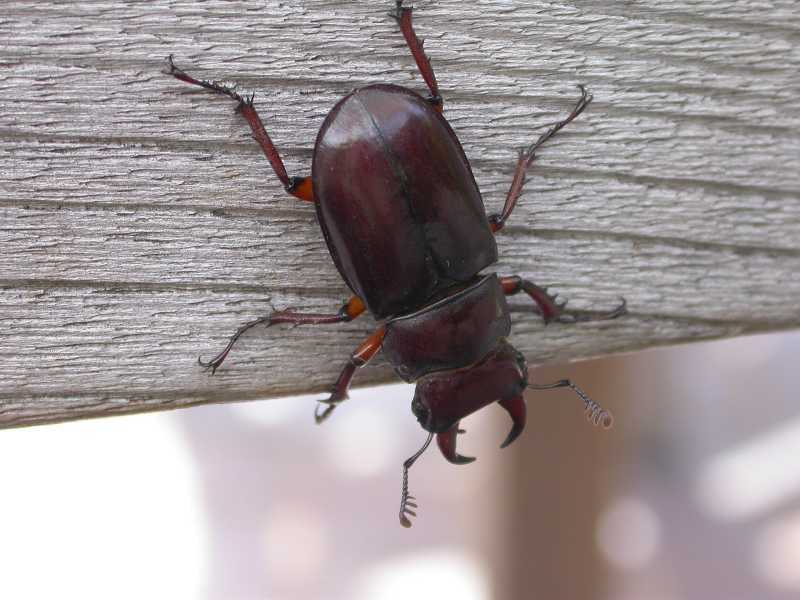 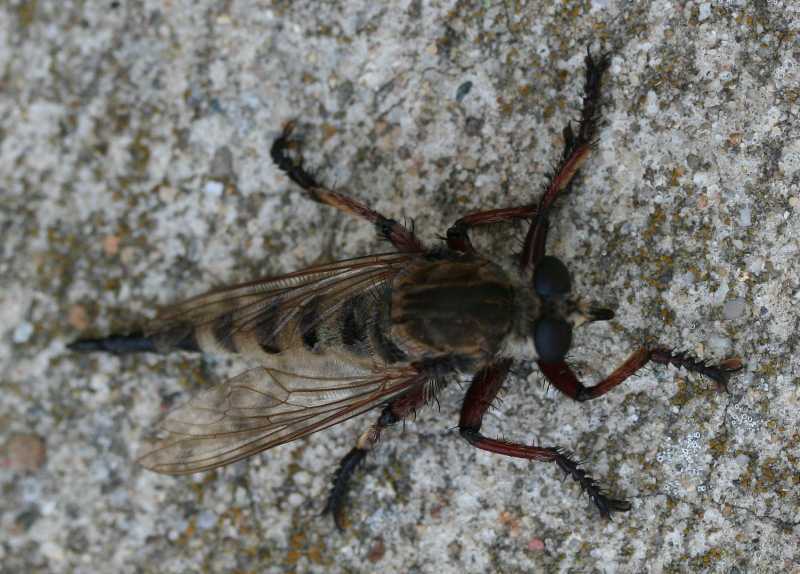 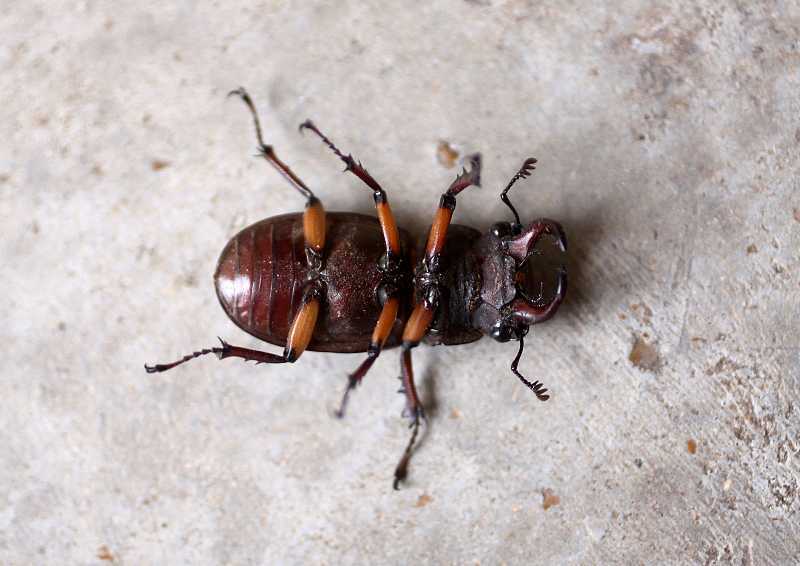 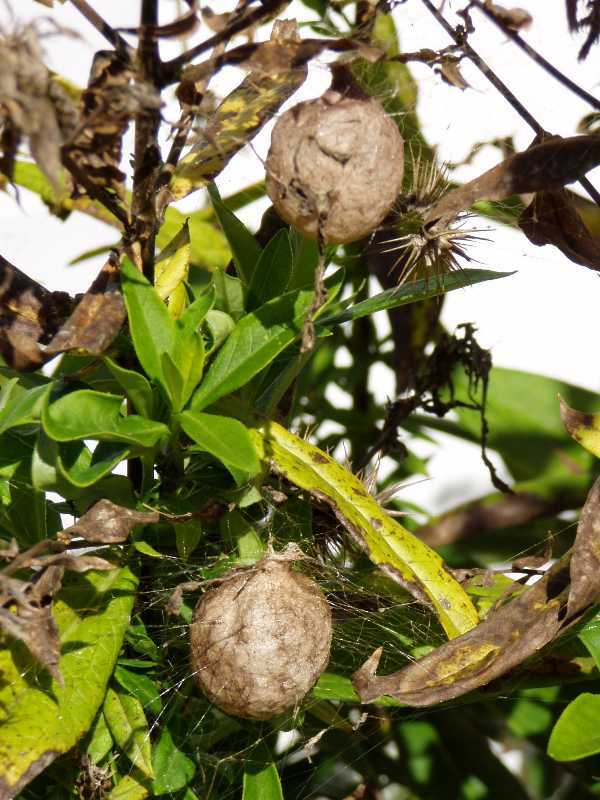 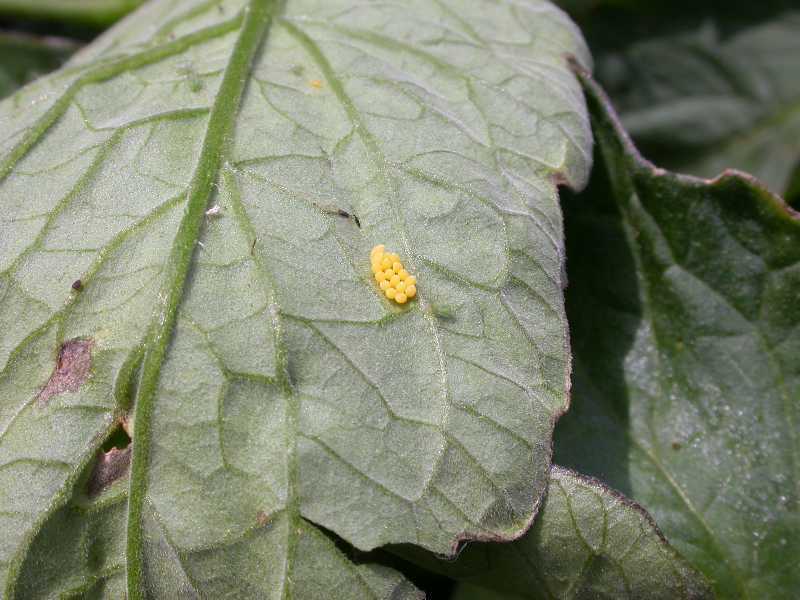 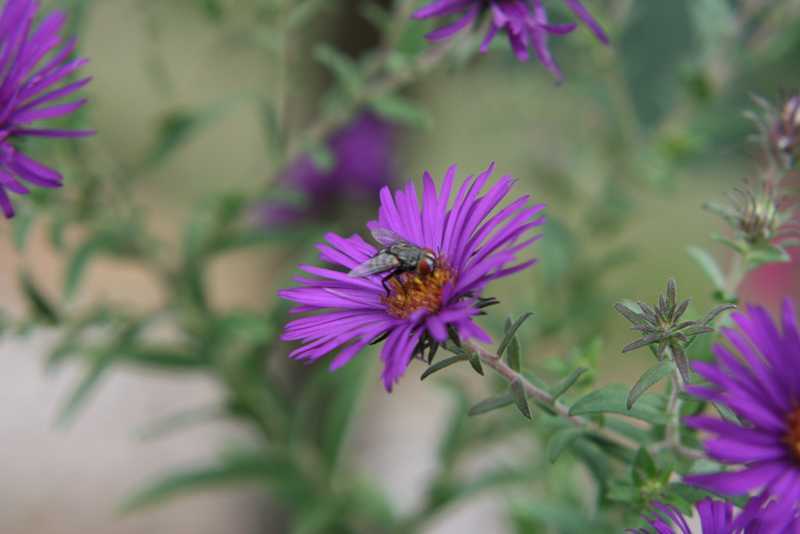 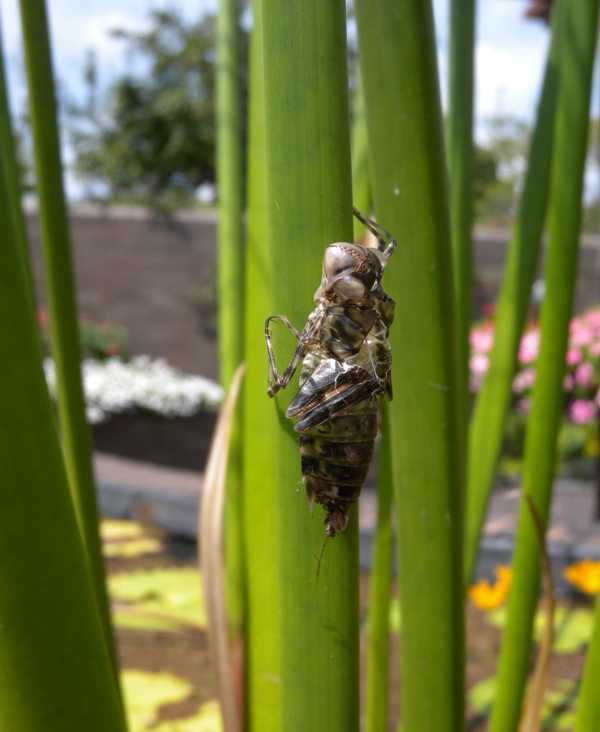 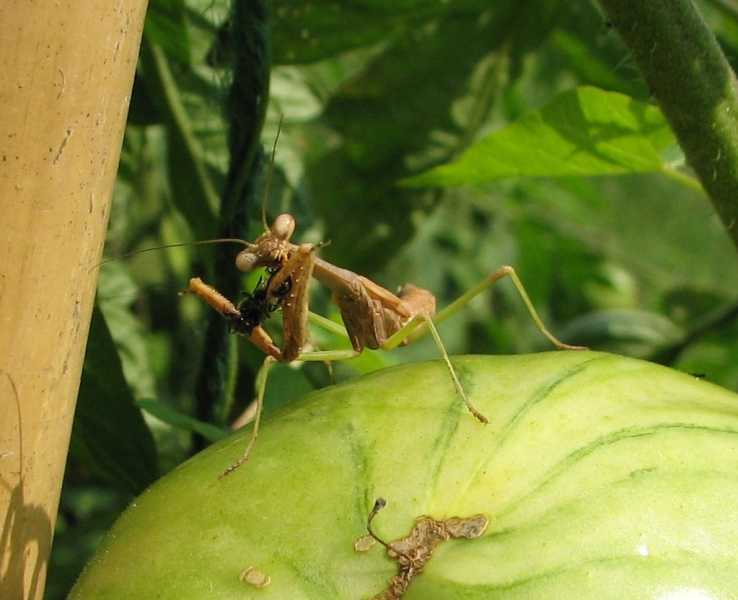 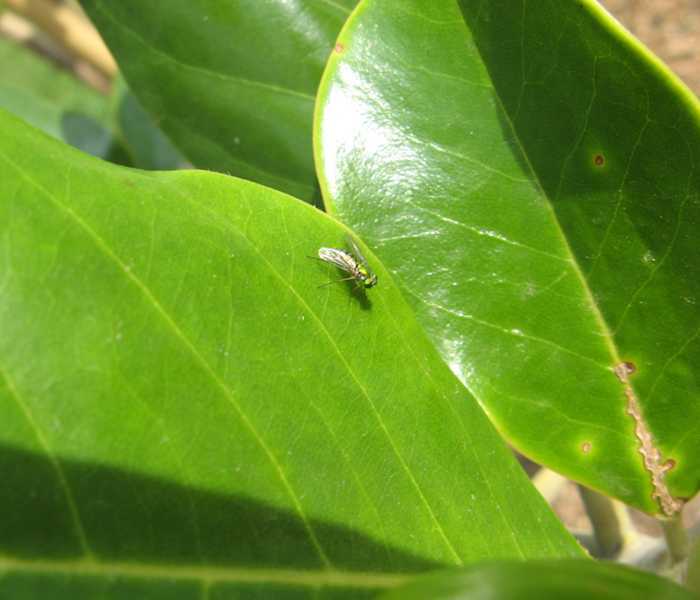 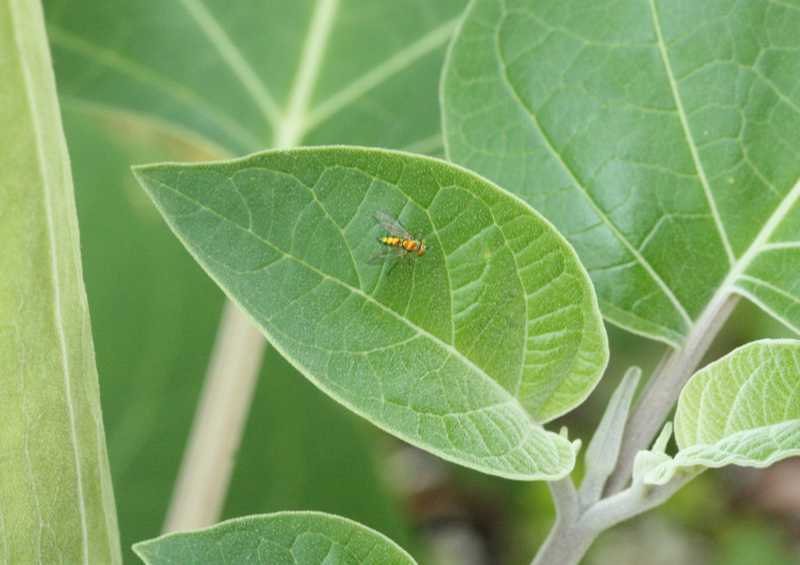 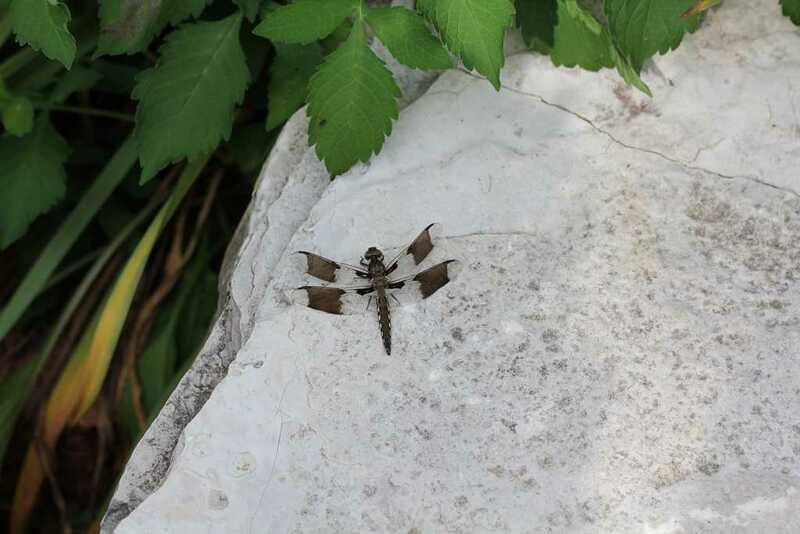 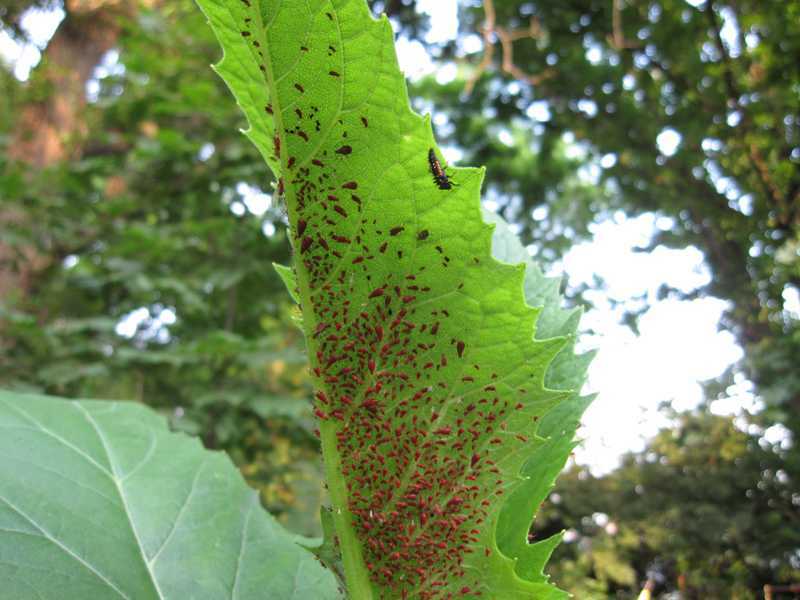 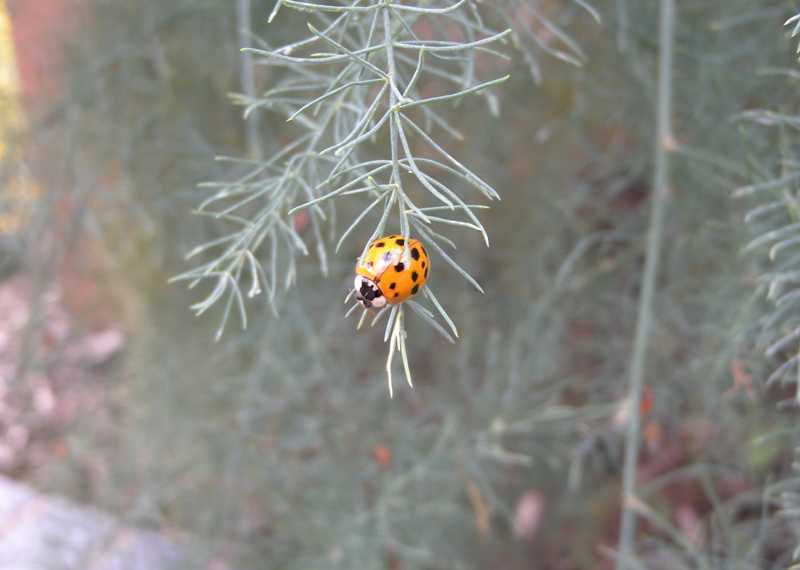 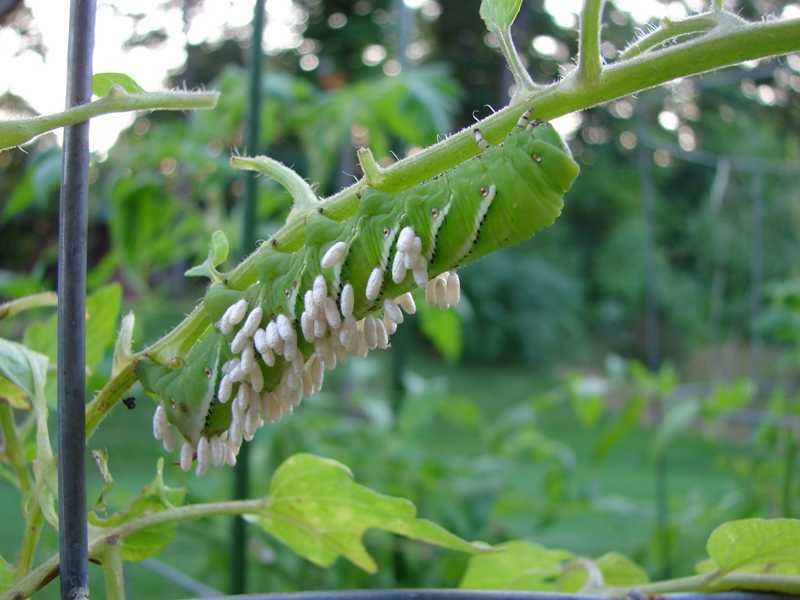 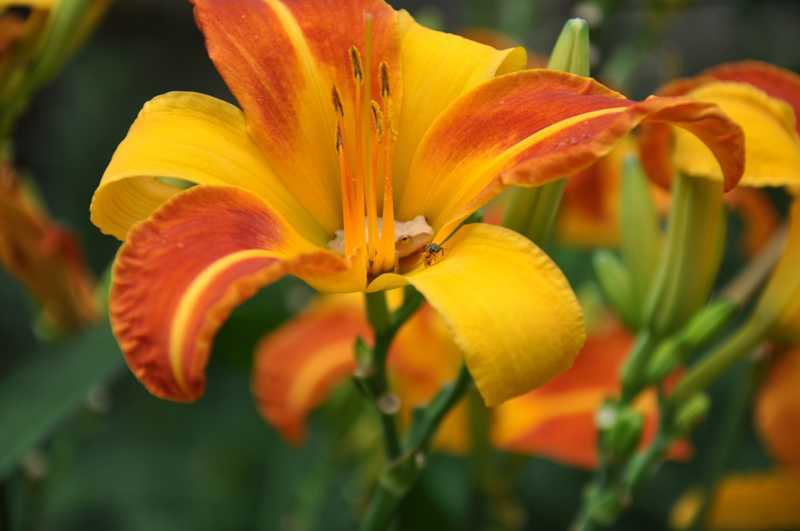 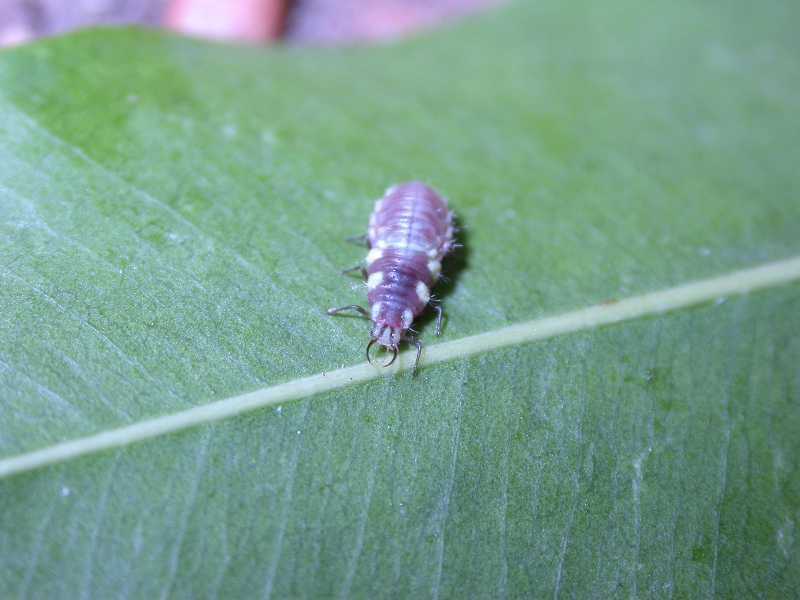 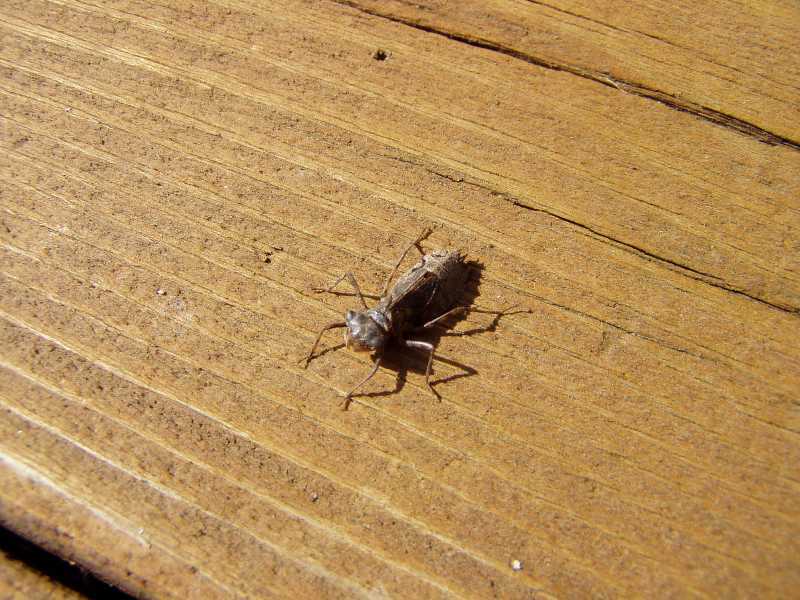 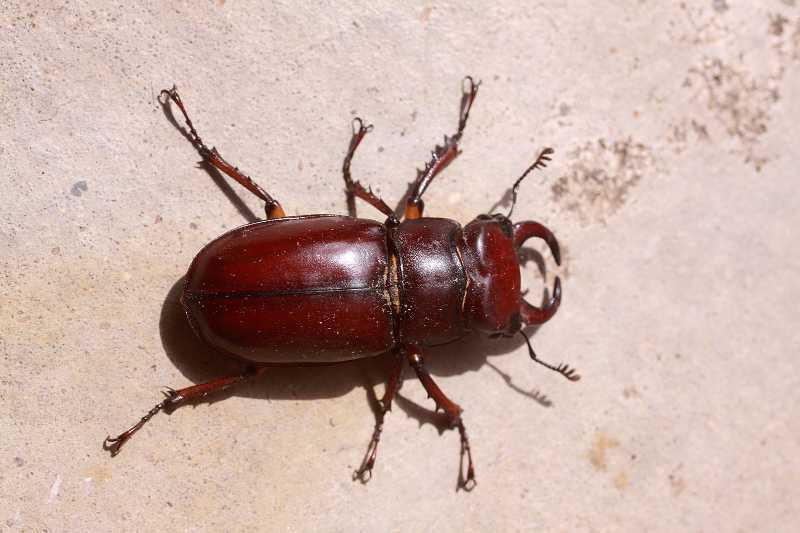 Many insects cause damage to garden plants but others can do a very effective job of keeping problem insects in check without the use of pesticides. 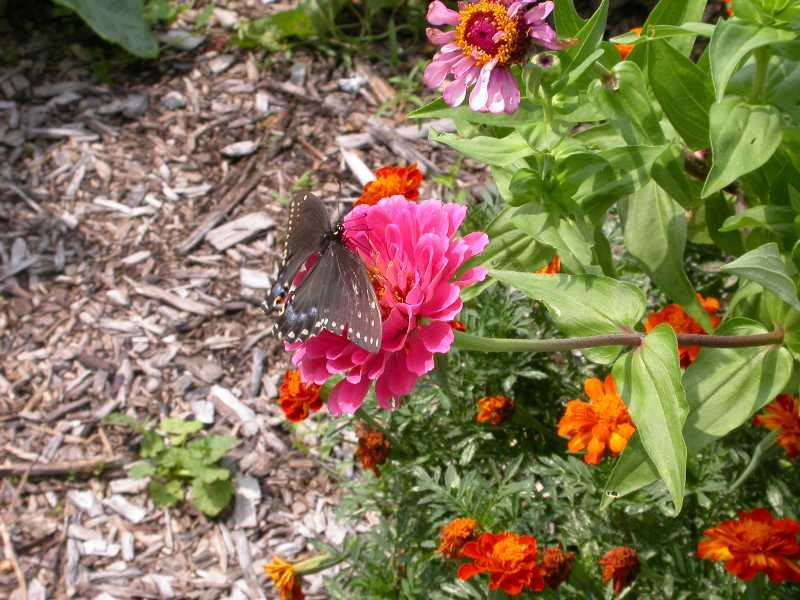 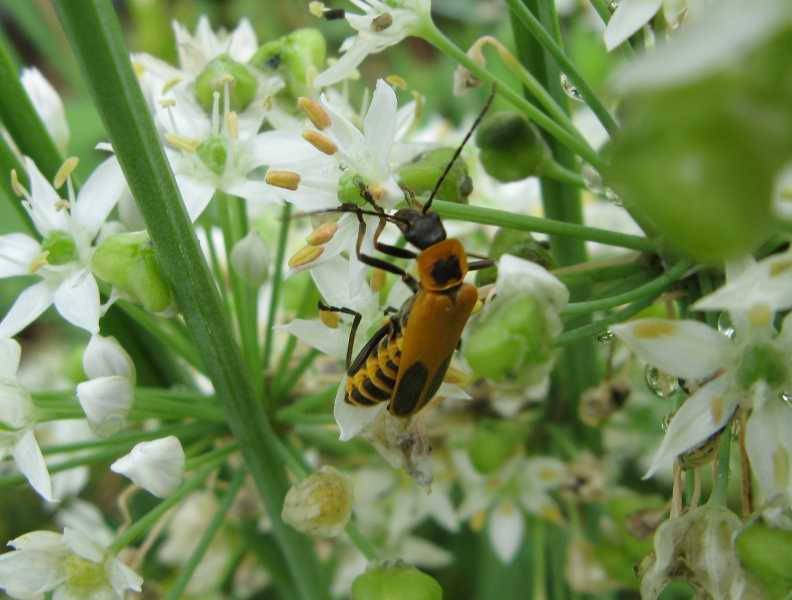 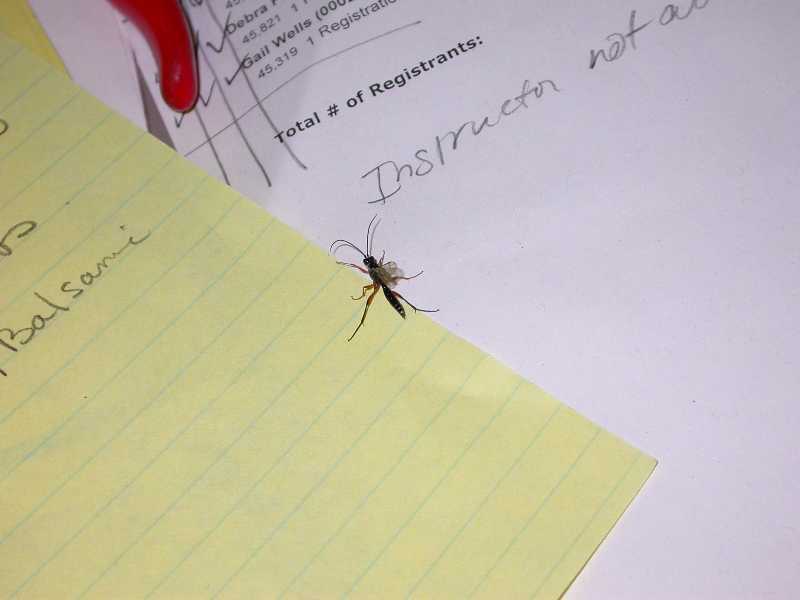 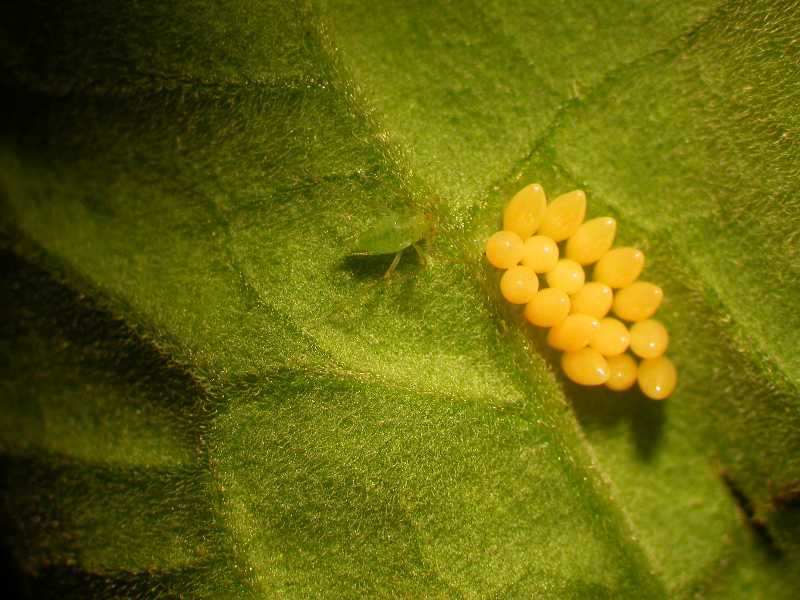 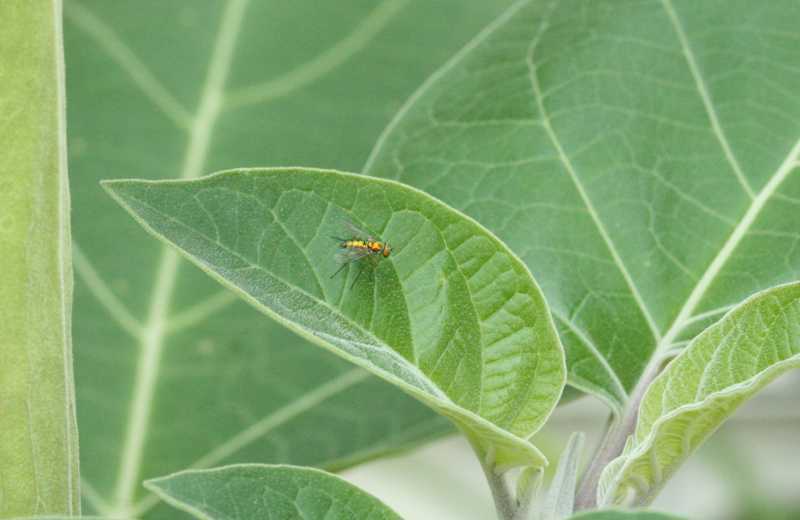 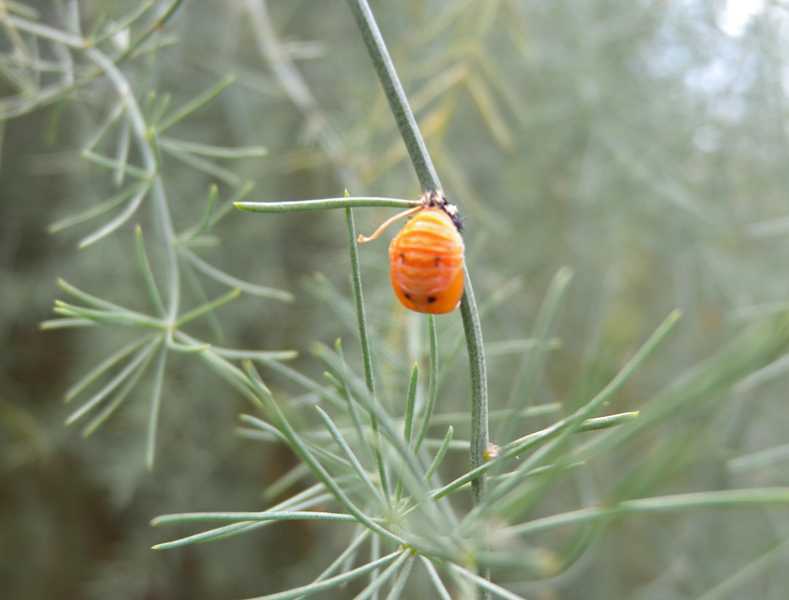 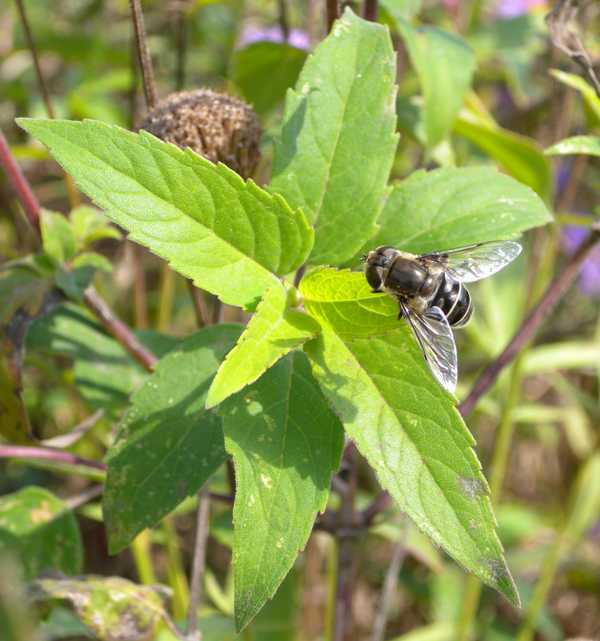 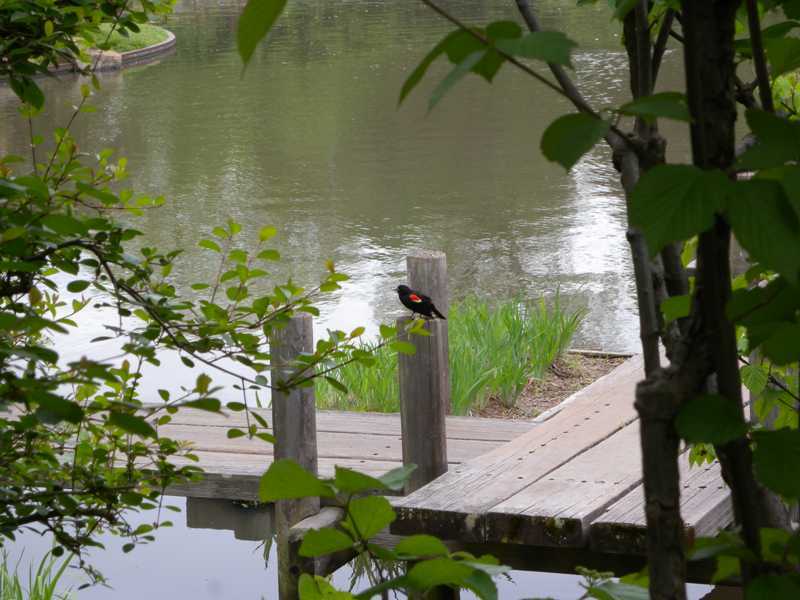 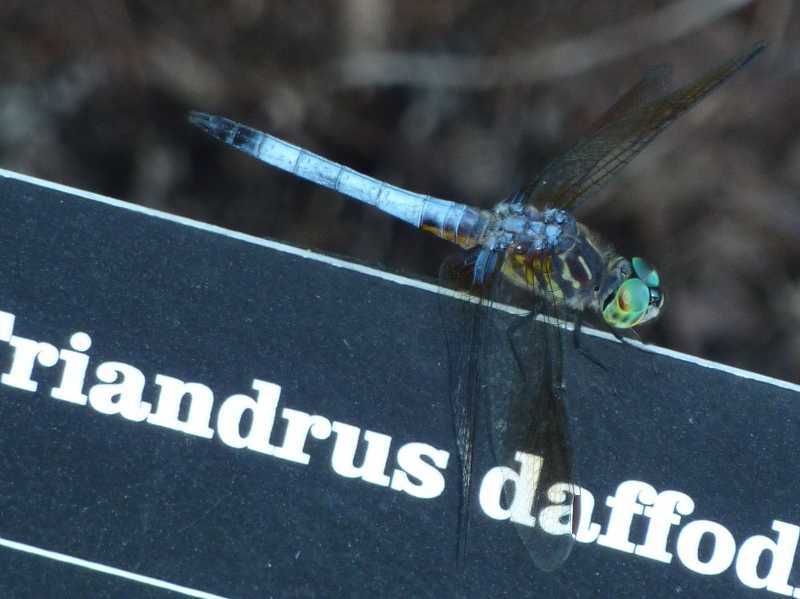 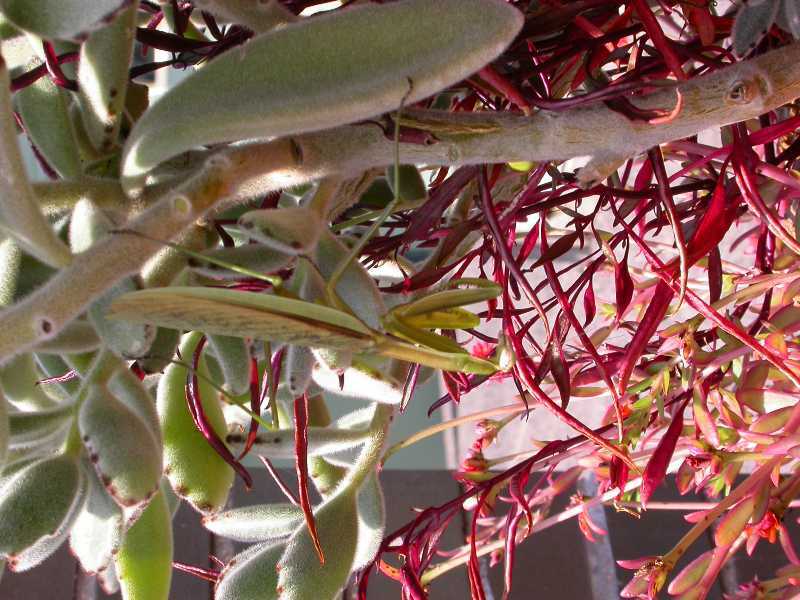 Therefore, it behoves the responsible gardener to learn to identify beneficial insects and encourage them whenever possible. 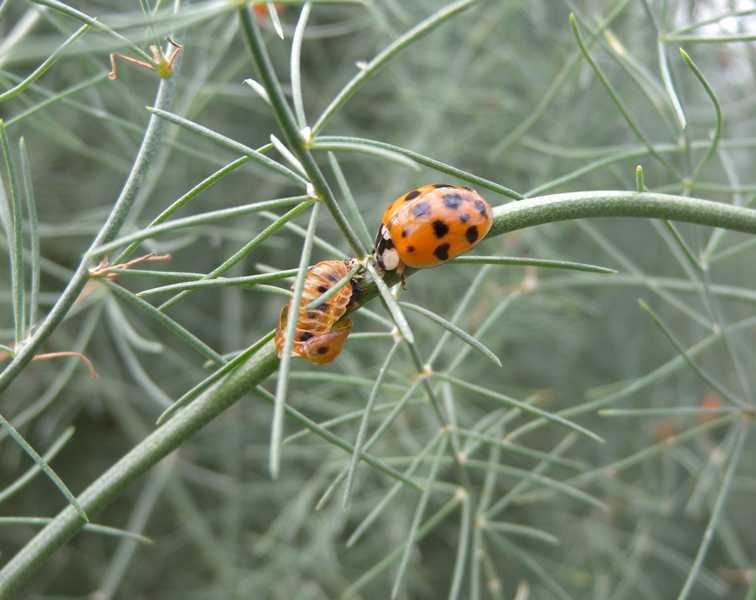 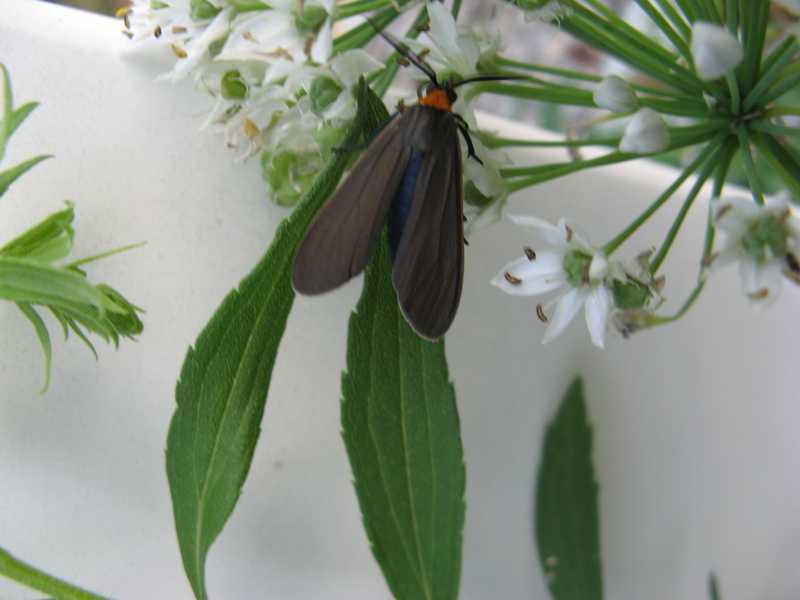 Here is a selection of some common beneficial insects. 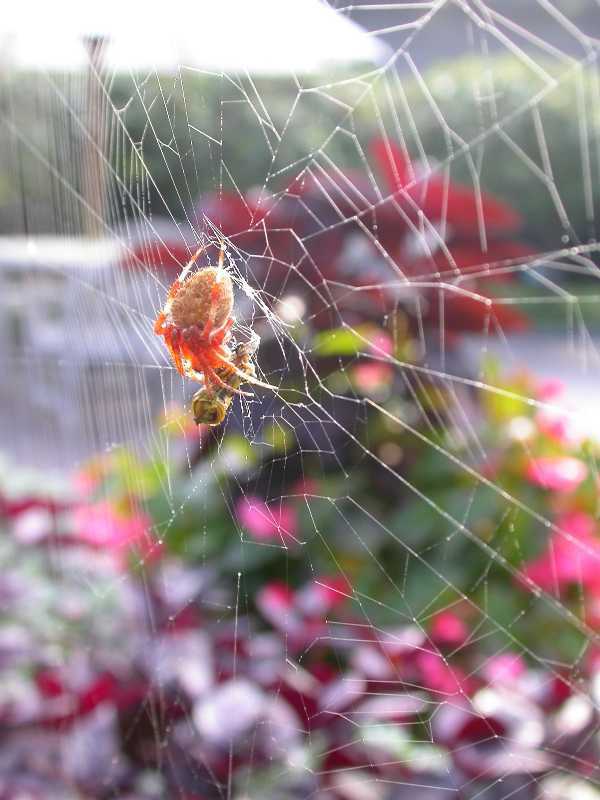 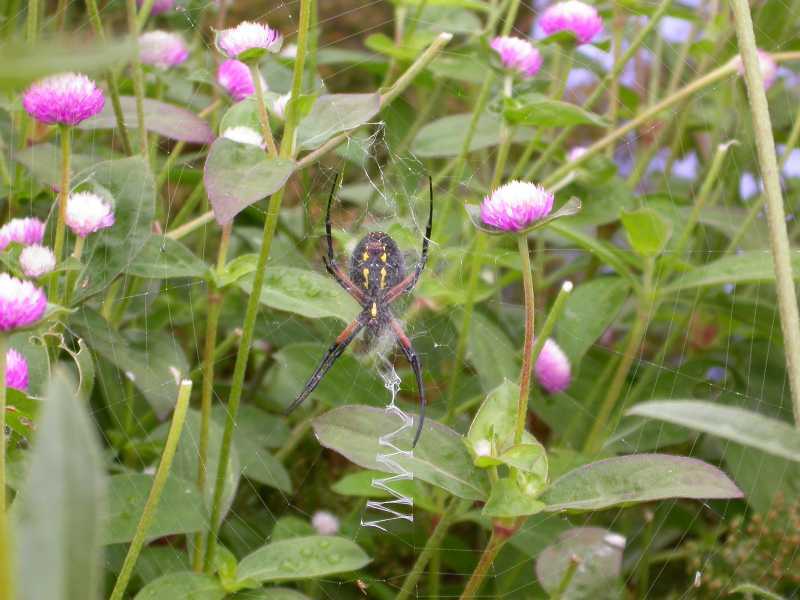 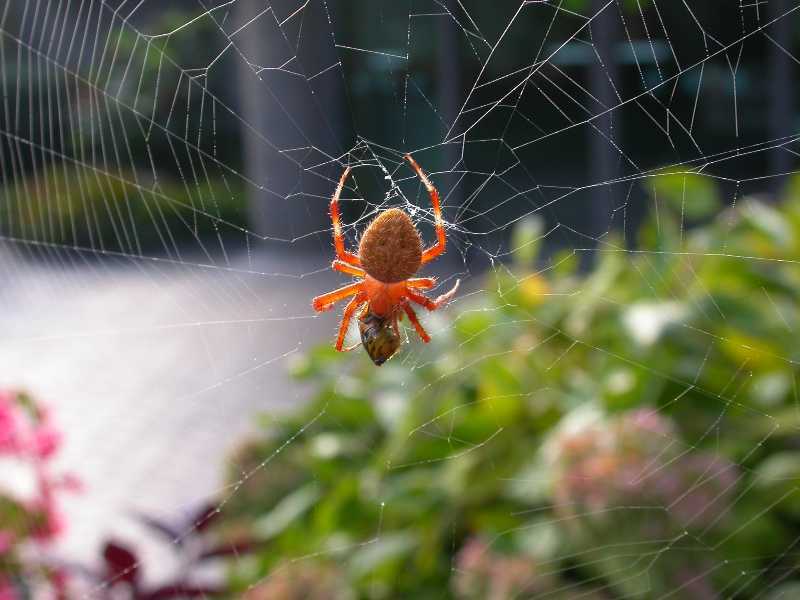 Spiders (Araneae) are beneficial predators. 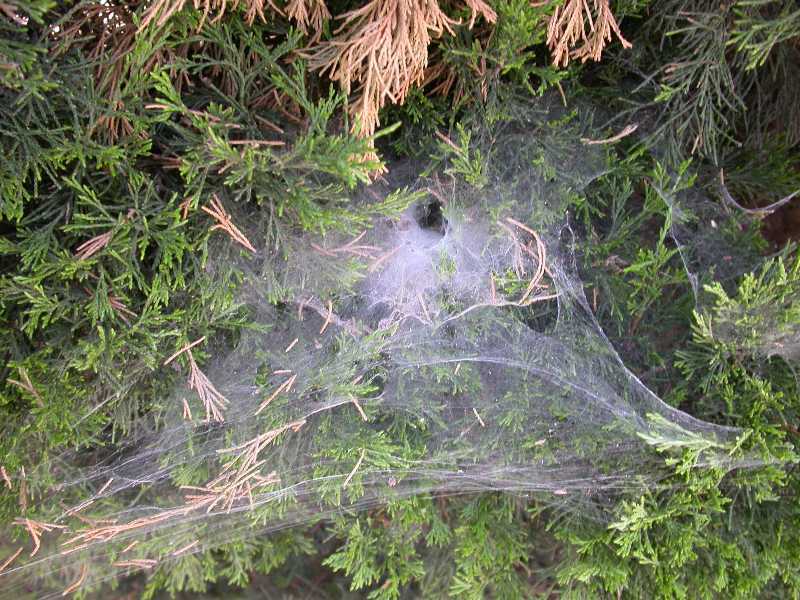 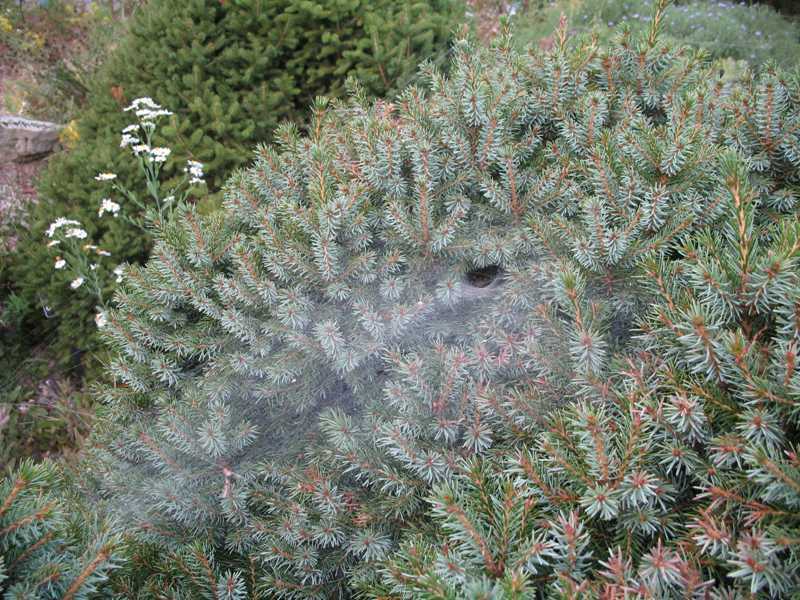 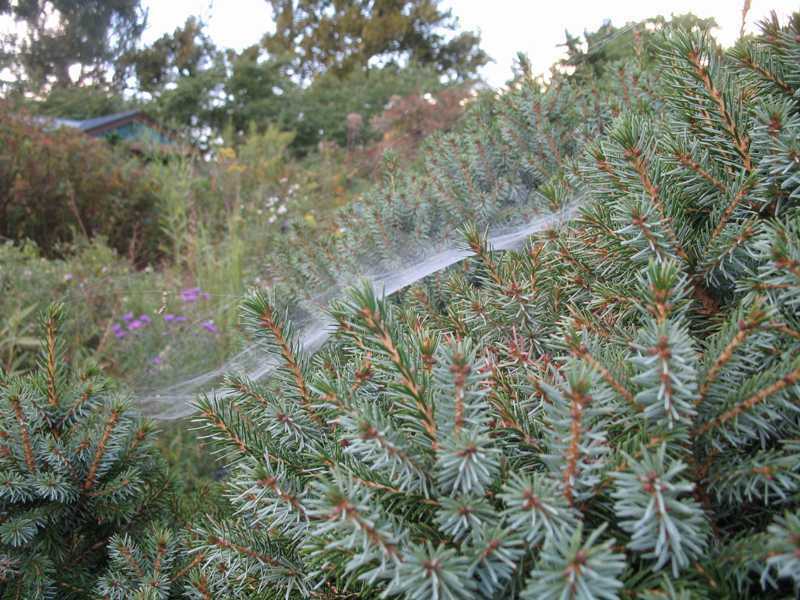 Here, only the web is visible on a spruce (Picea), but the spider's probable location is obvious. 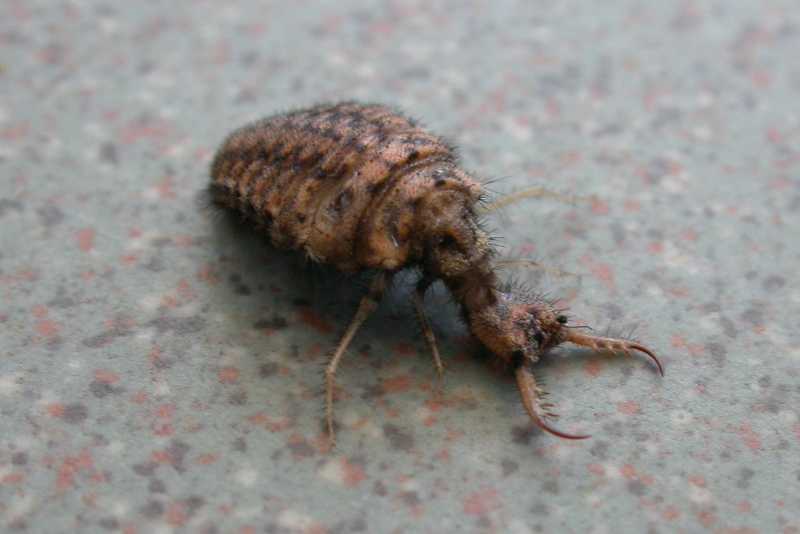 Antlions (Neuoptera) are the larvae of an insect related to lacewings. 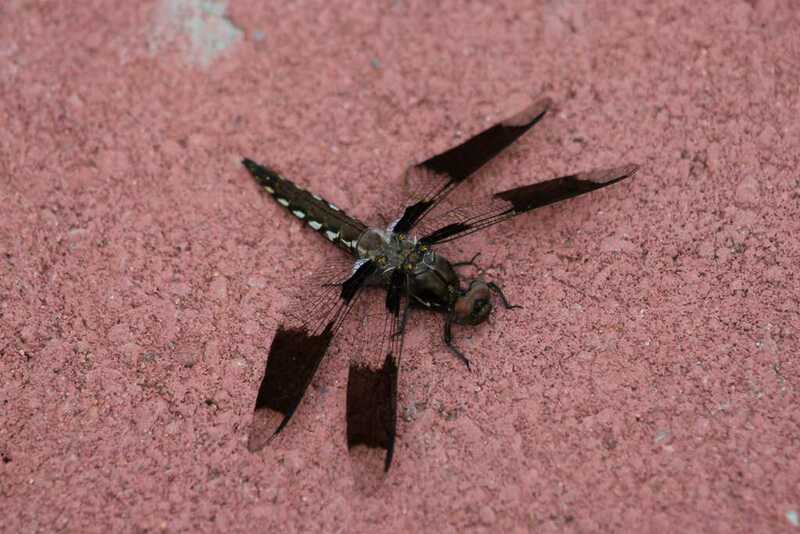 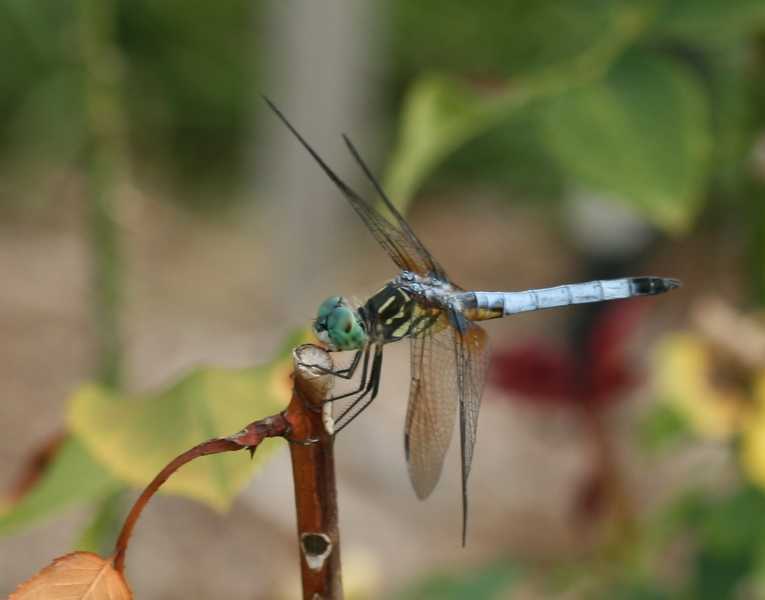 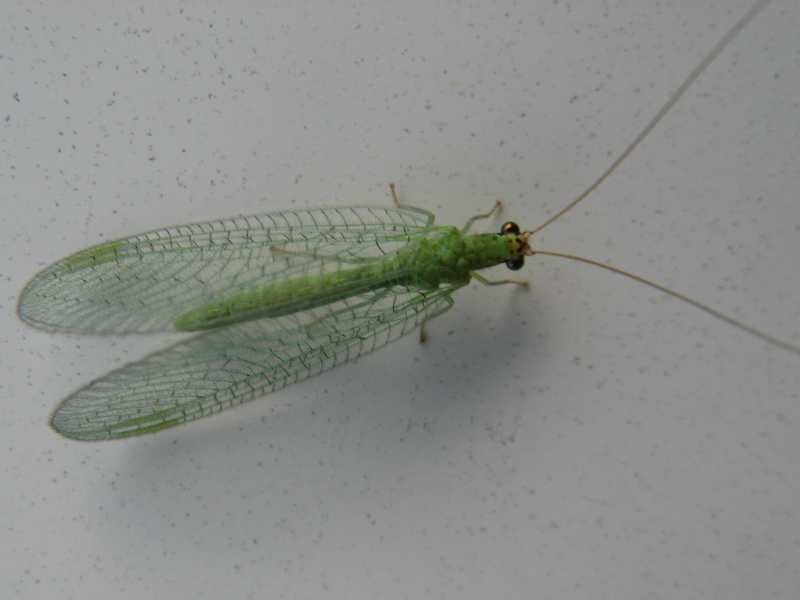 Like lacewing larvae, they are beneficial predators. 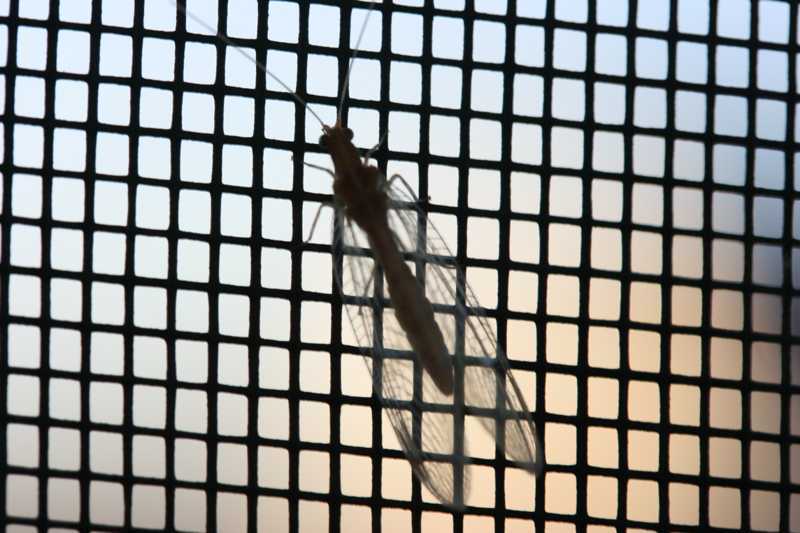 Antlions (Neuroptera) are voracious predators that lie in wait for their victims, usually under loose soil, although sometimes in trees. 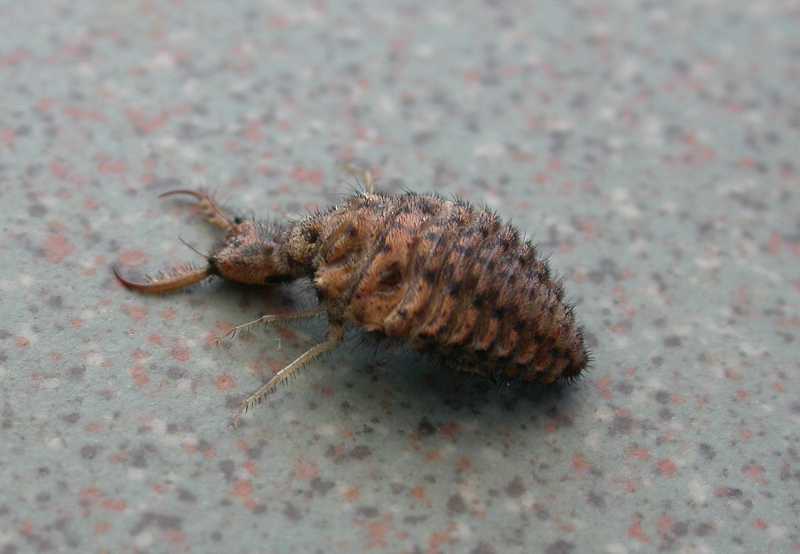 Some antlions called doodlebugs (Neuoroptera) dig a conical pit in loose sand to trap prey. 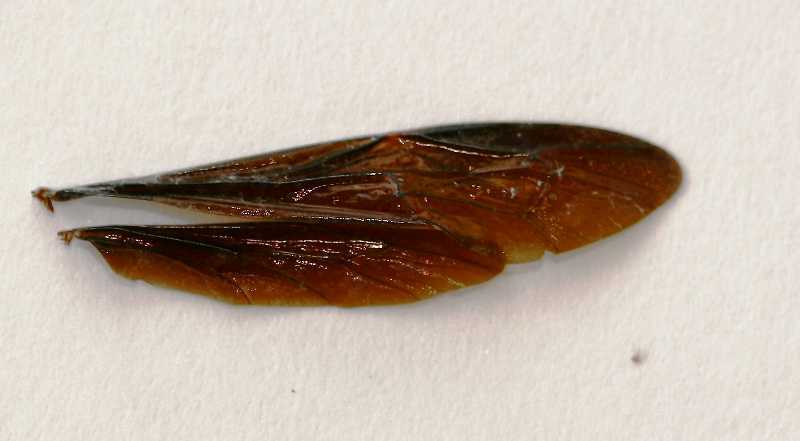 Note, the enornous mandibles on this specimen used to eat ants and other insects. 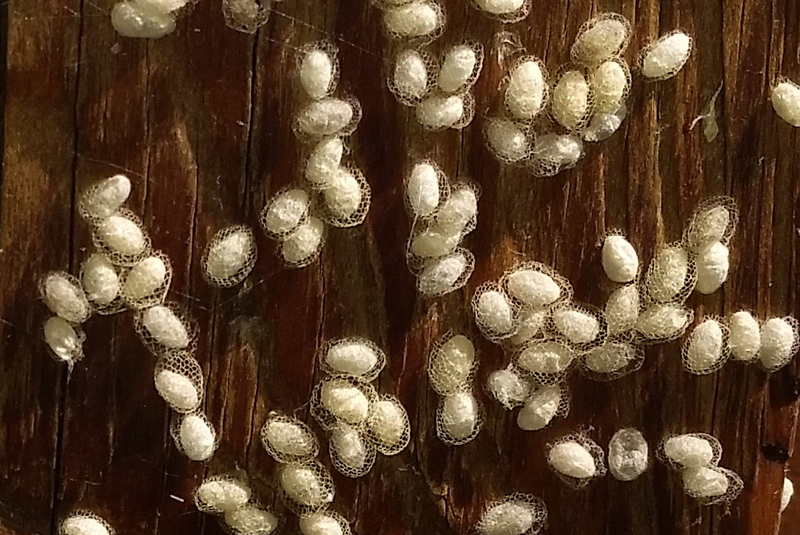 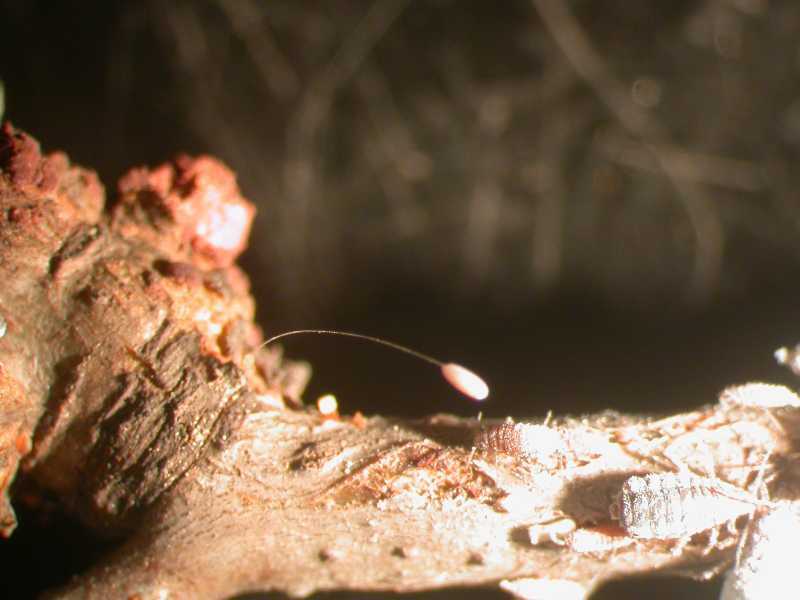 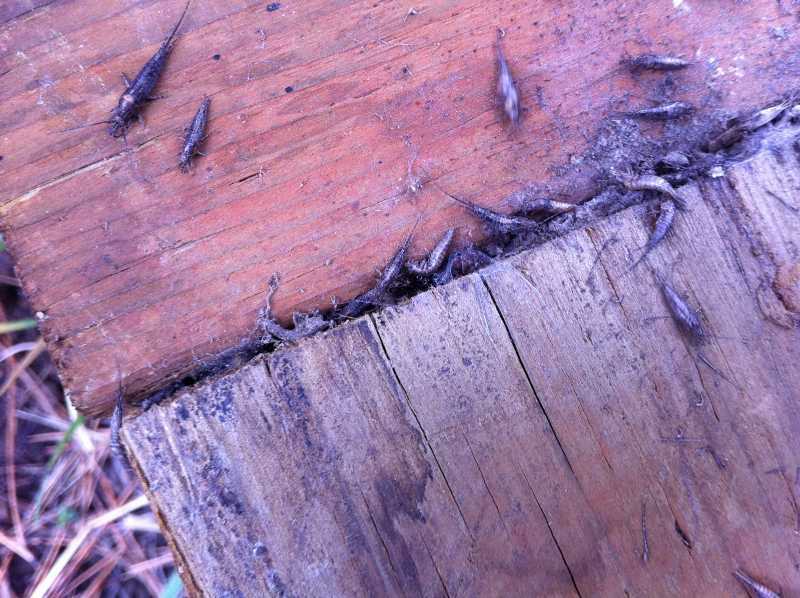 Some lacewing larvae (Neuroptera) stick the bodies of the victims to their backs, making them look like moving piles of debris. 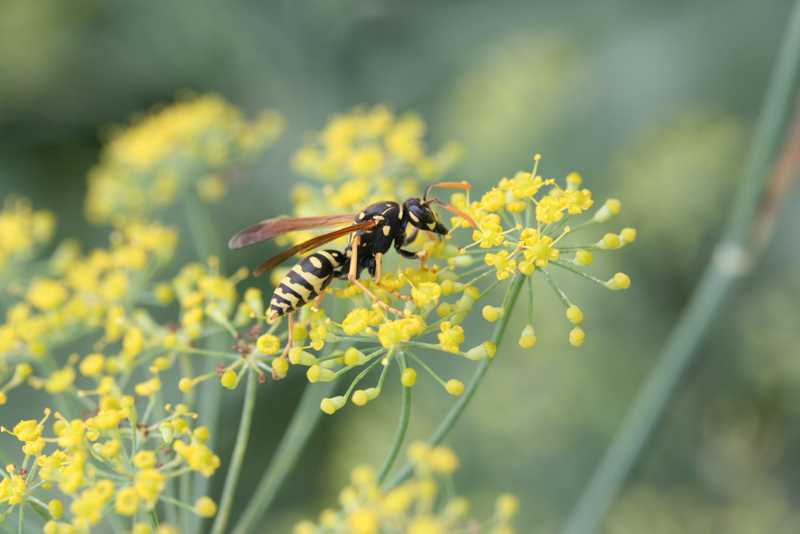 European paper wasp (Hymenoptera)--Polistes dominulus-- often mistaken for a yellow jacket, but note unique orange antennae. 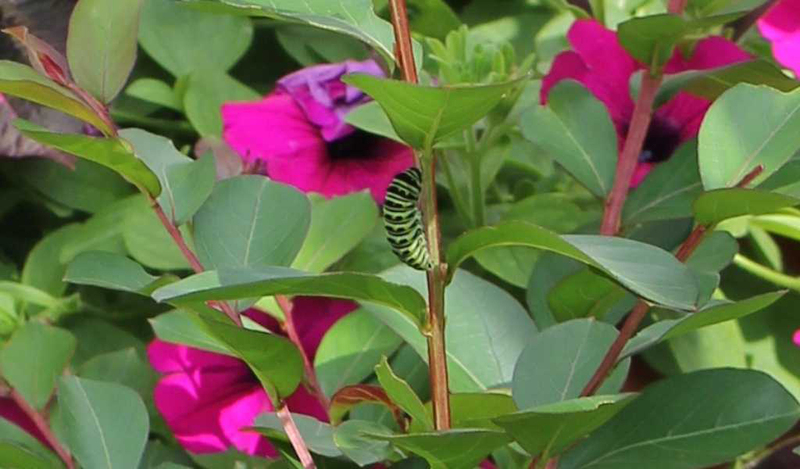 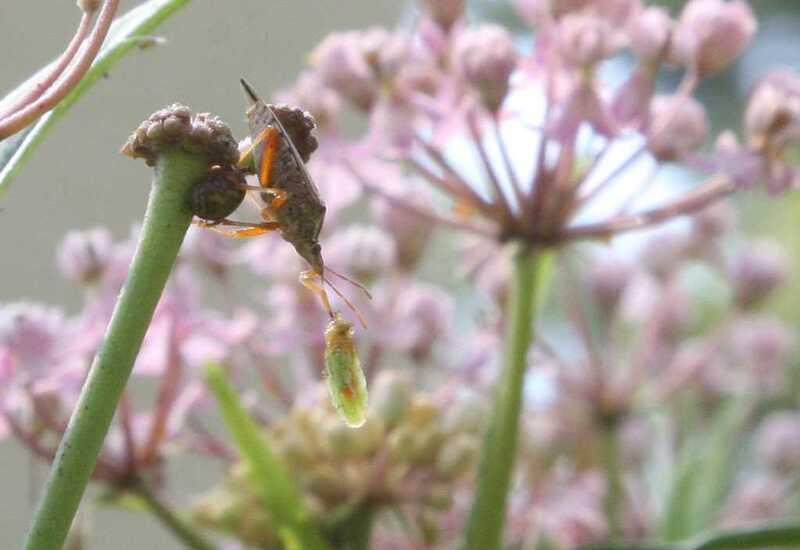 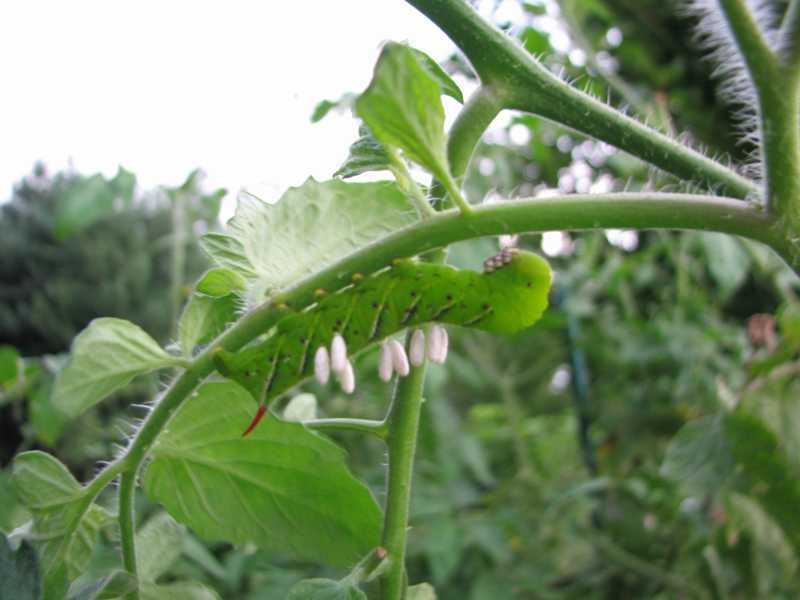 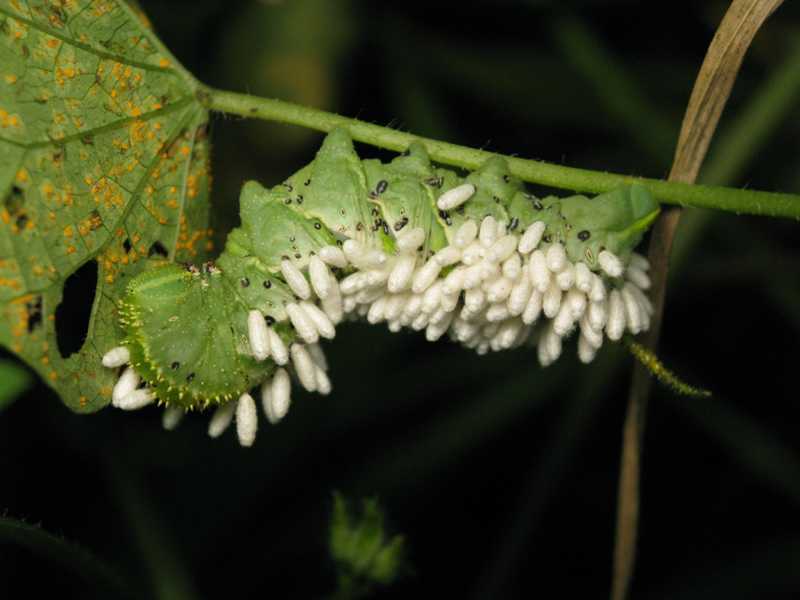 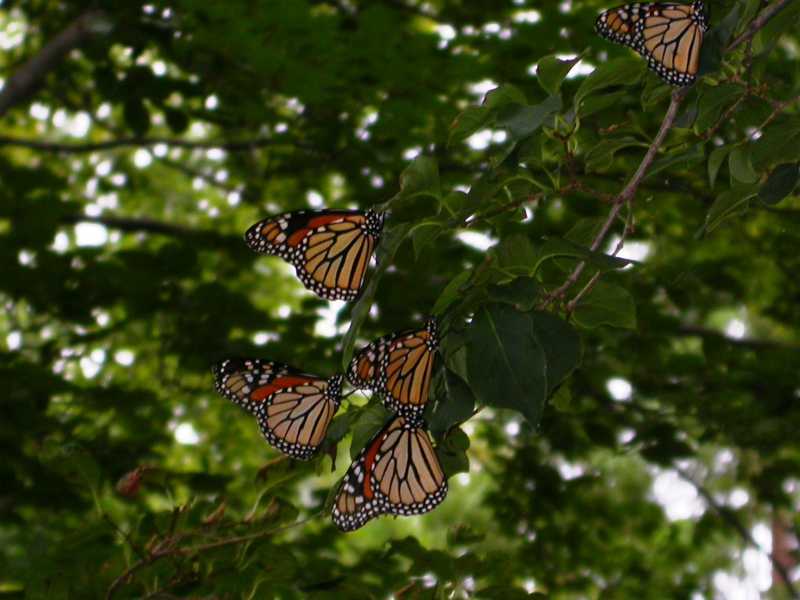 Adults feed on nectar; larvae are fed caterpillars and other insects. 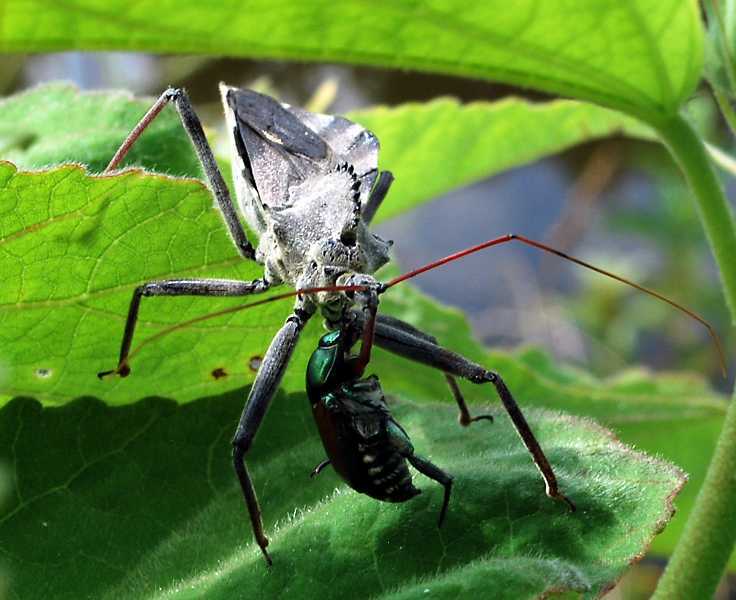 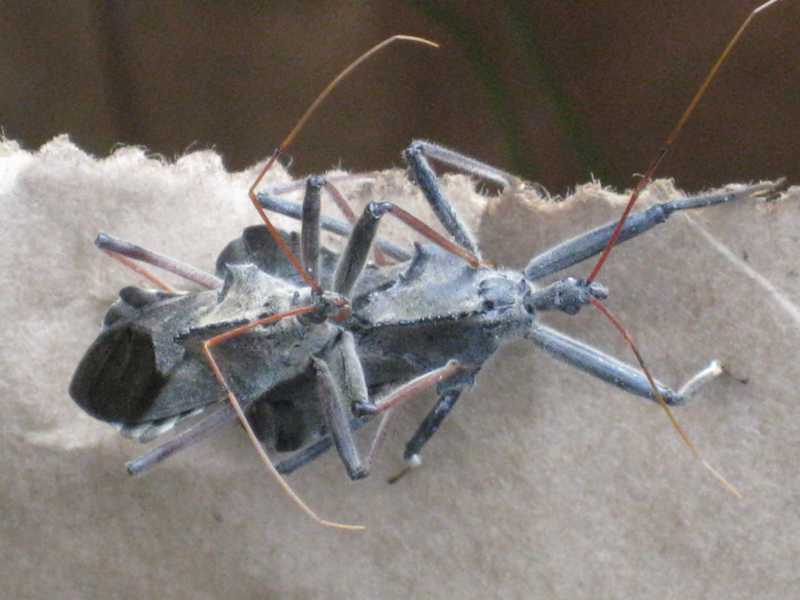 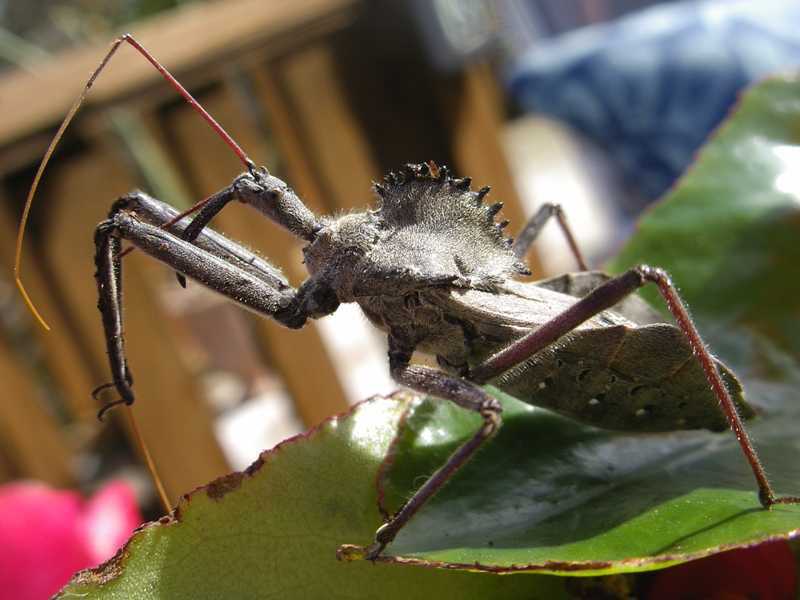 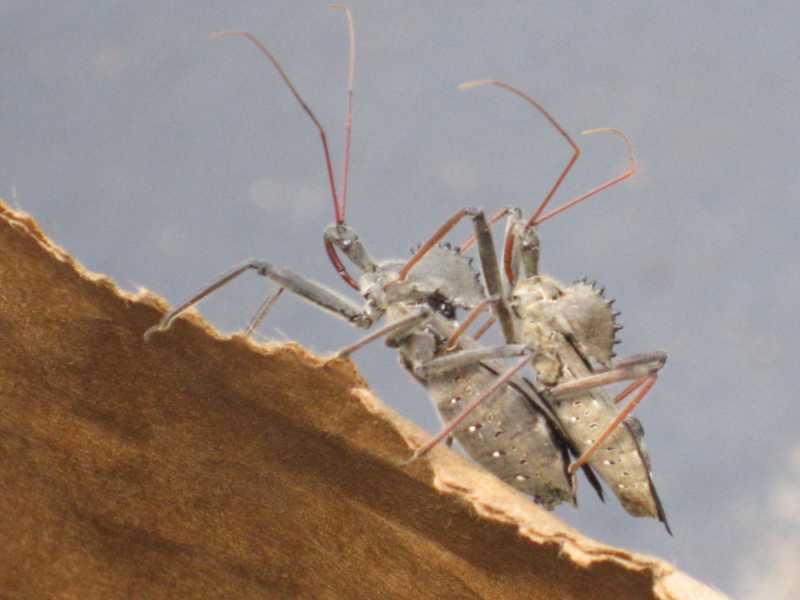 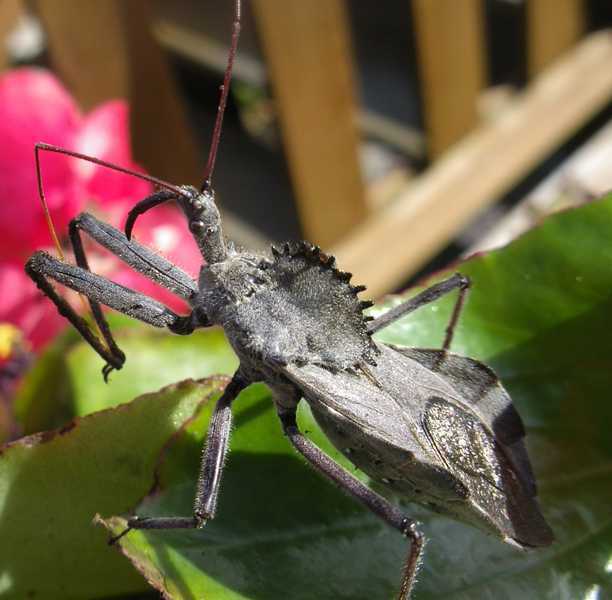 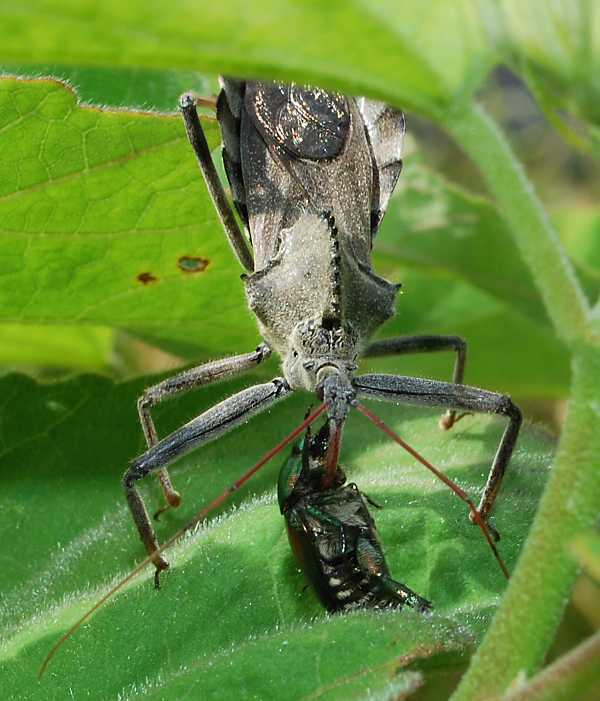 Wheel bugs (Hemiptera) mating; these are beneficial predators. 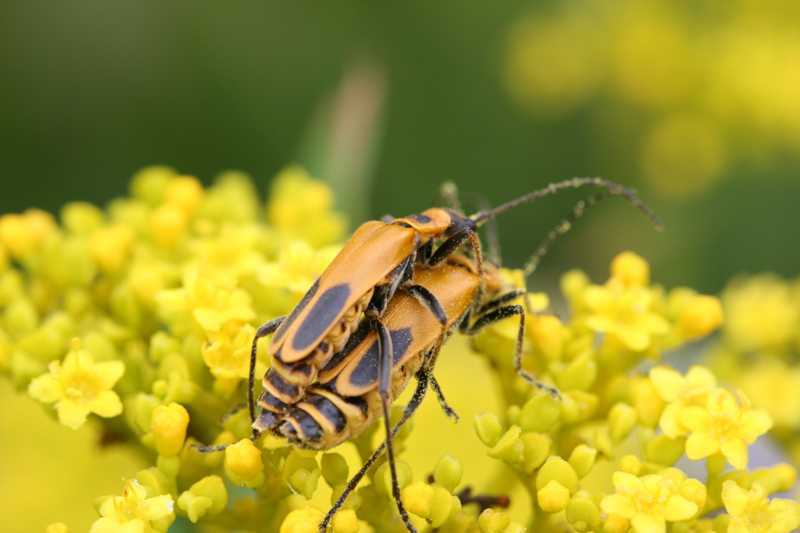 Soldier beetle adults (Coleoptera) mating; aka leatherwings. 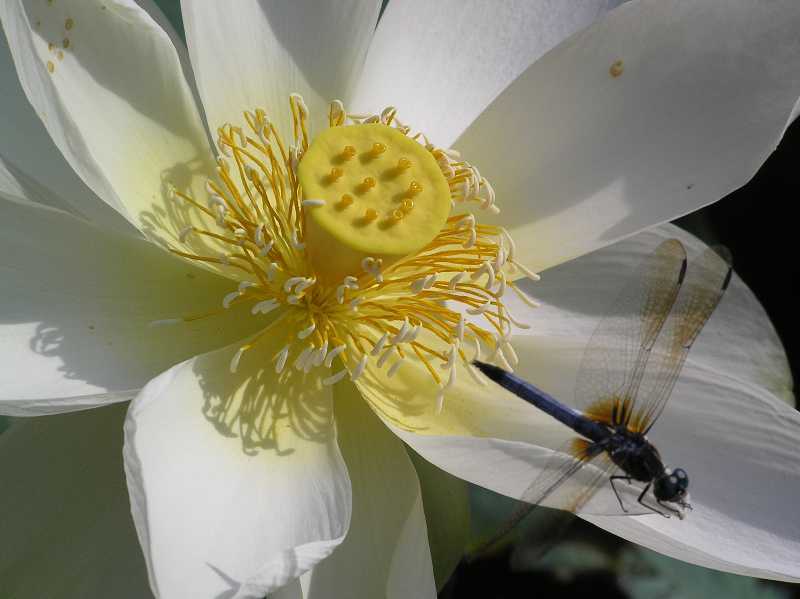 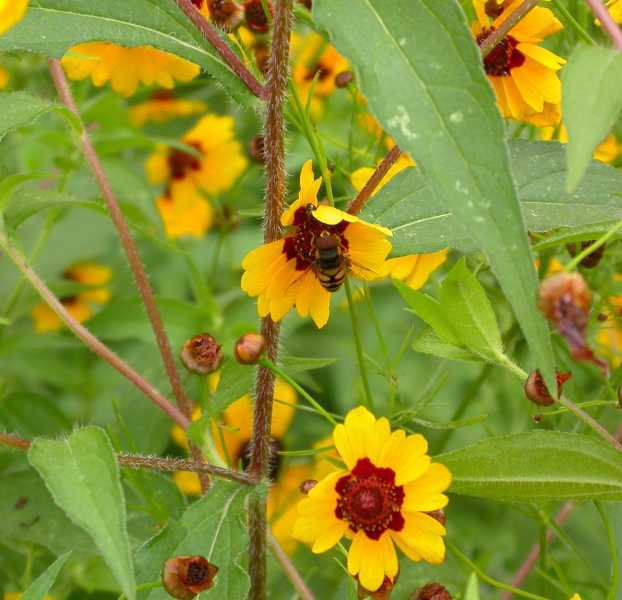 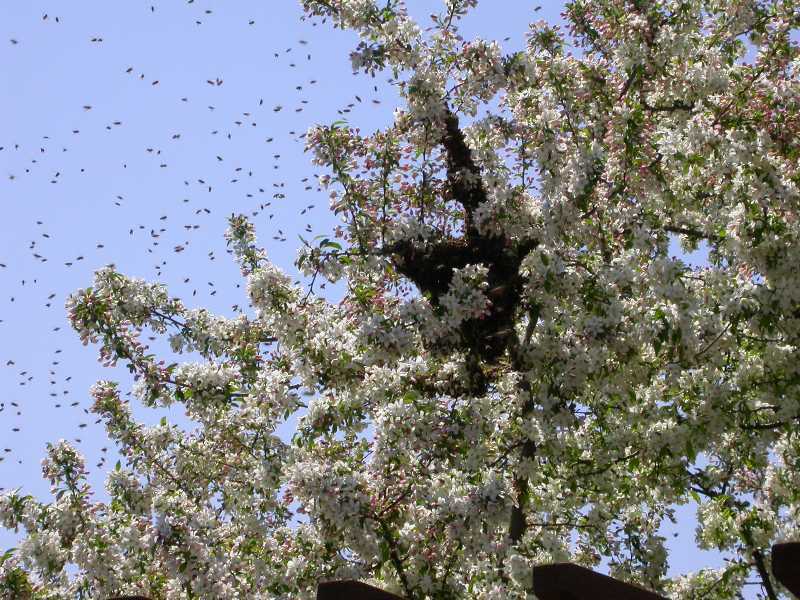 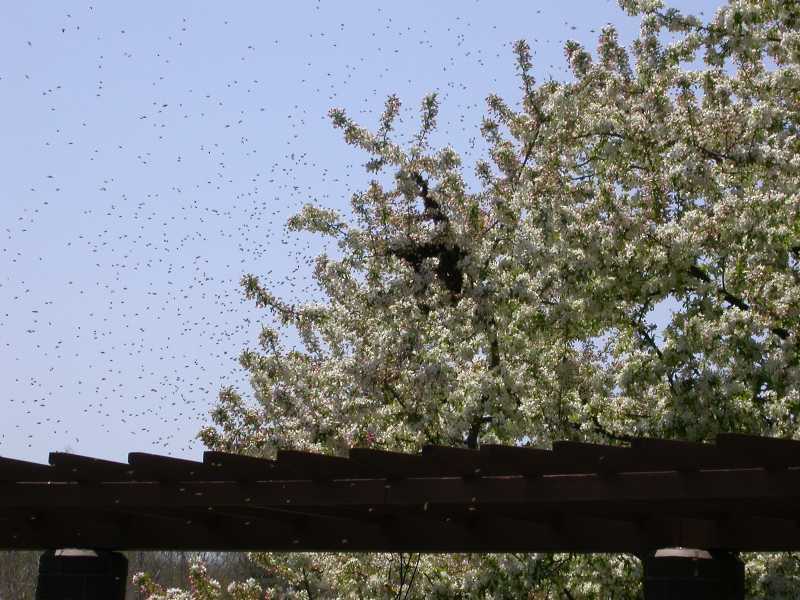 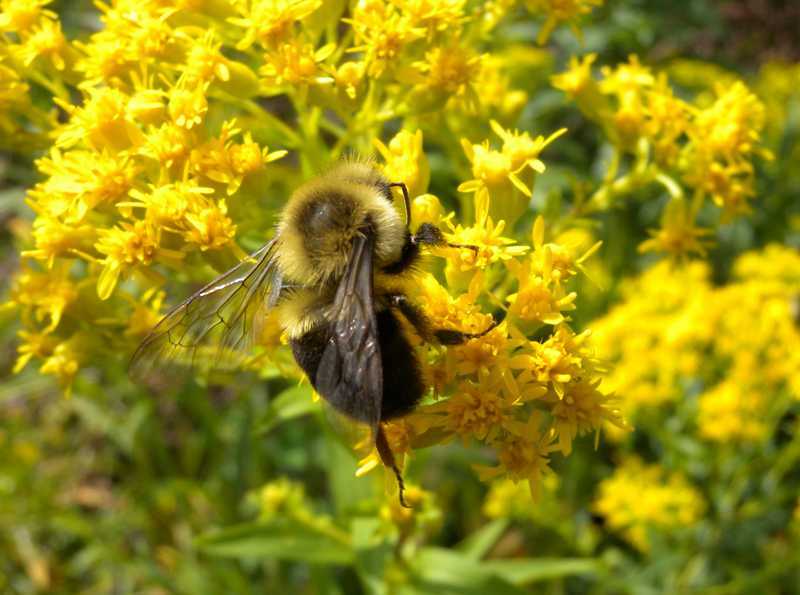 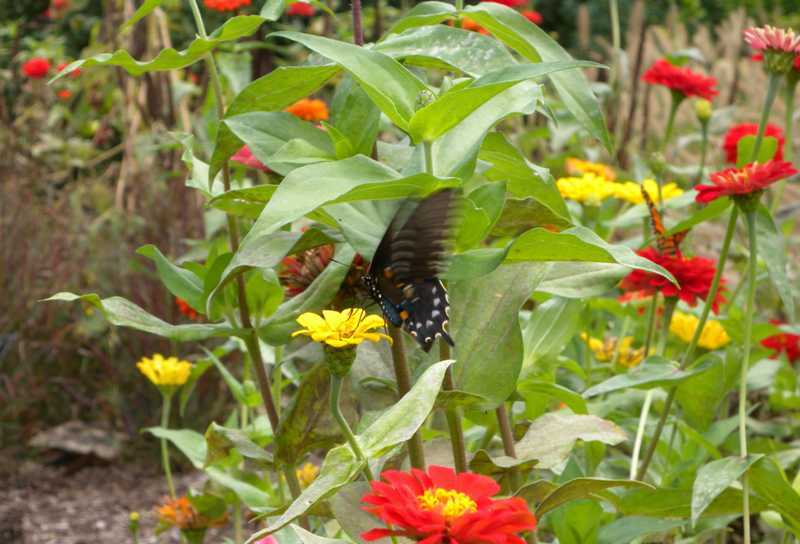 The adults eat pollen or nectar; the larvae are beneficial predators. 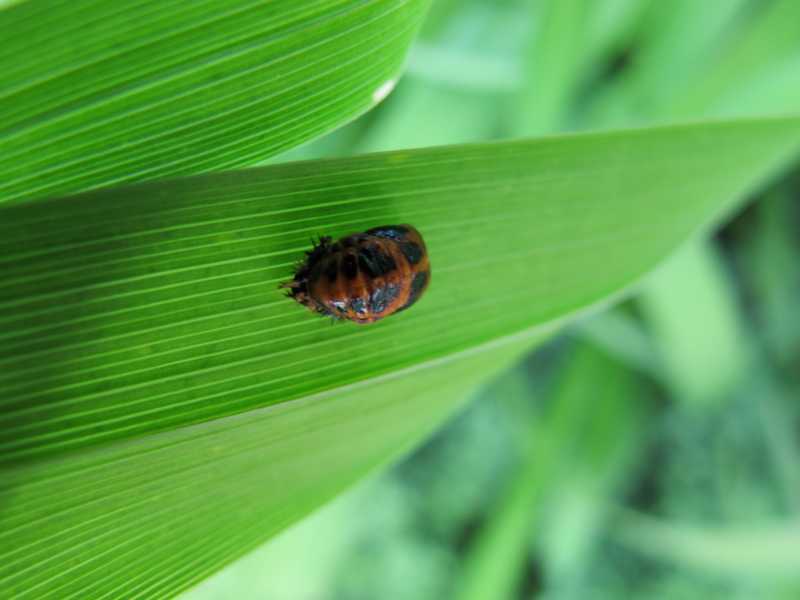 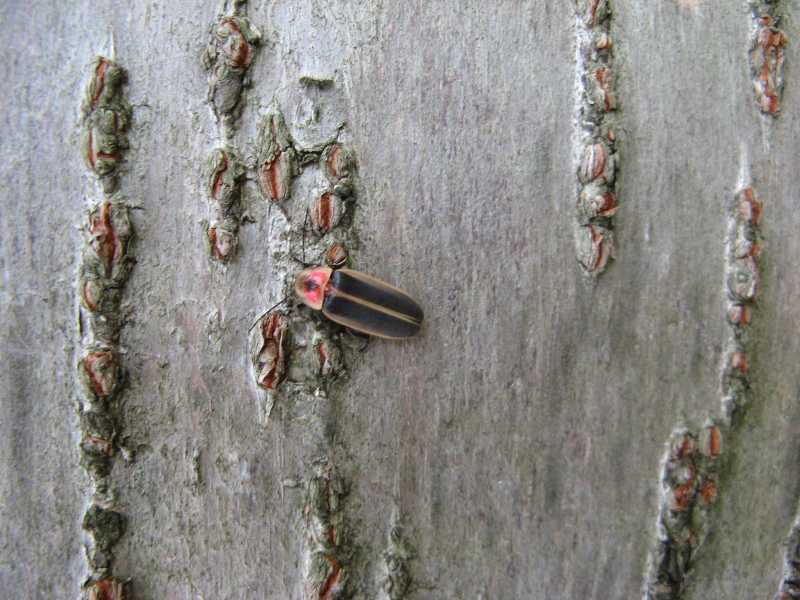 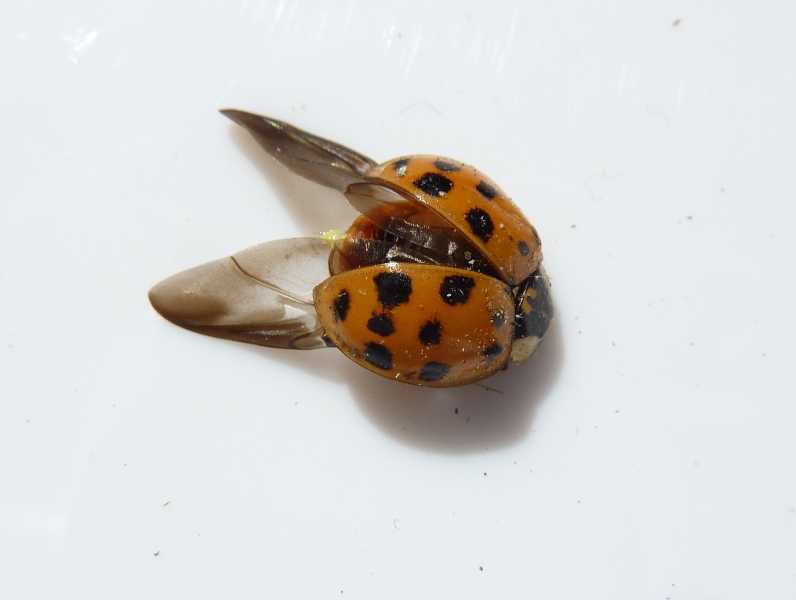 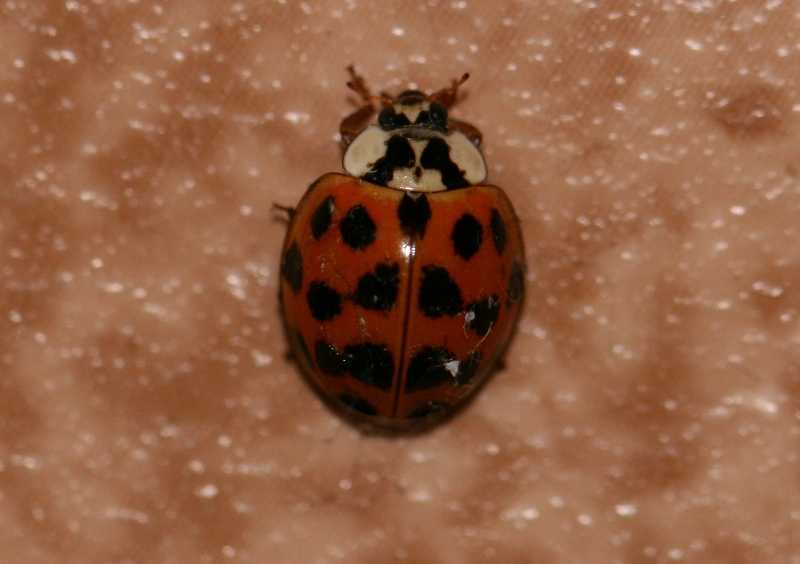 Like all beetles, multicolored Asian lady beetles are in the order Coleoptera which means sheath wings, and here's why: The hindwings are folded and hidden (or sheathed like a sword) beneath the hard forewings. 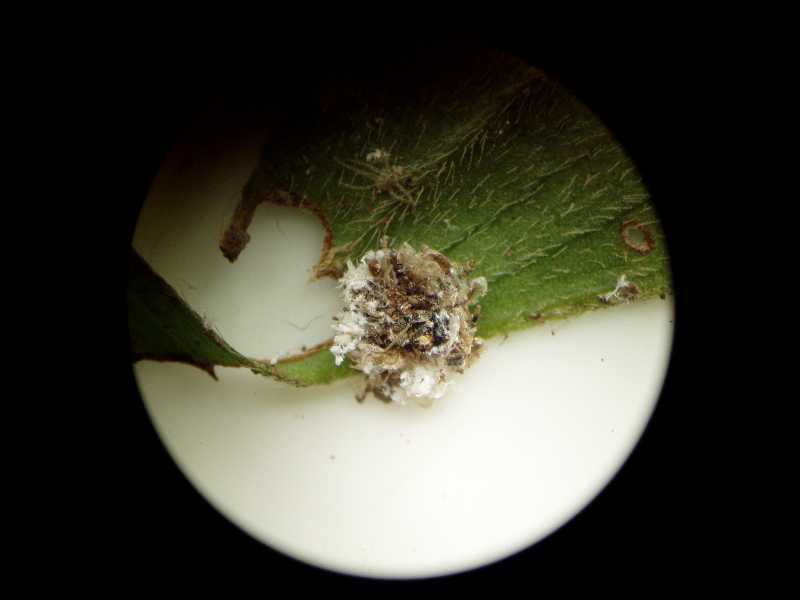 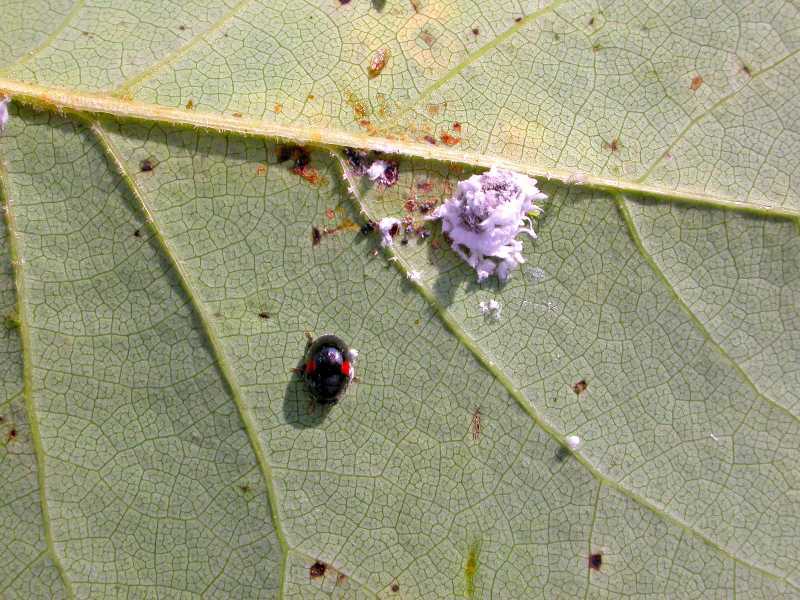 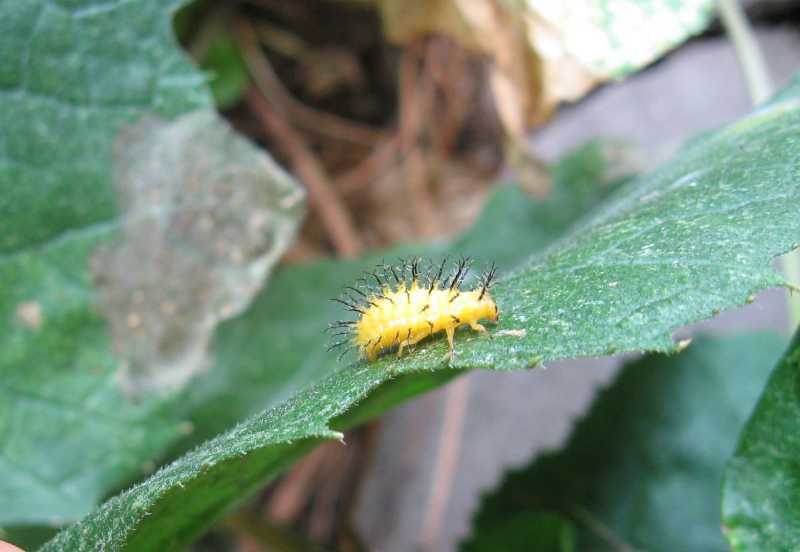 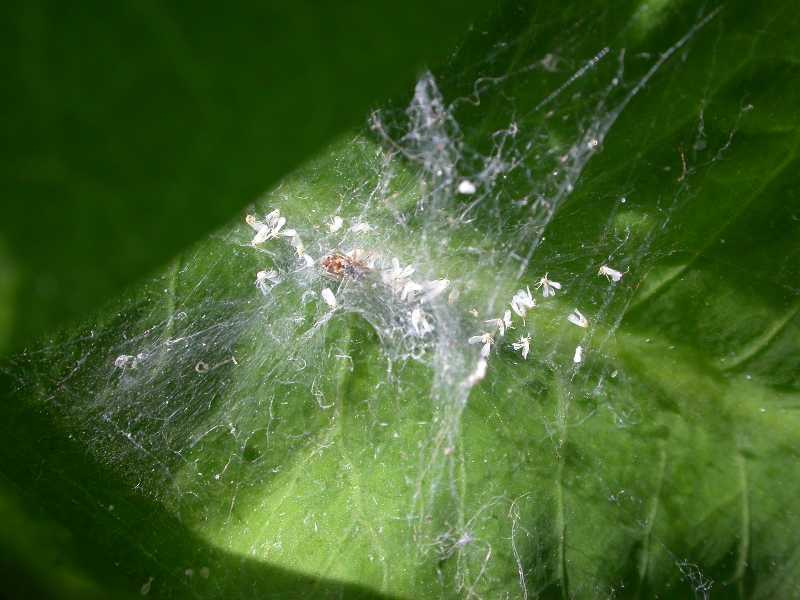 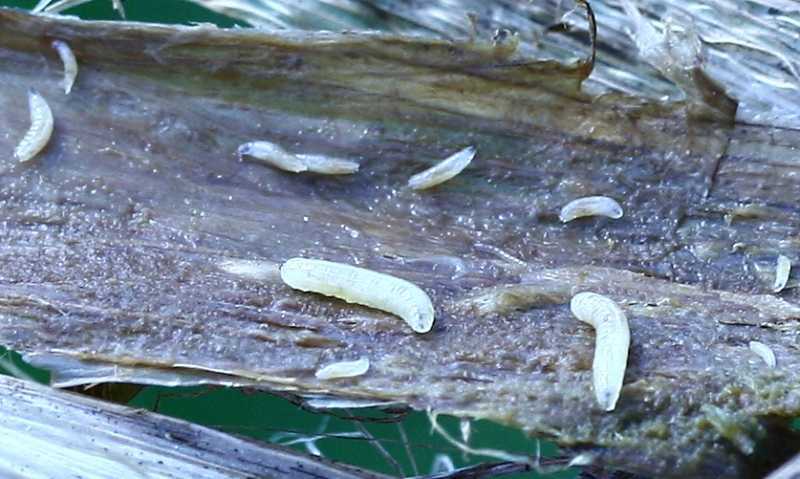 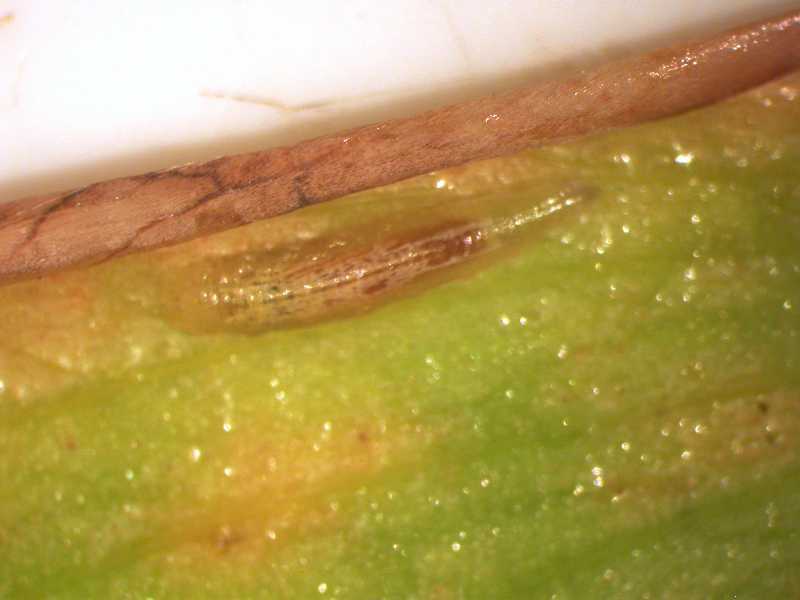 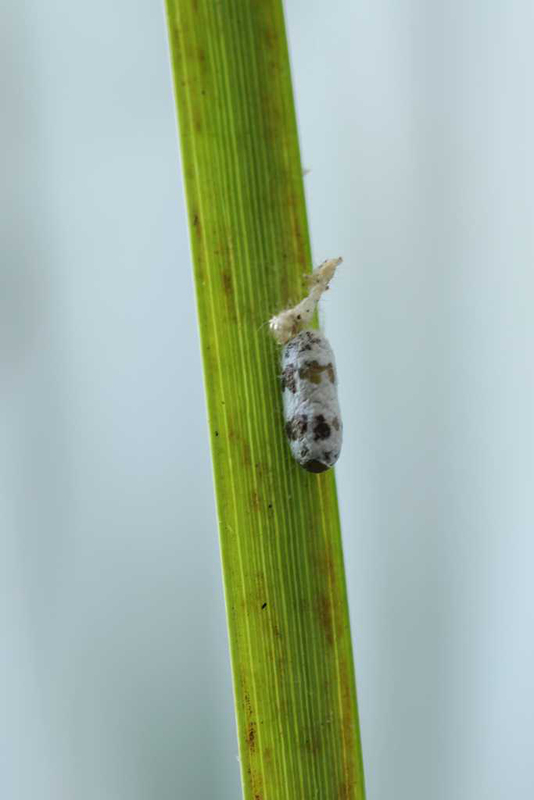 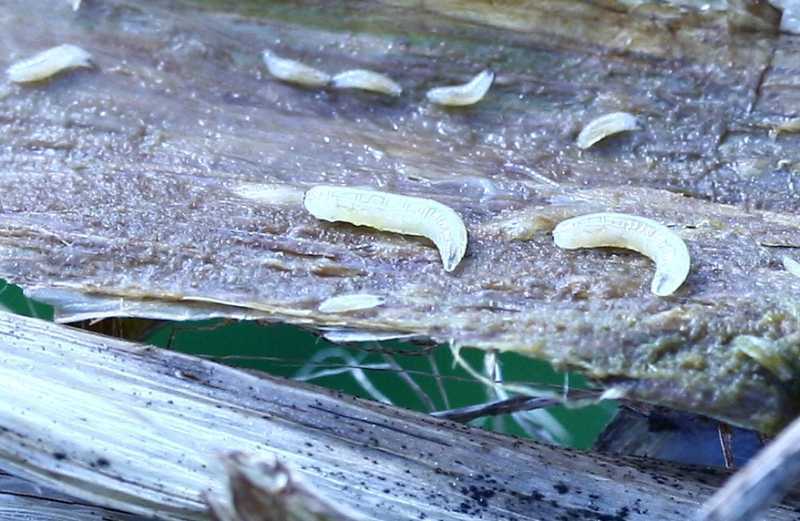 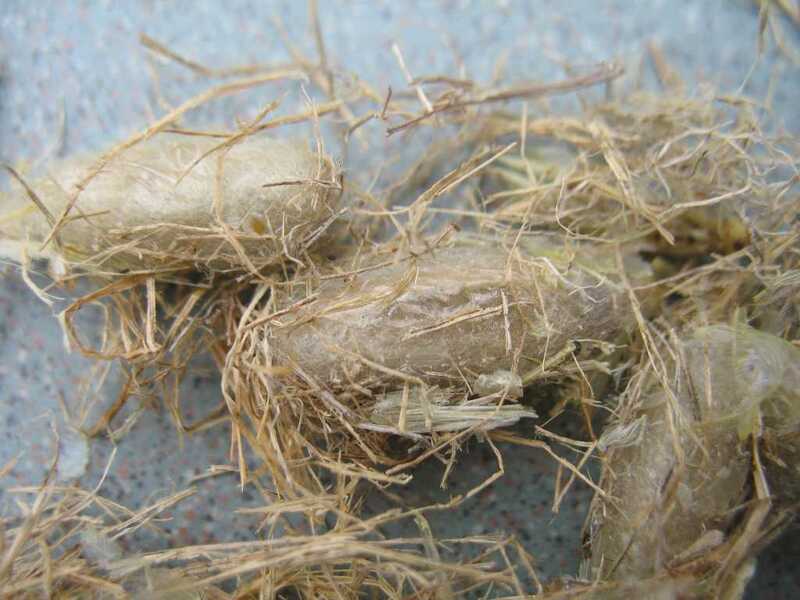 Maggots or fly larvae (Diptera), here found inside decaying daylily foliage (Hemerocallis), are important in the decomposition of dead plants and animals. 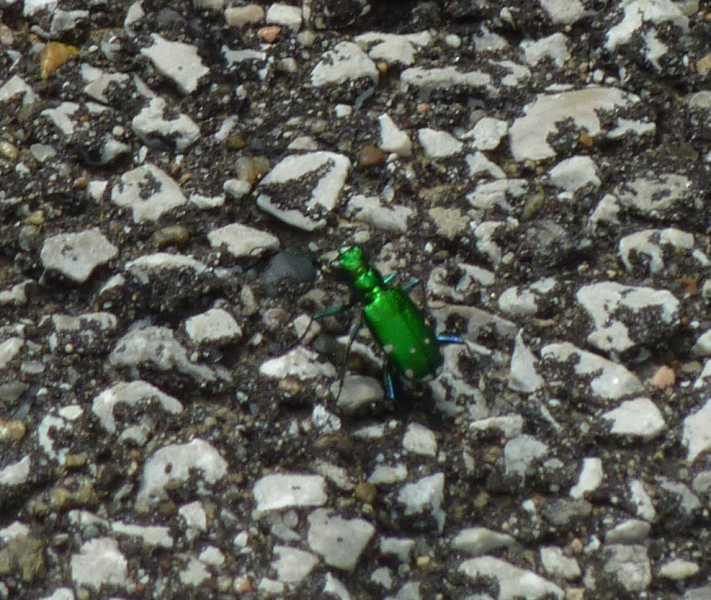 Six-spotted tiger beetle (Coleoptera), Cicindela sexguttata. 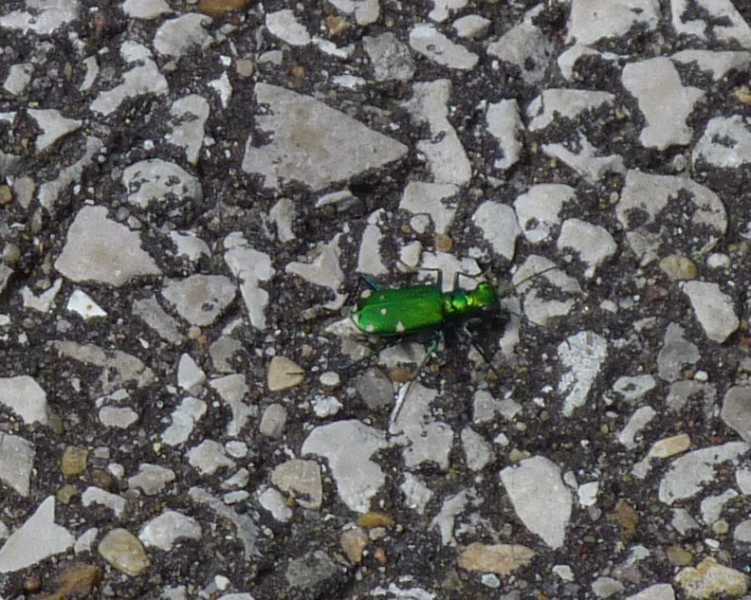 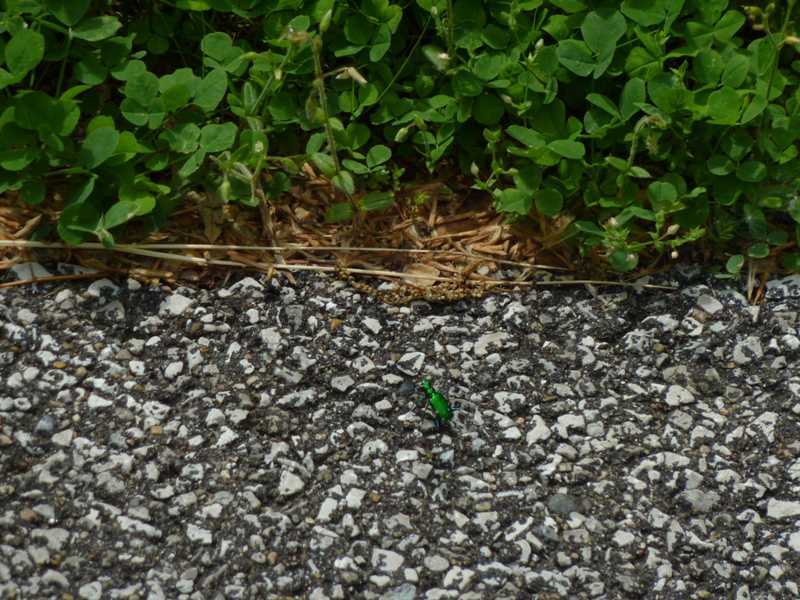 This metallic green beetle could be mistaken for an emerald ash borer, but this beetle is a beneficial predator. 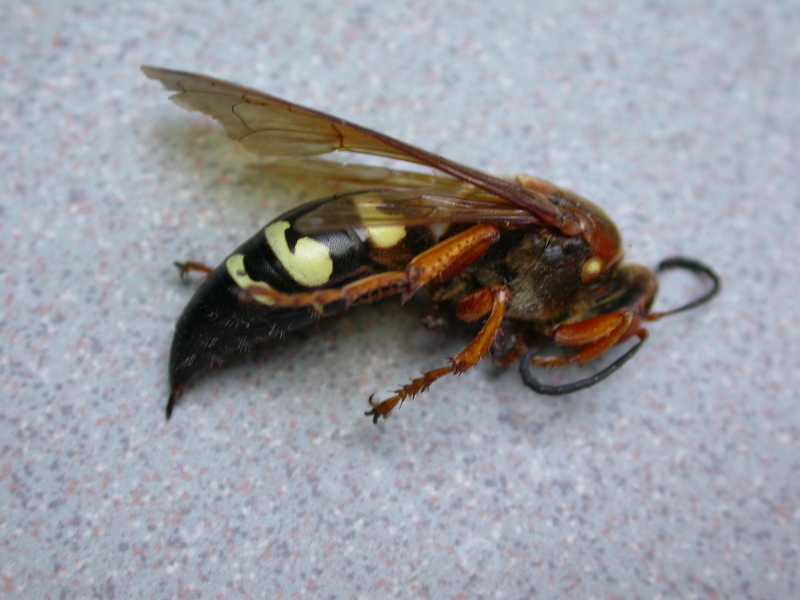 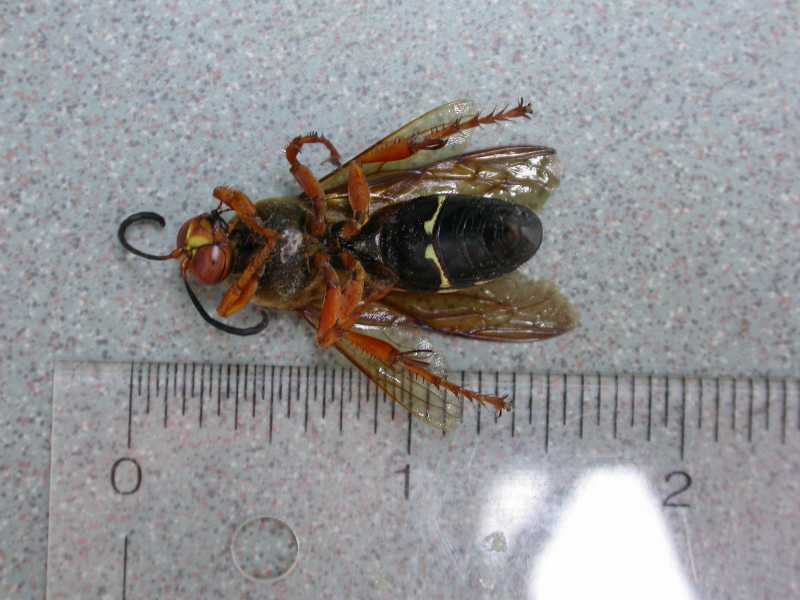 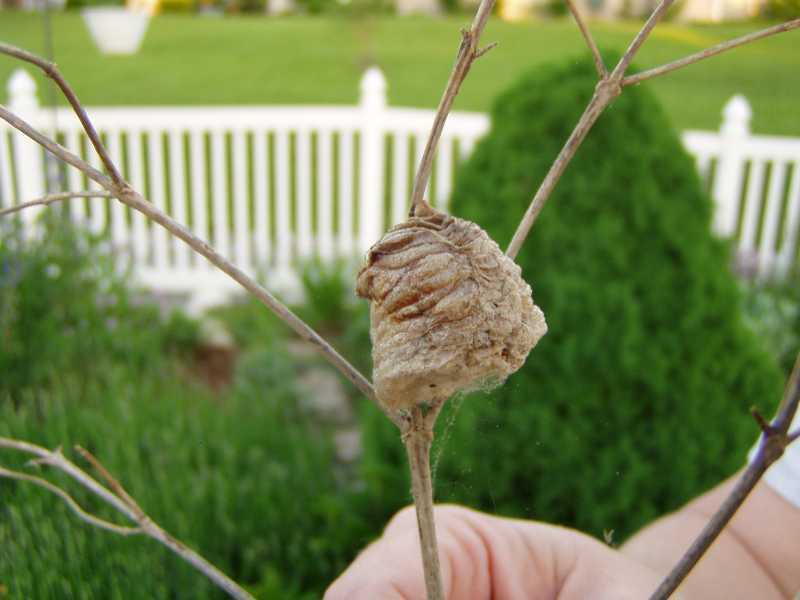 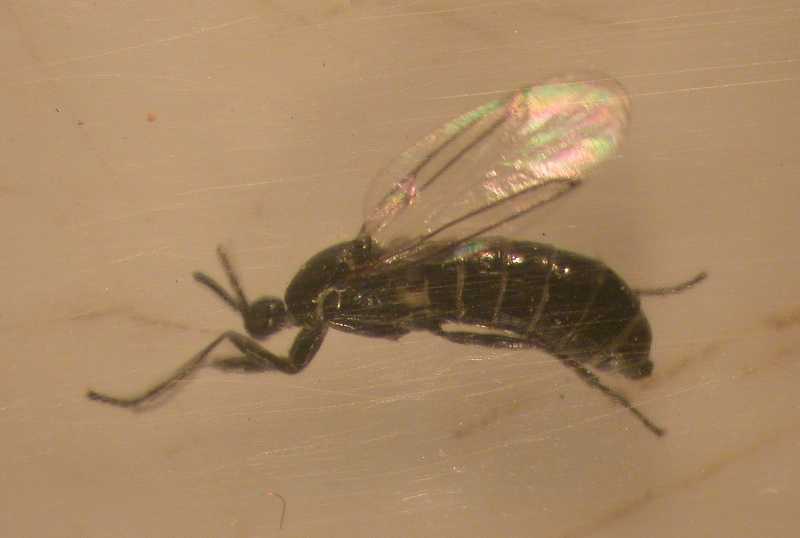 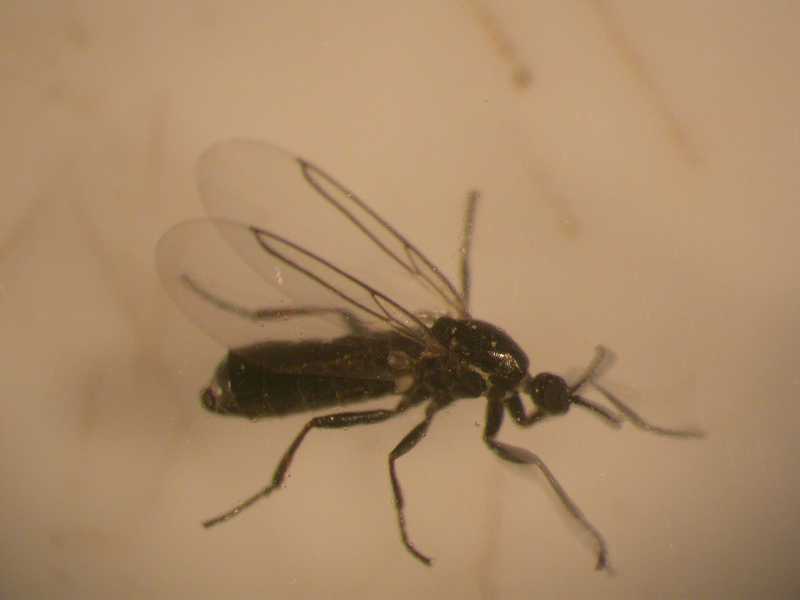 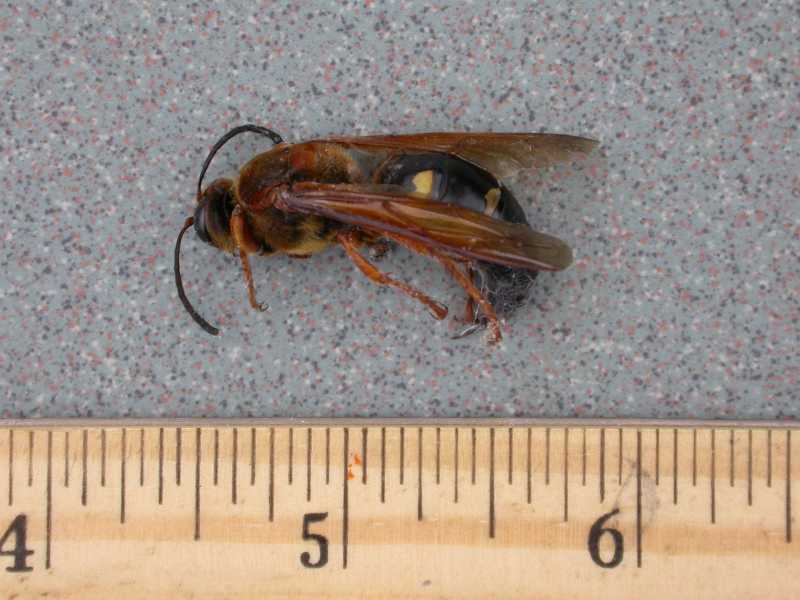 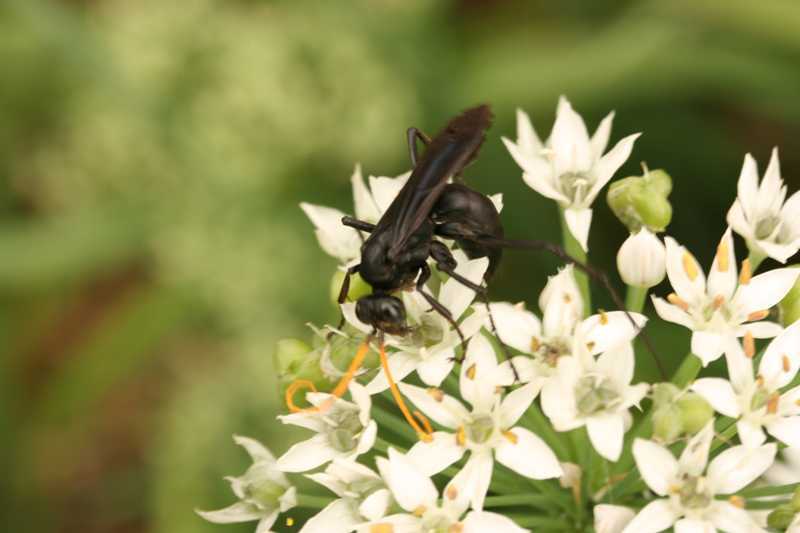 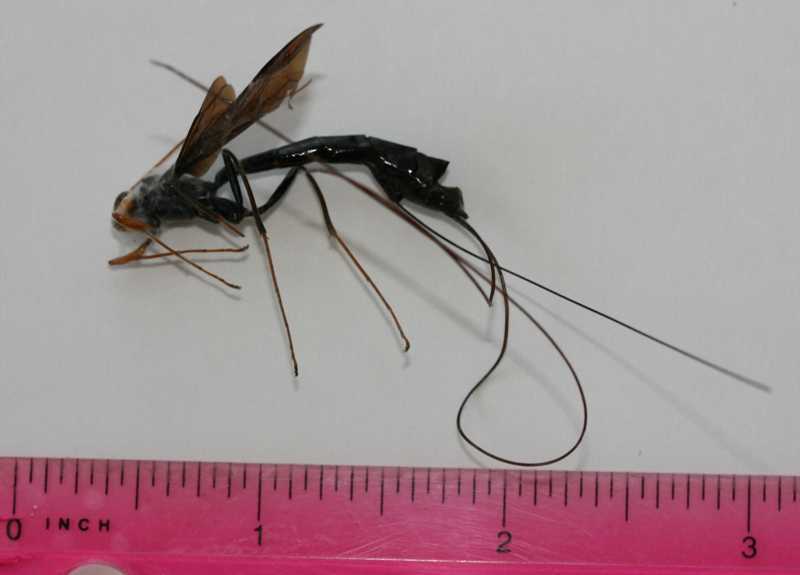 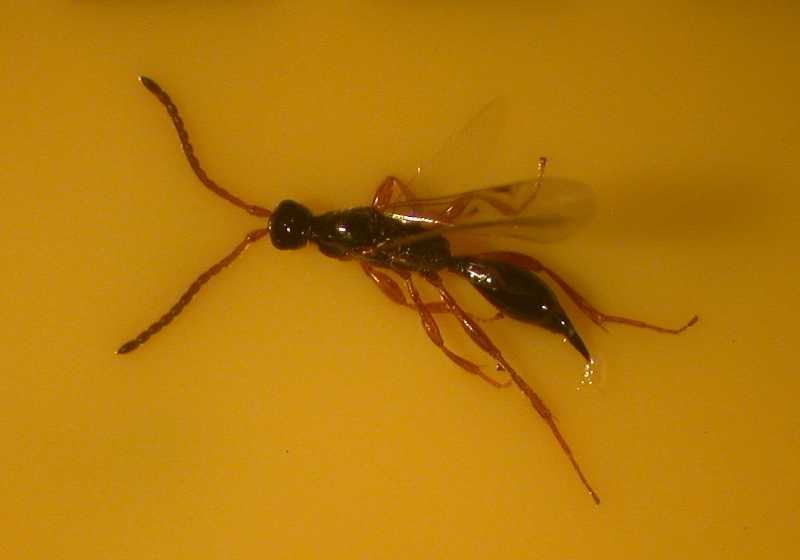 Potter wasps (Hymenoptera) rarely sting and are predators of caterpillars and beetle larvae, which they catch and then paralyze for their own larvae to feed on. 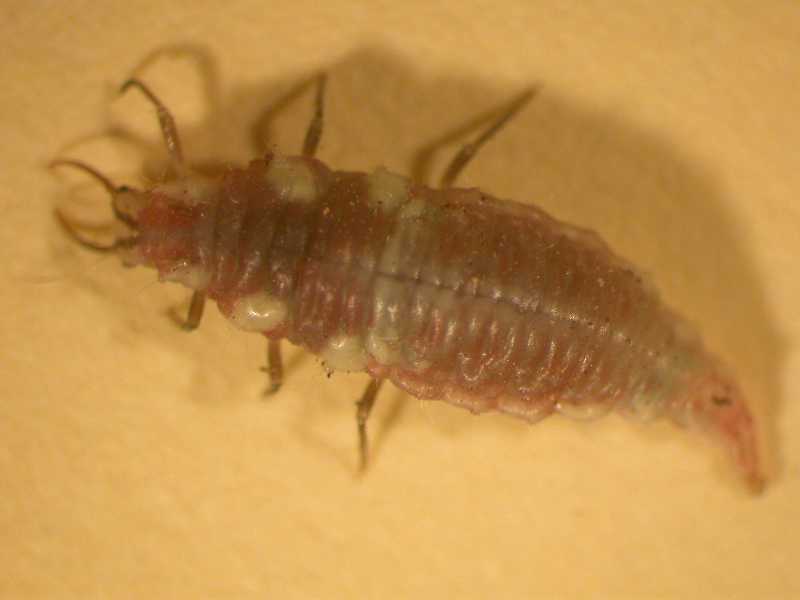 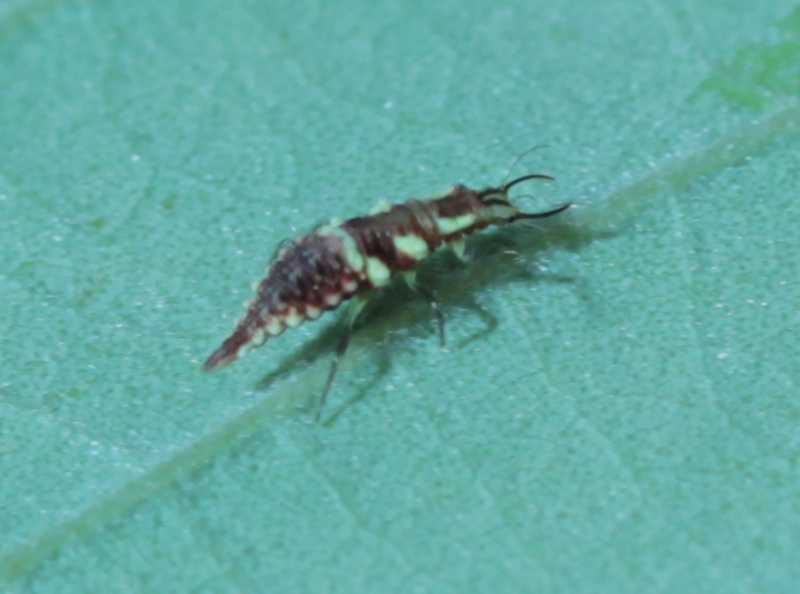 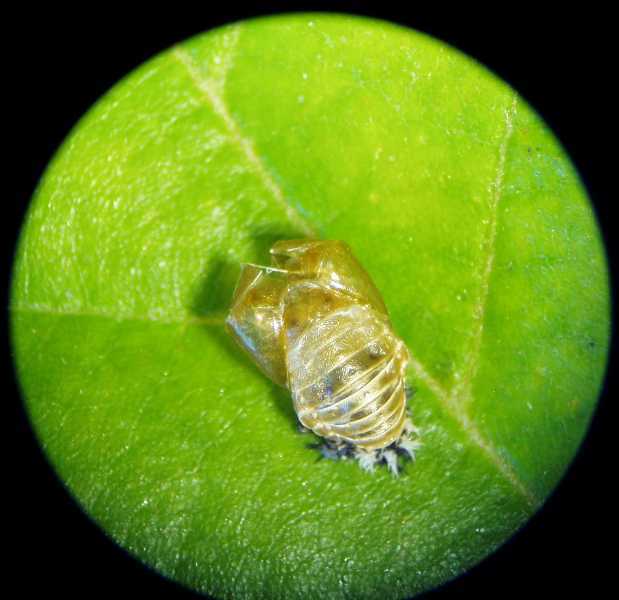 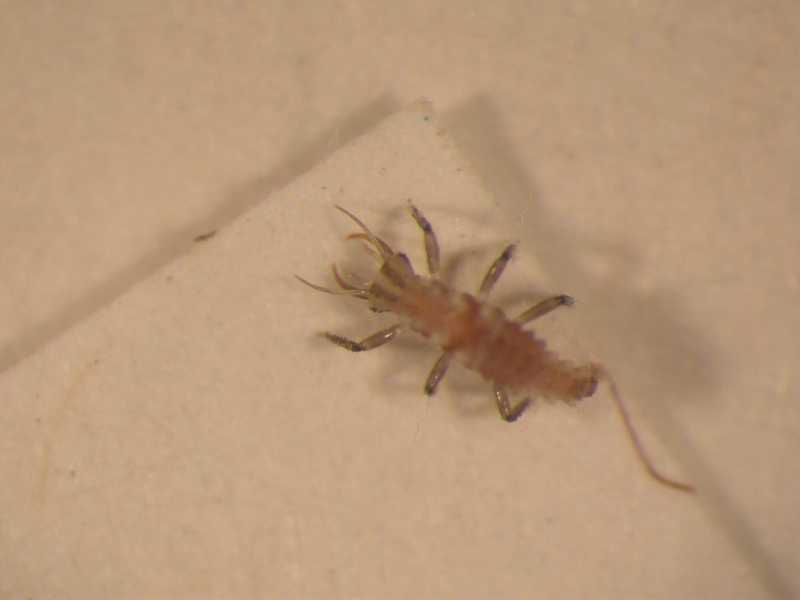 Lacewing larva (Neuroptera) looking for prey. 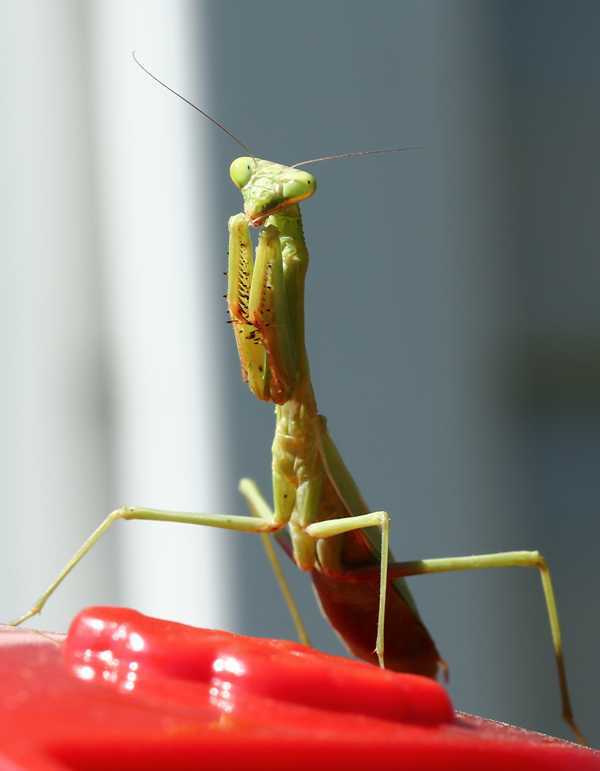 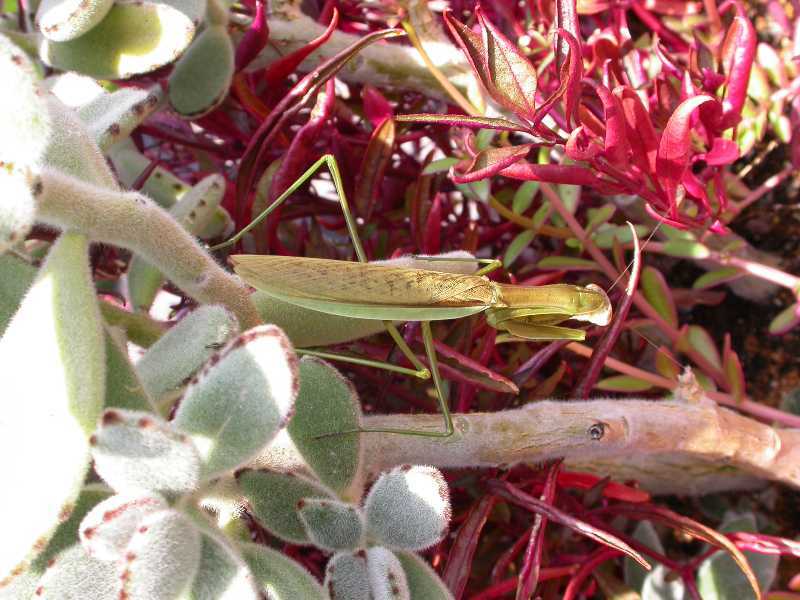 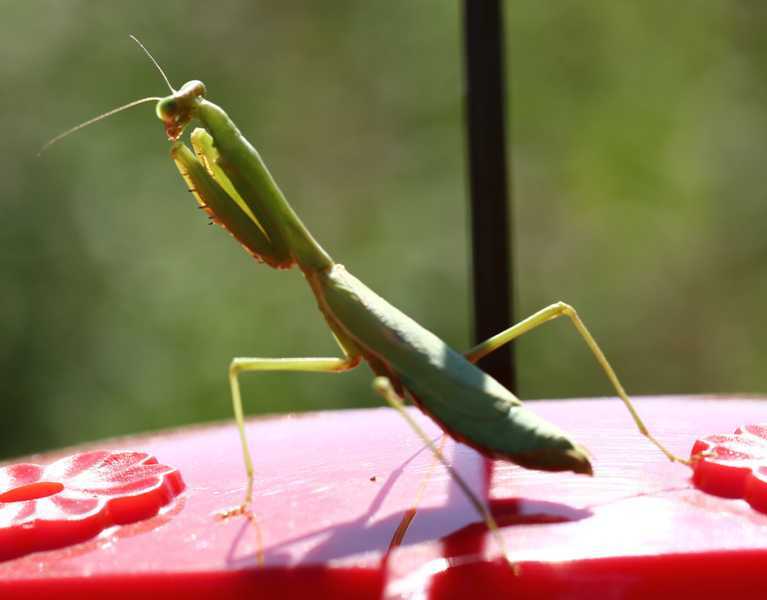 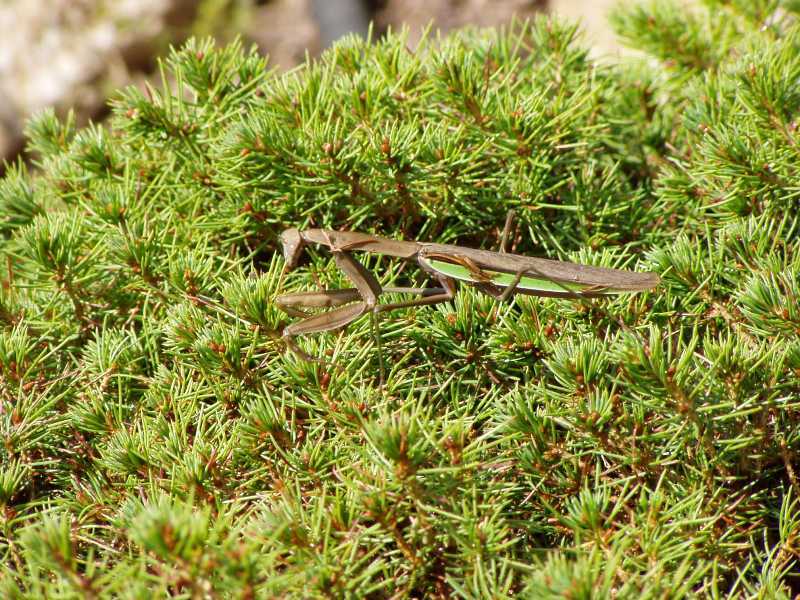 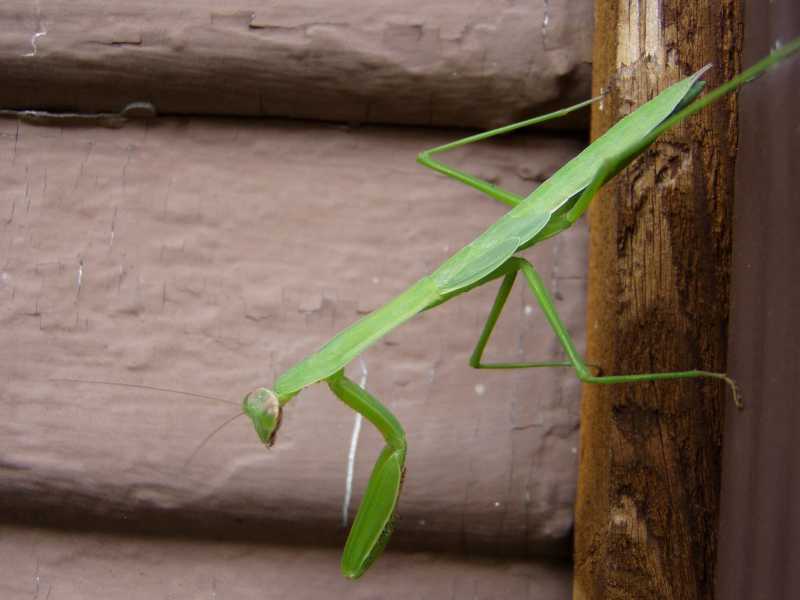 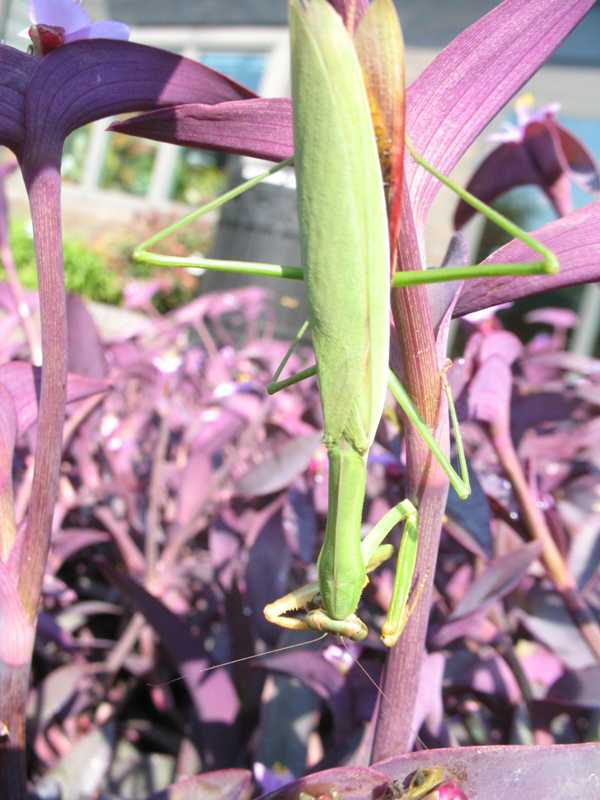 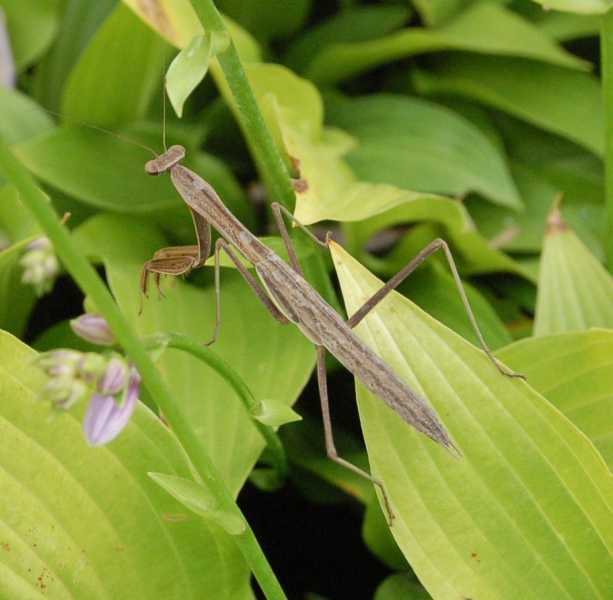 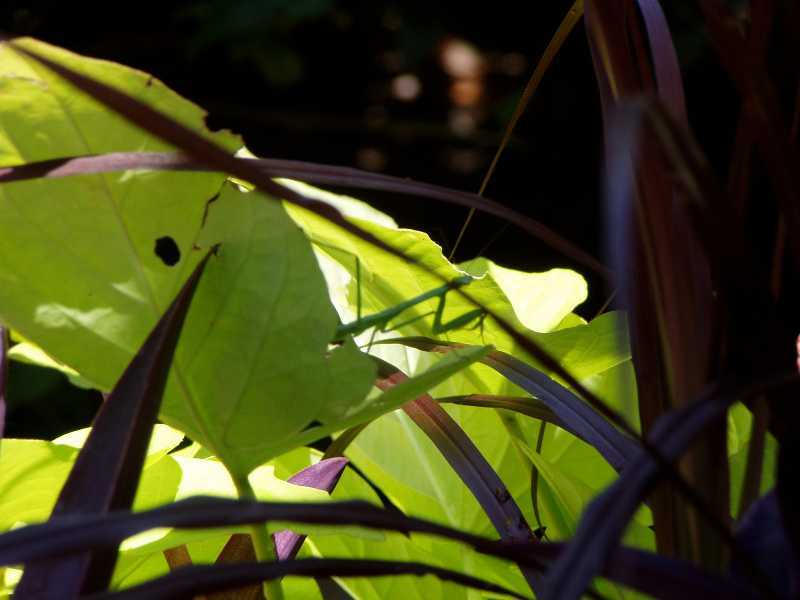 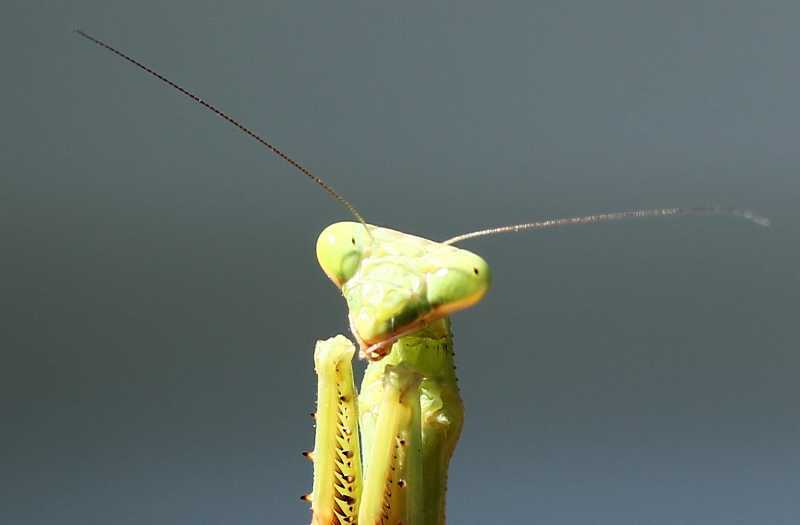 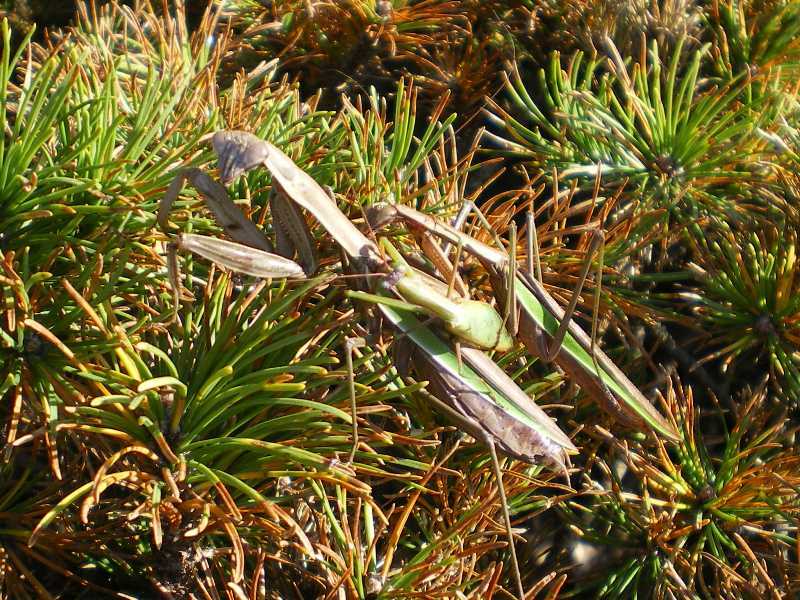 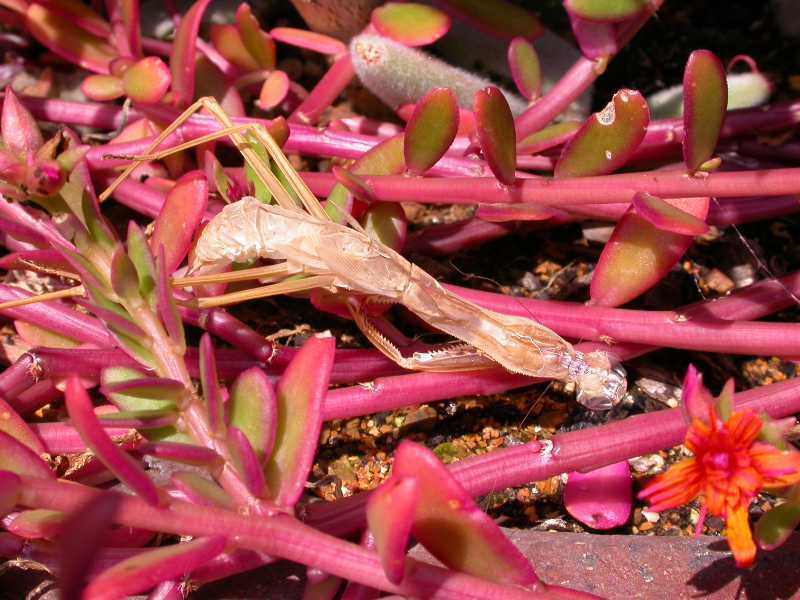 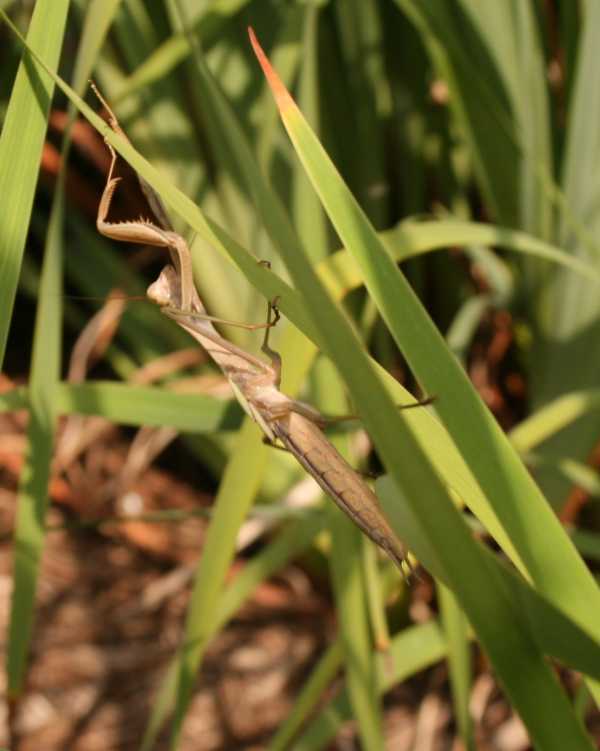 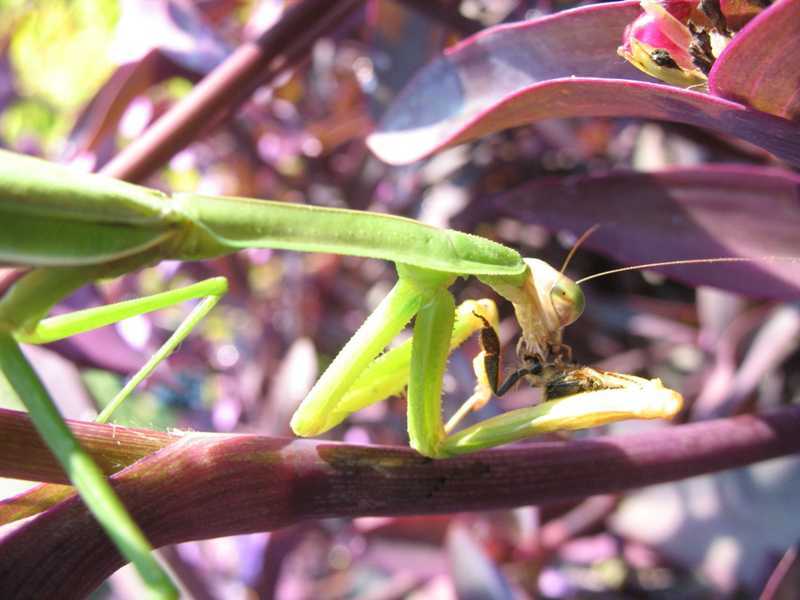 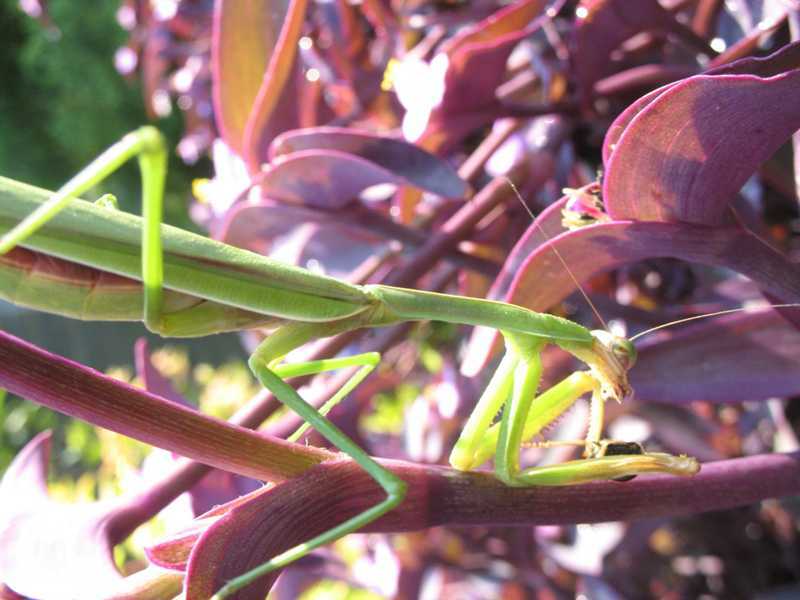 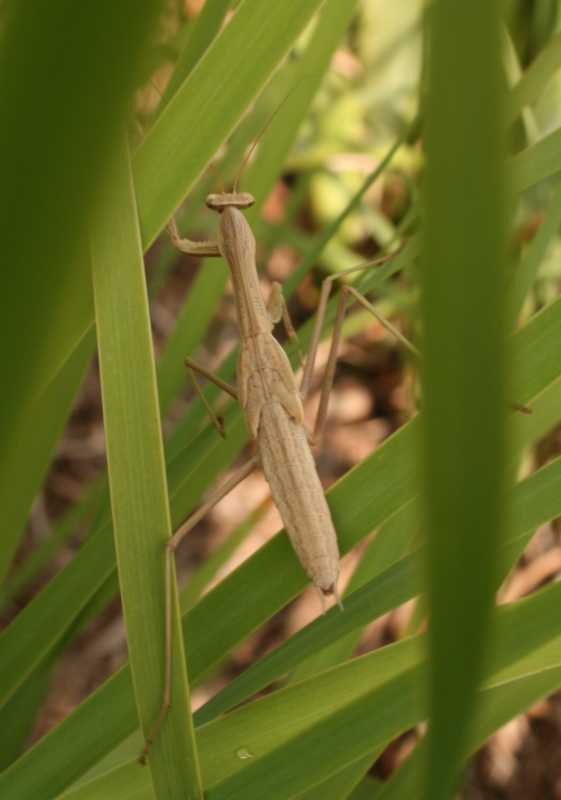 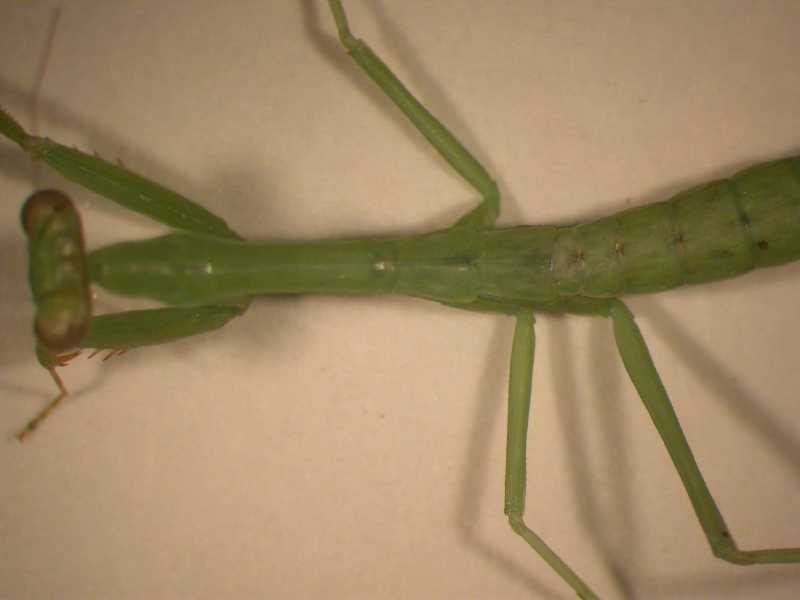 A praying mantis (Mantodea) is the only insects that can turn its head. 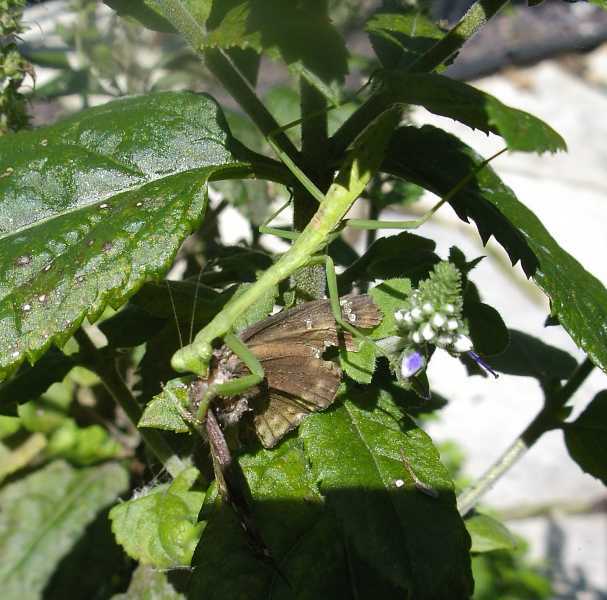 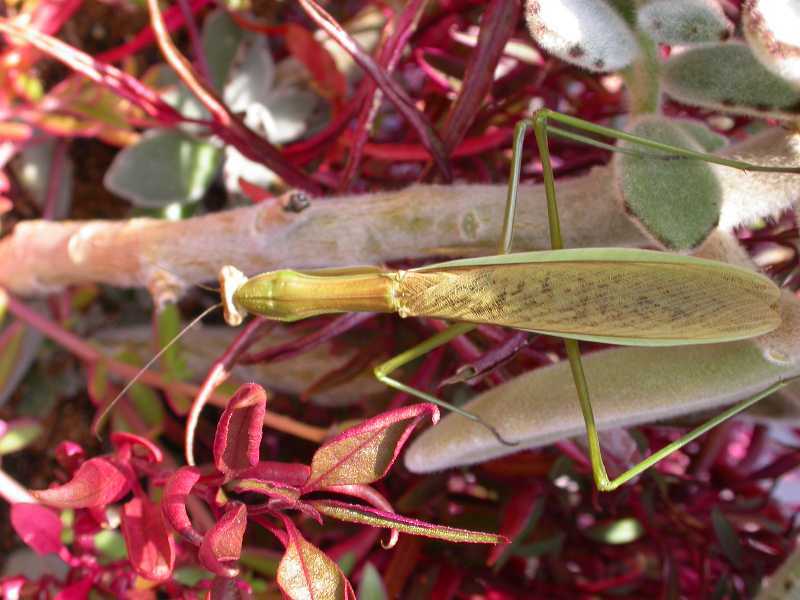 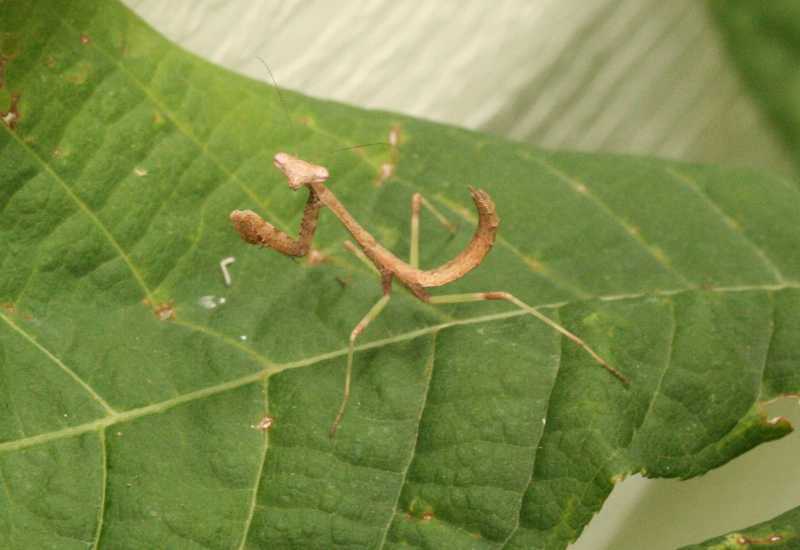 Praying mantis (Mantodea) in distinctive "praying" stance. 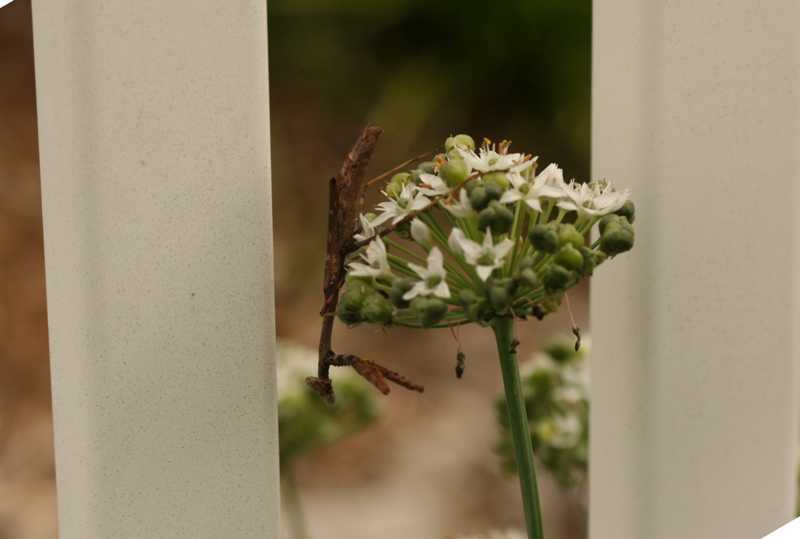 Mating praying mantises (Mantodea). 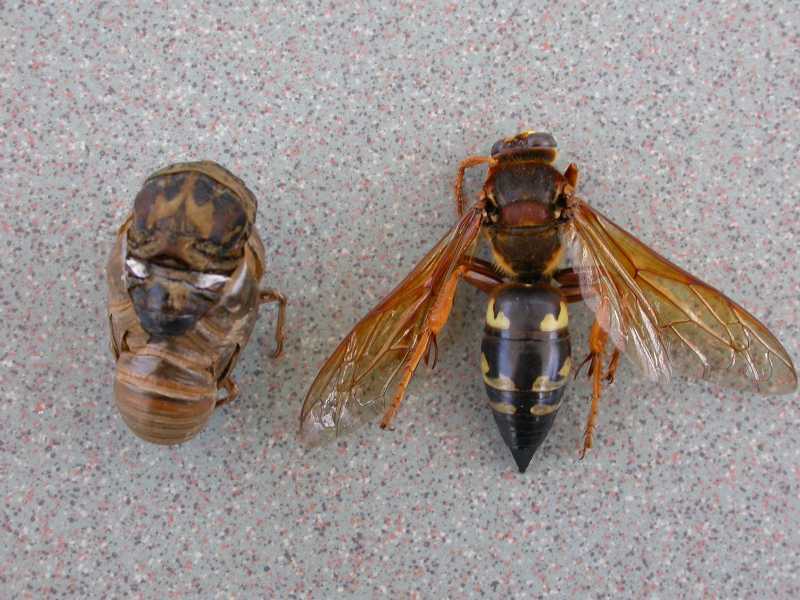 Note that the male is much smaller than the female. 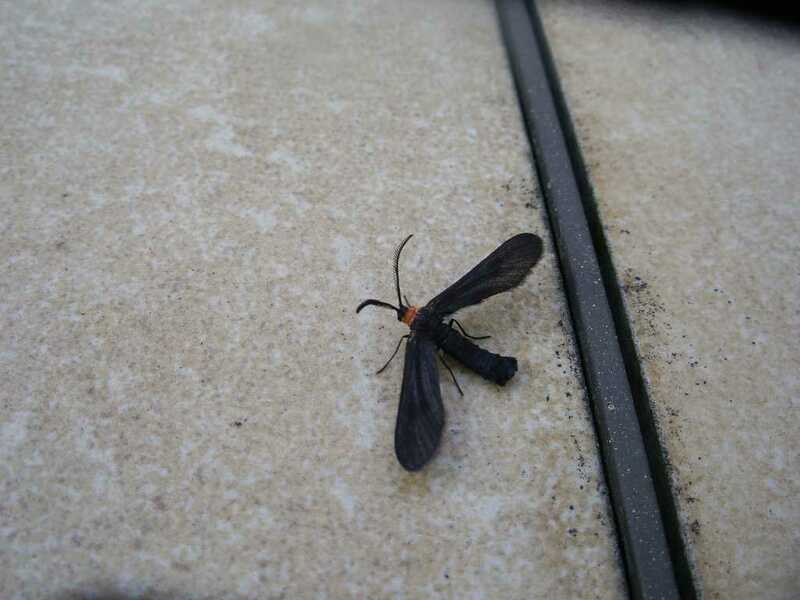 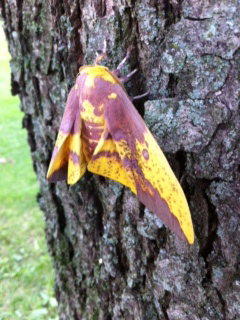 Adult yellow-collared scape moth (Lepidoptera). 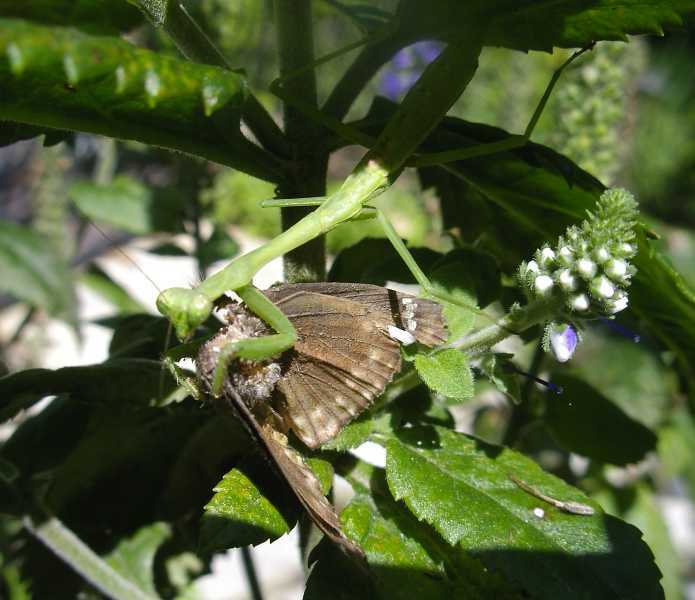 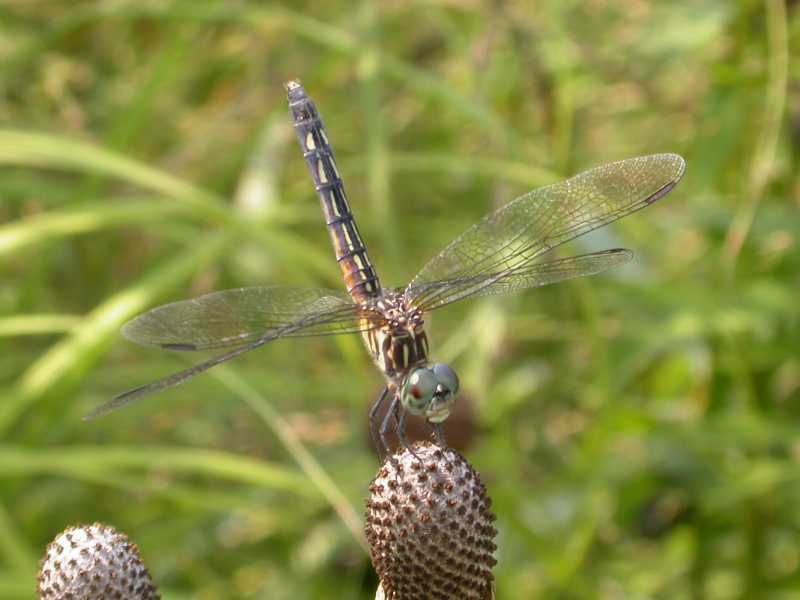 The adults feed on nectar; the larvae/caterpillars feed on grasses, lichens, and mosses. 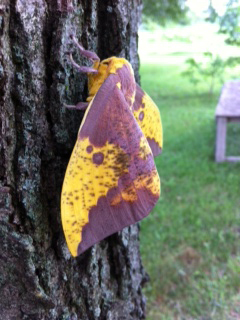 Adult yellow-collared scape moth (Lepidoptera). 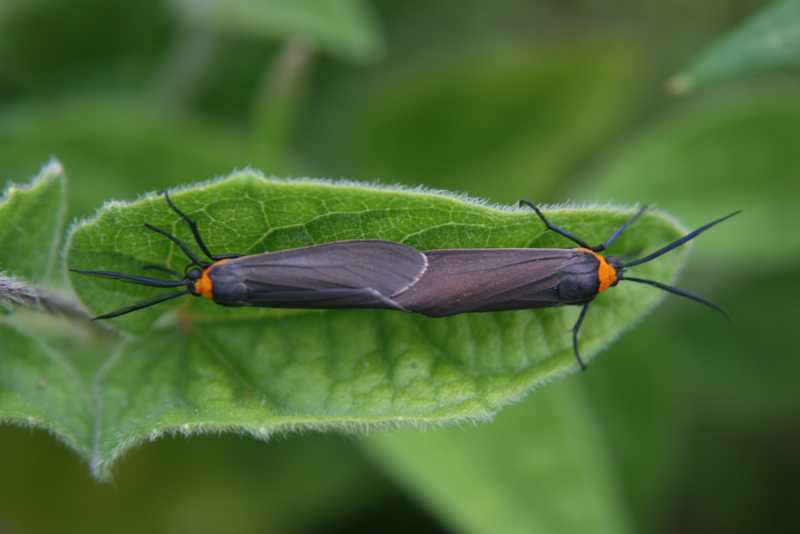 Adult yellow-collared scape moths (Lepidoptera), mating. 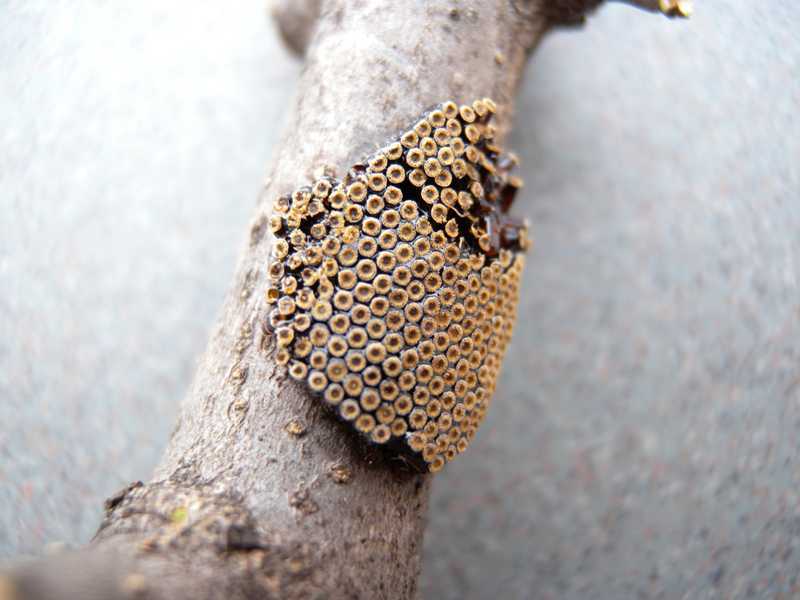 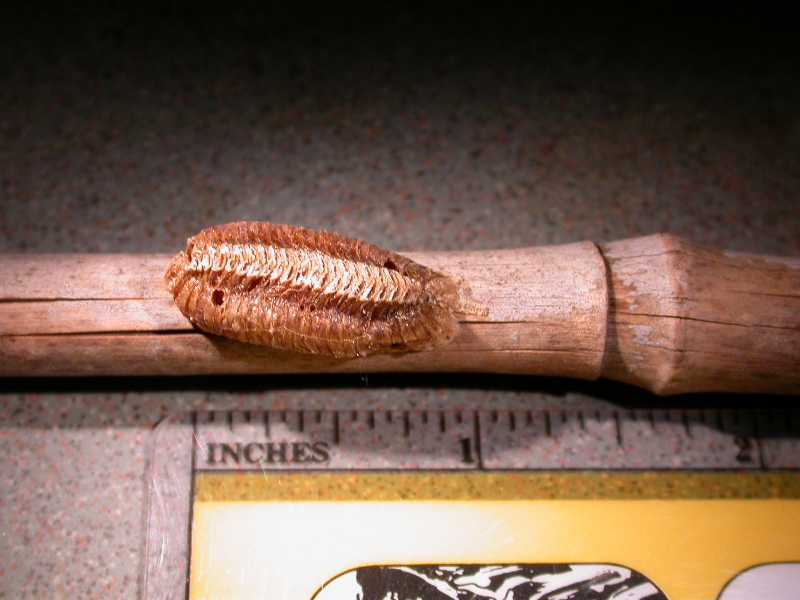 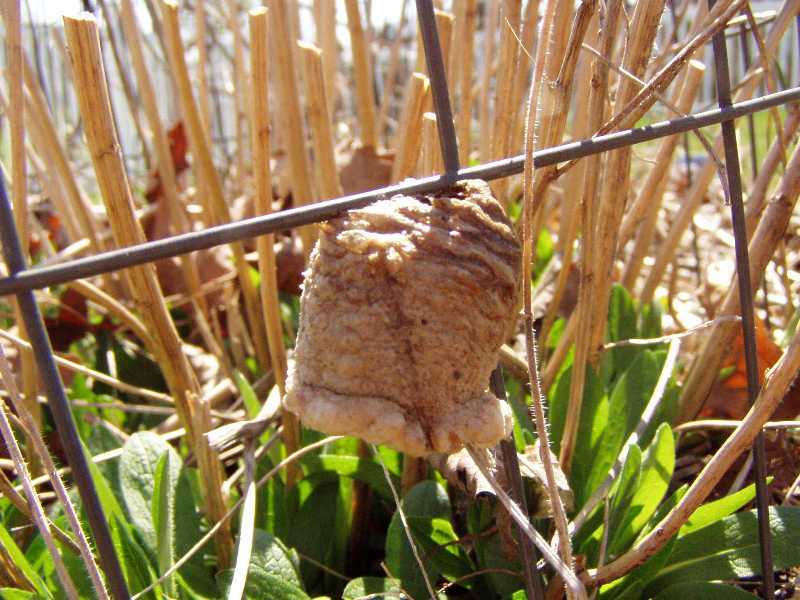 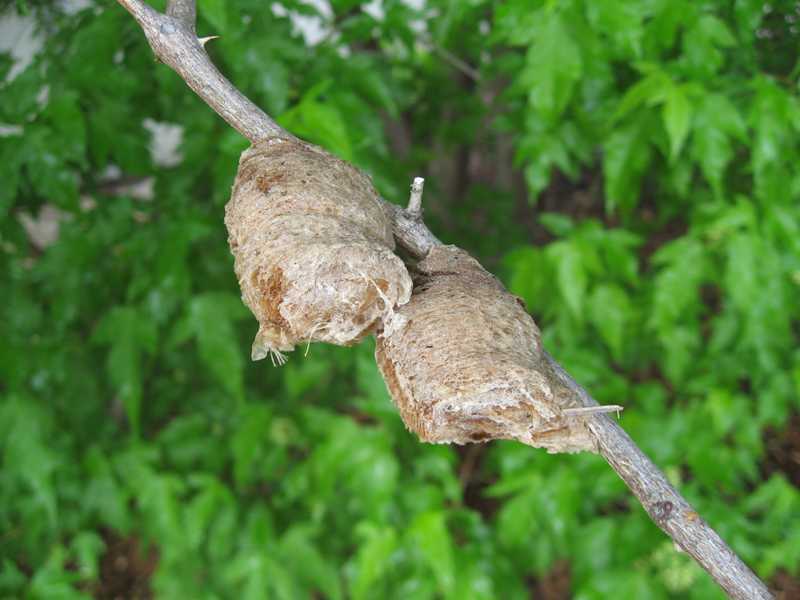 Cocoons of hairnet spongeflies or spongillaflies (Neuroptera). 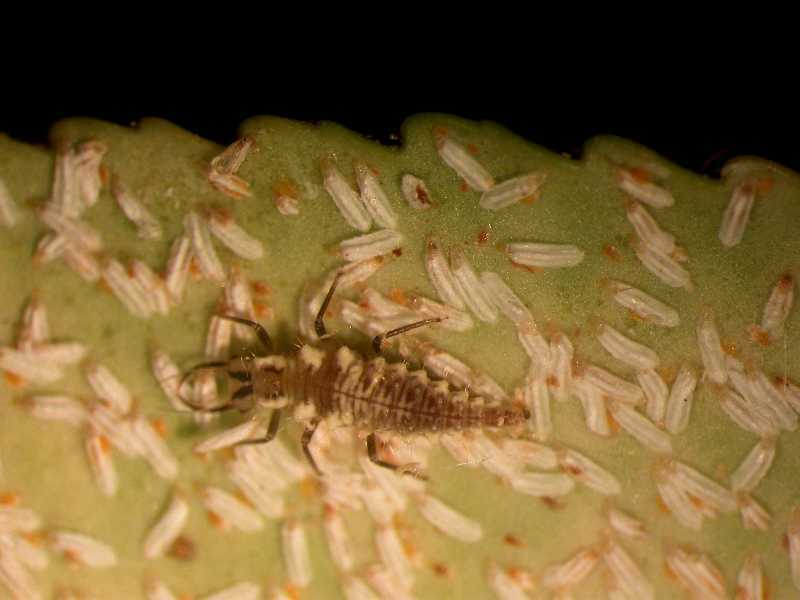 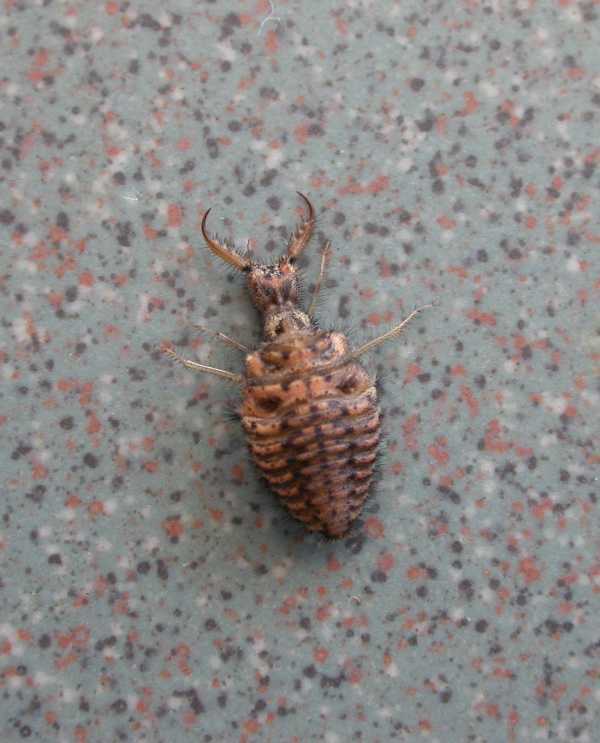 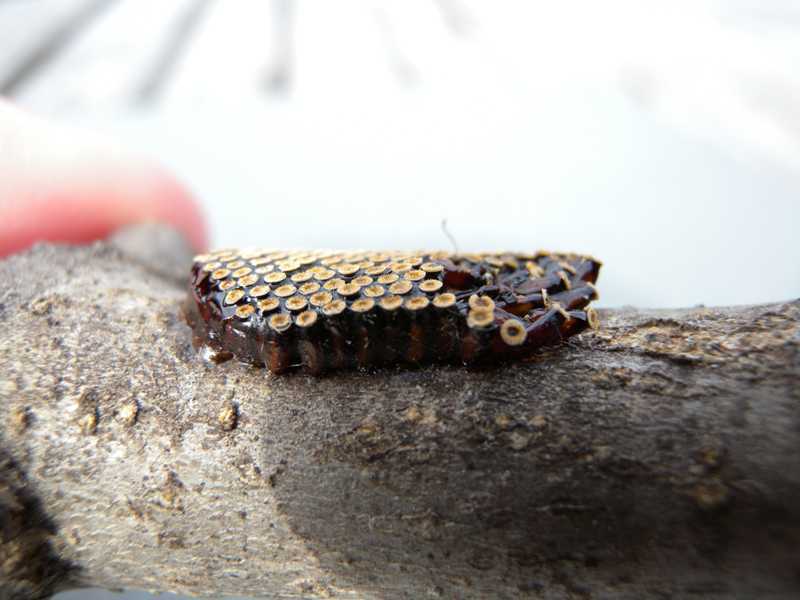 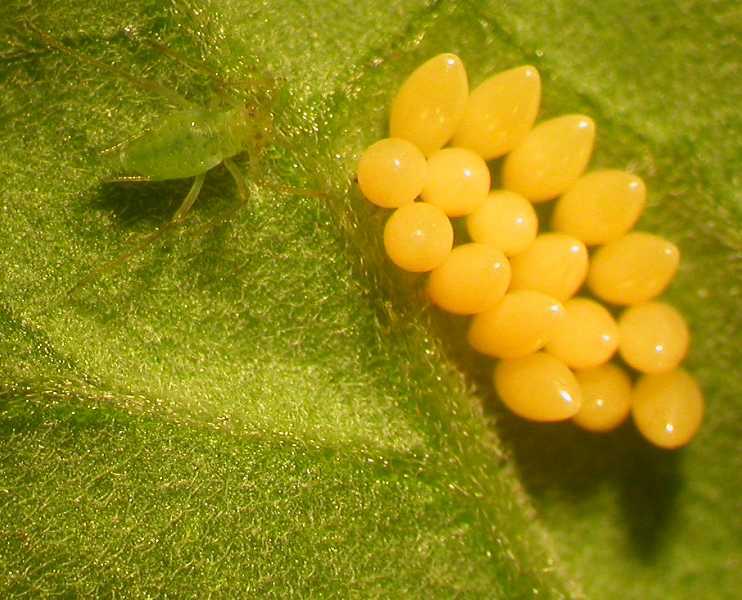 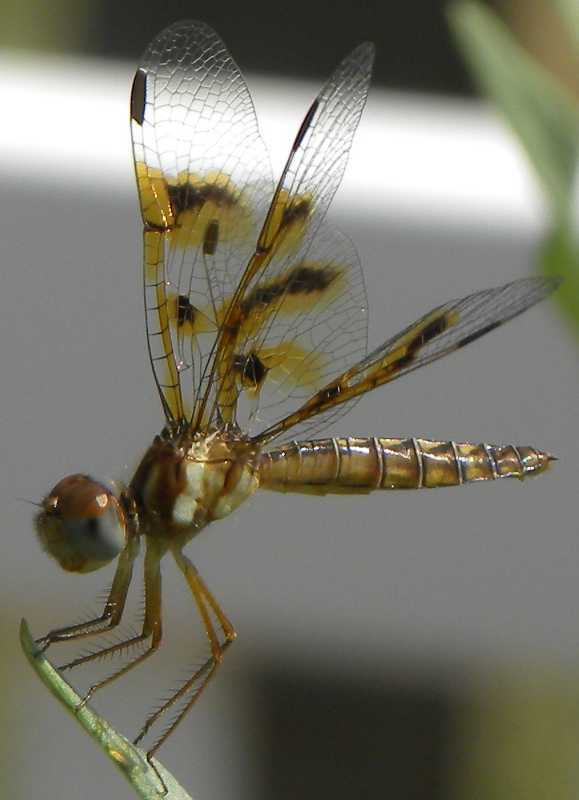 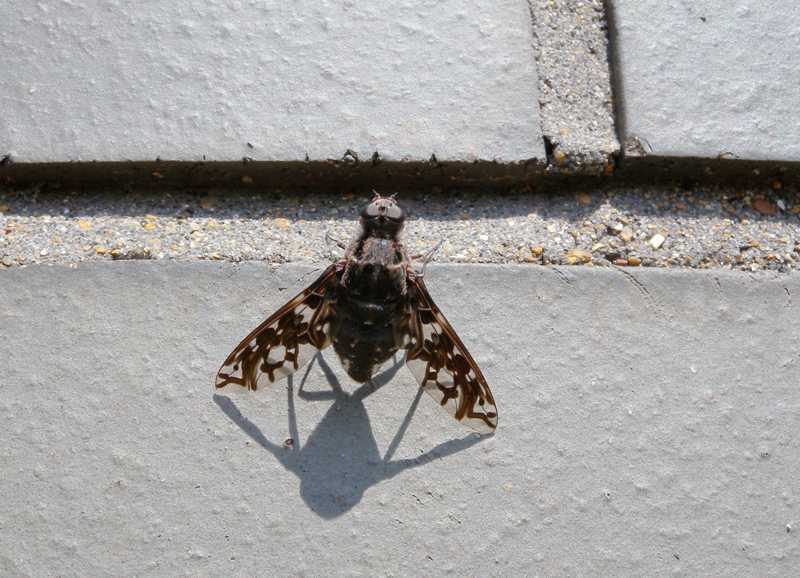 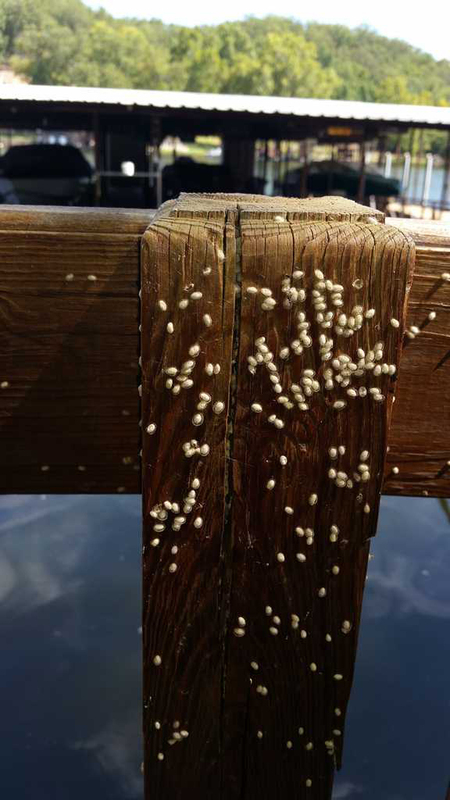 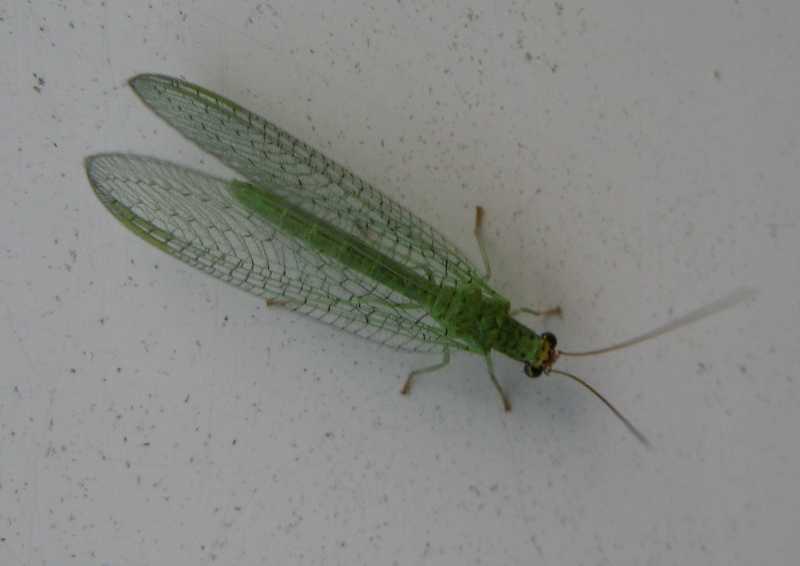 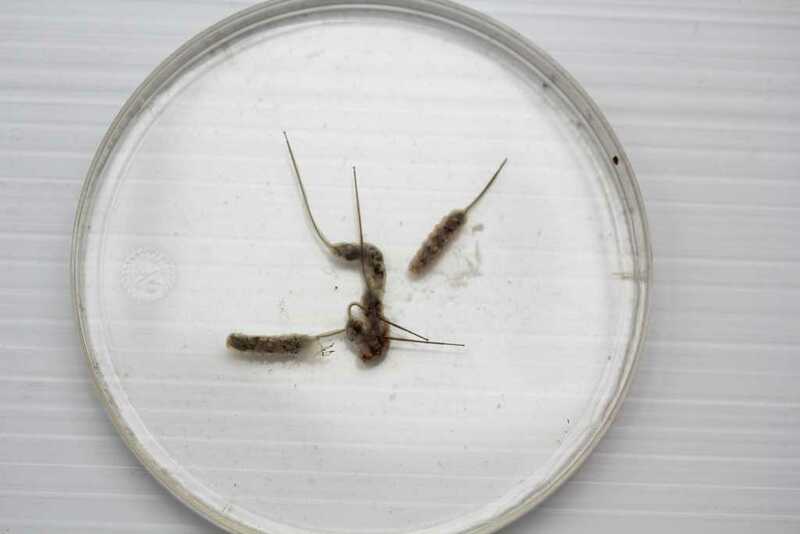 Adults resemble brown lacewings; larvae are aquatic feeding on fresh water sponges and bryozoans. 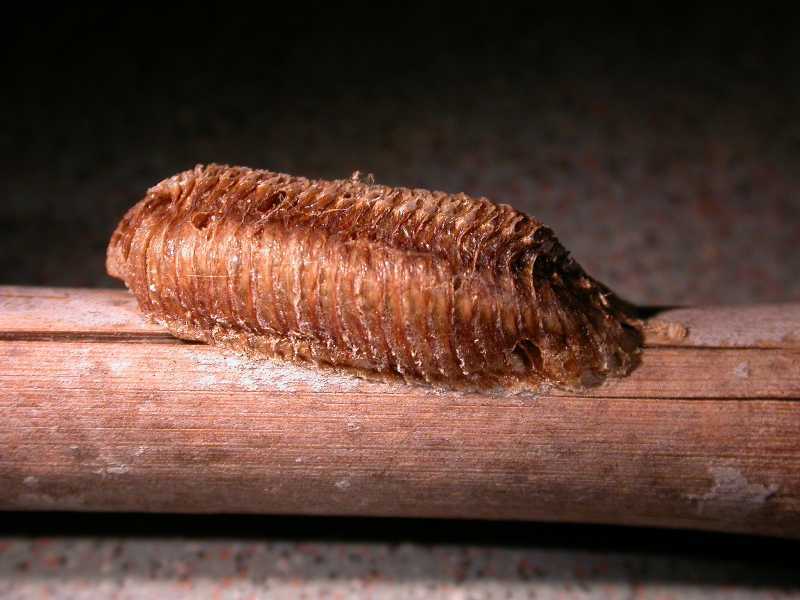 Cocoons of hairnet spongeflies or spongillaflies (Neuroptera). 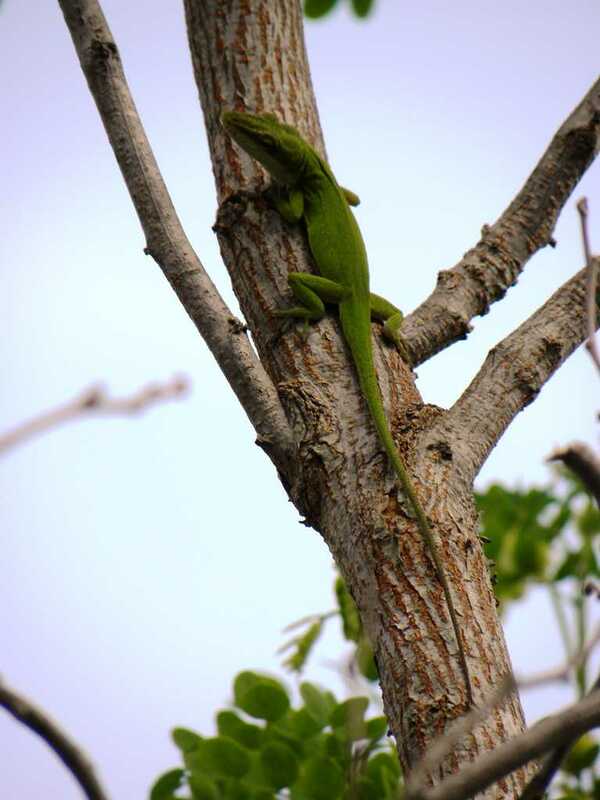 Lizard on a tree in San Antonio, Texas. 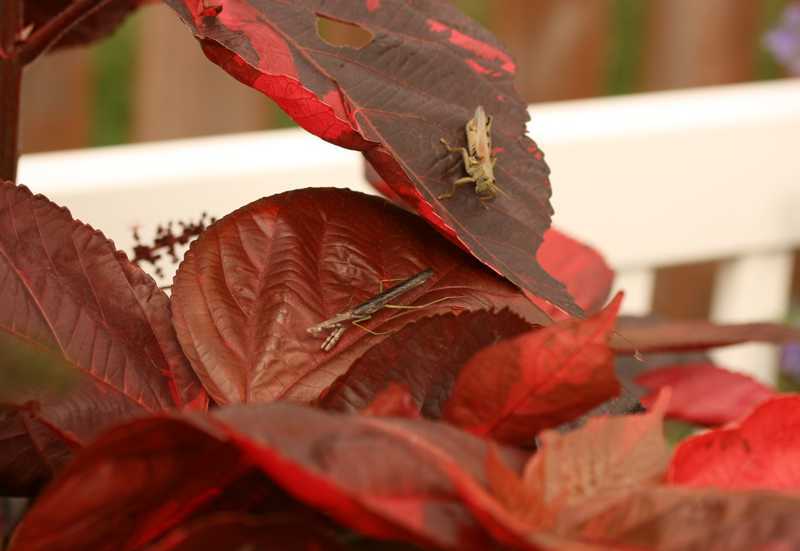 Most lizards are insectivorous and therefore beneficial. 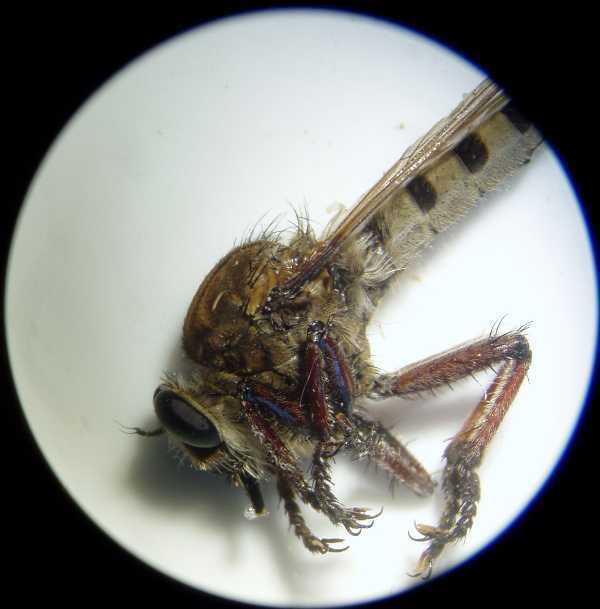 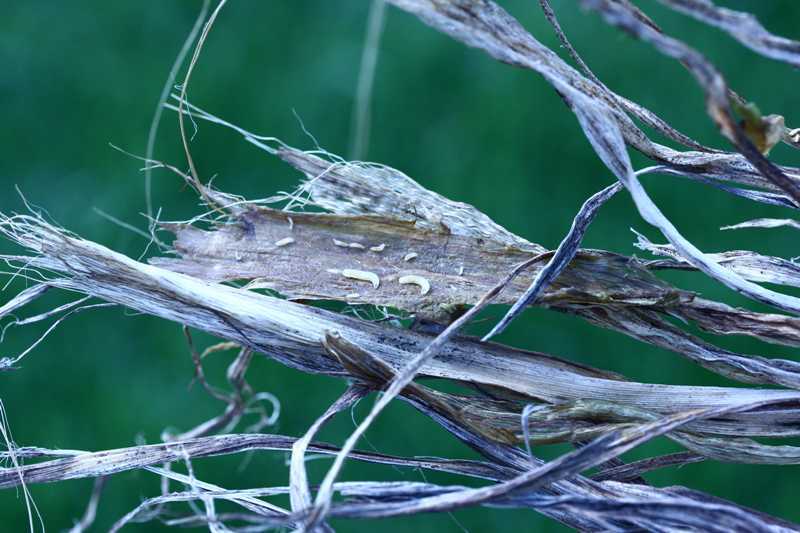 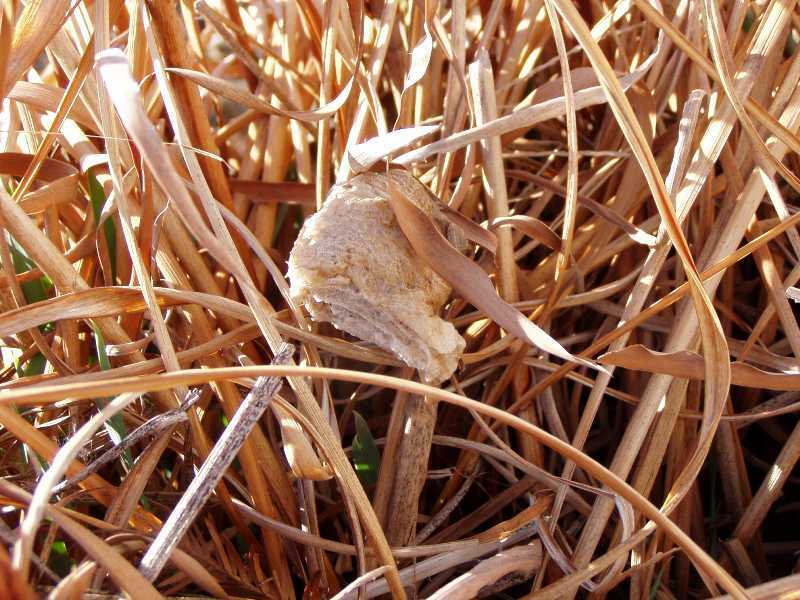 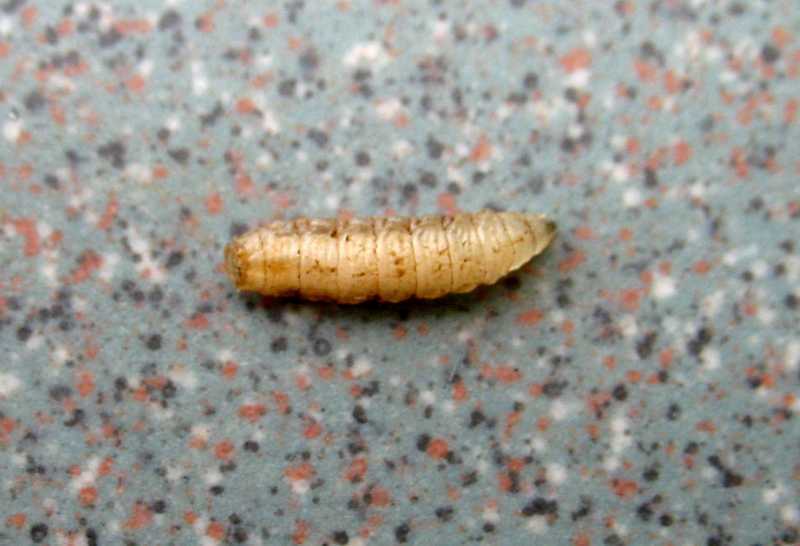 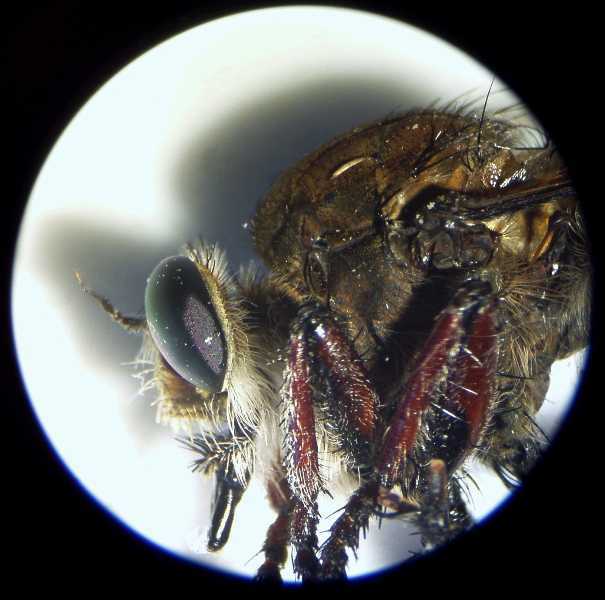 Rat-tail maggots (Diptera) feed on decaying vegetation and are part of the natural decay process. 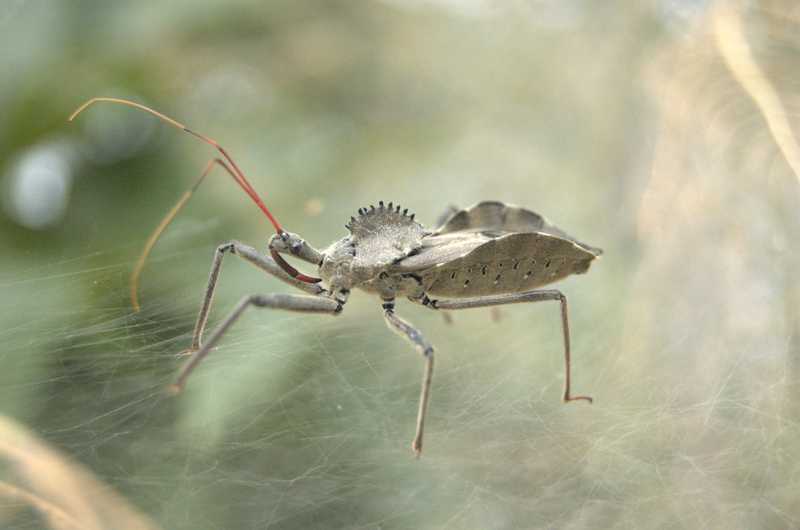 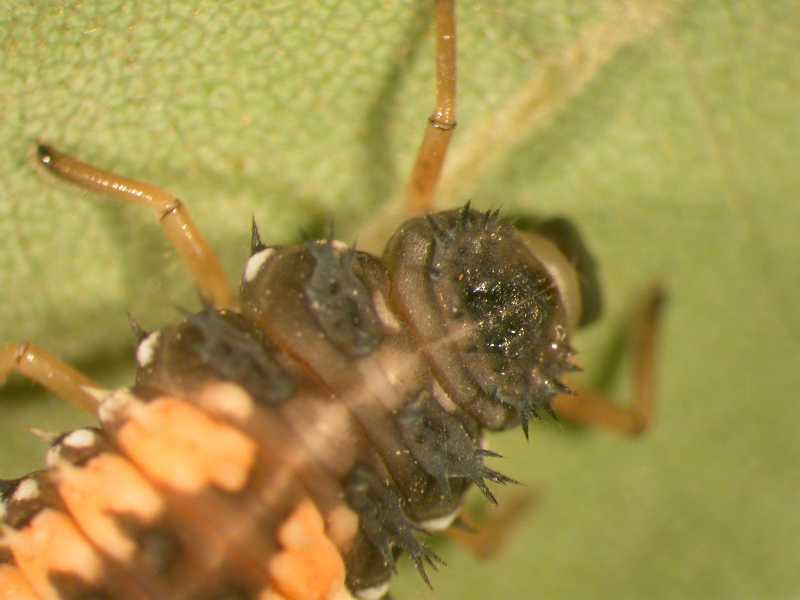 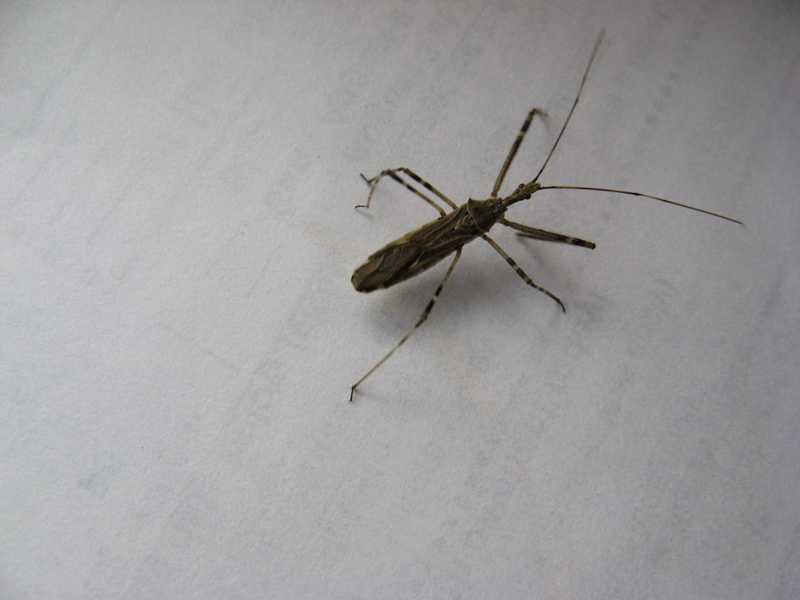 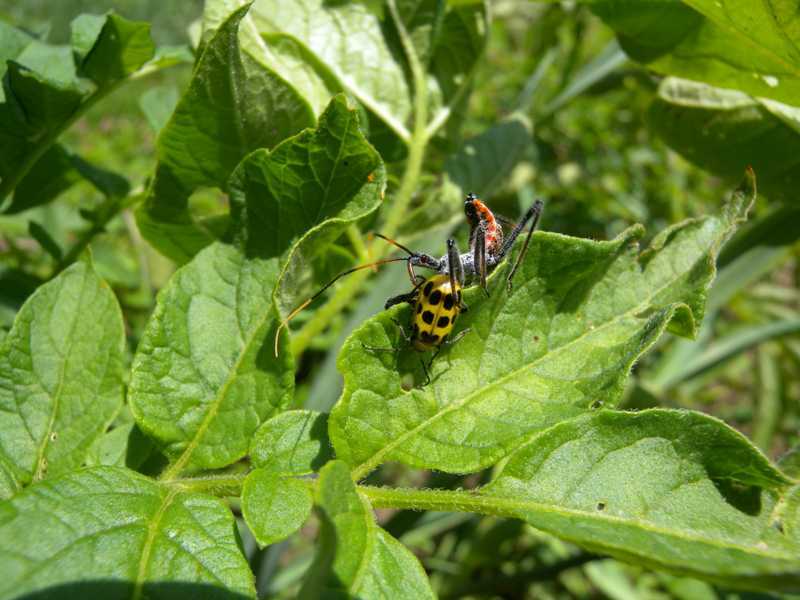 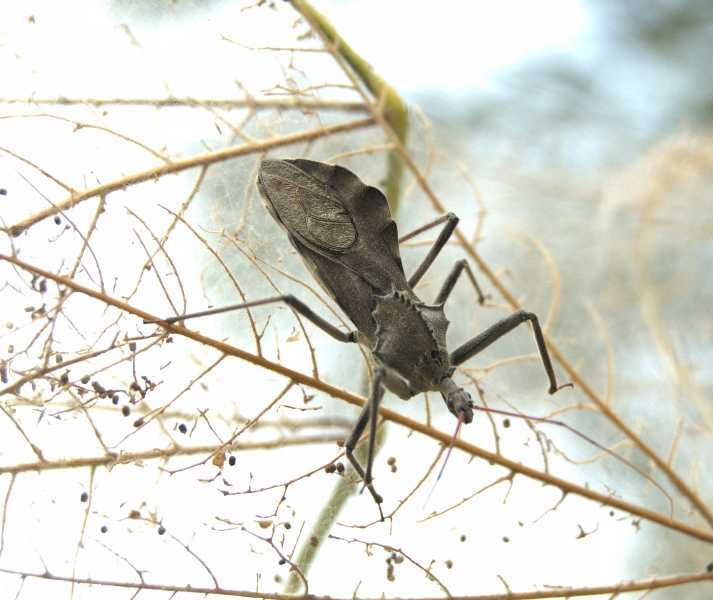 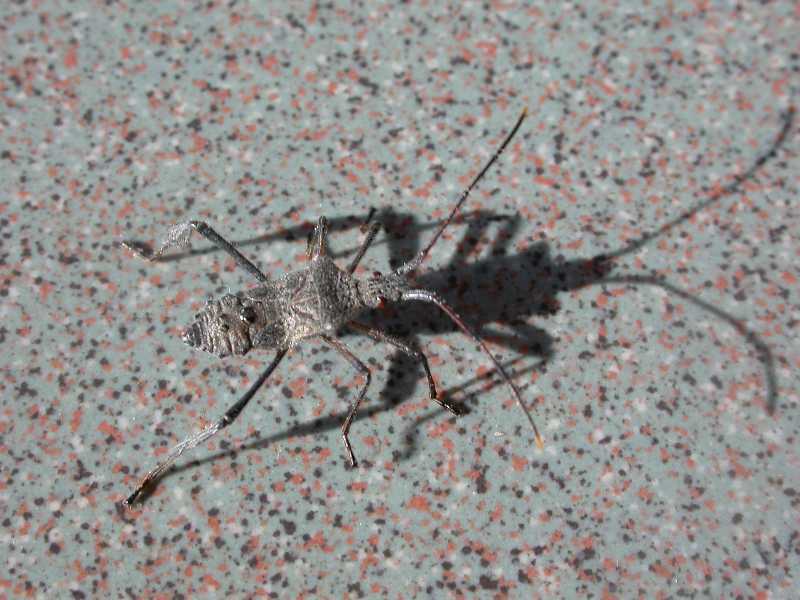 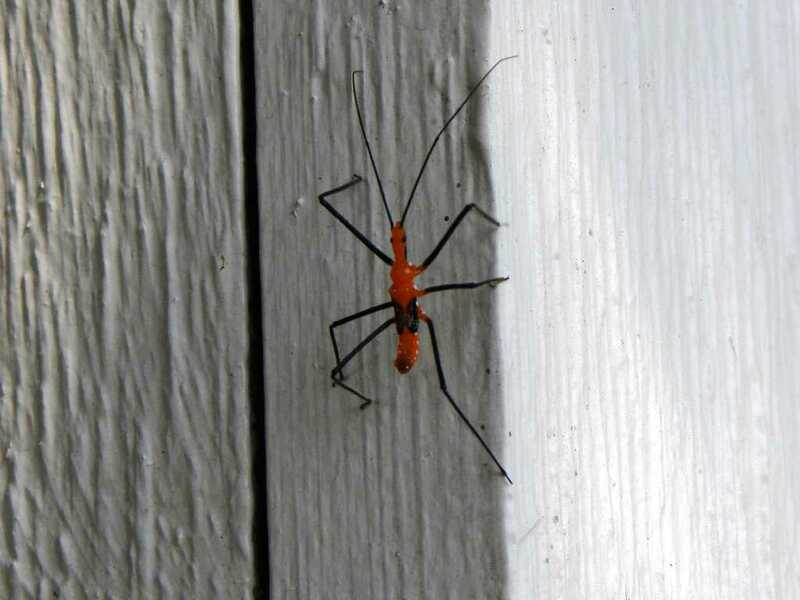 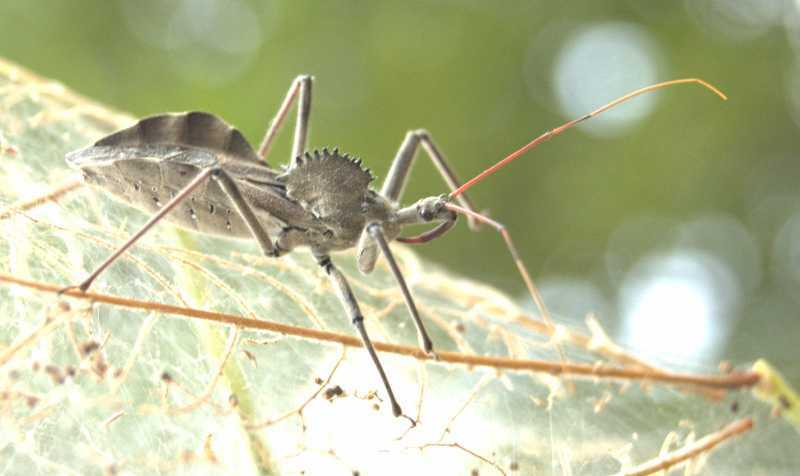 Immature assassin bug (Hemiptera); most are predatory feeding on other insects. 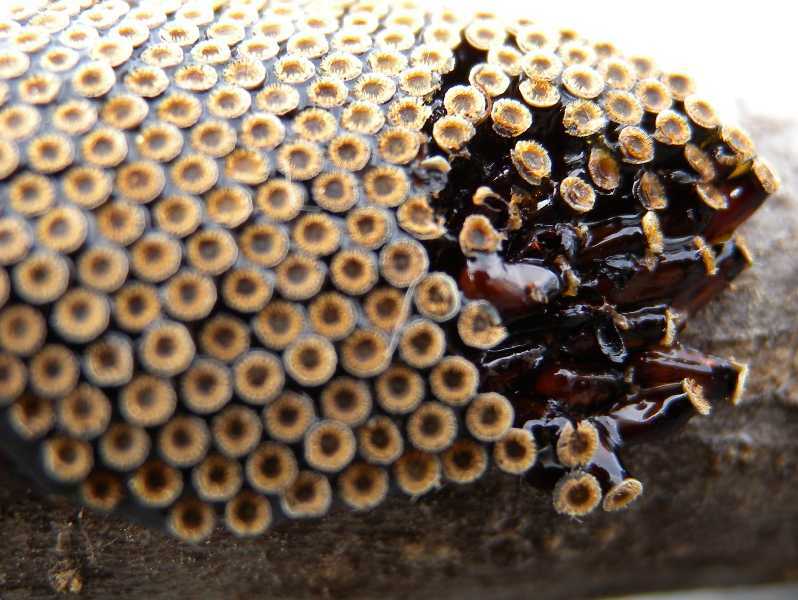 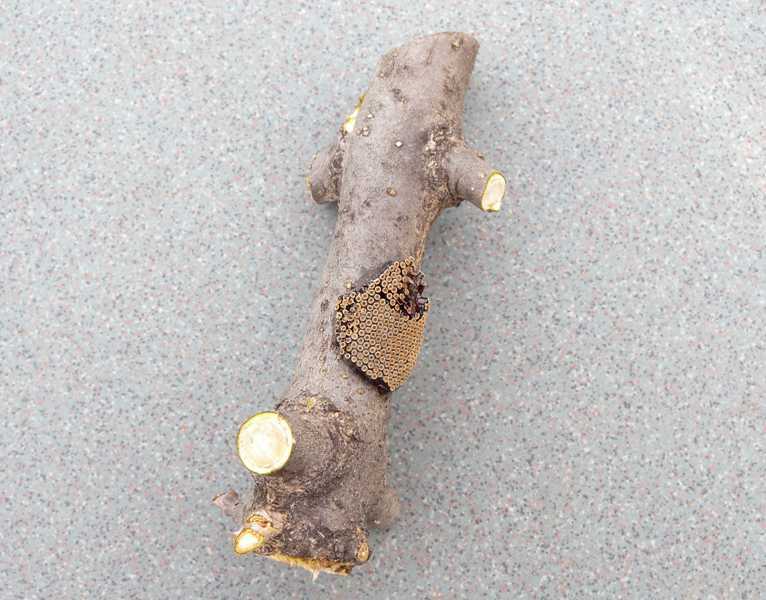 Wasp larvae of a potter or mason wasp (Hymenoptera). 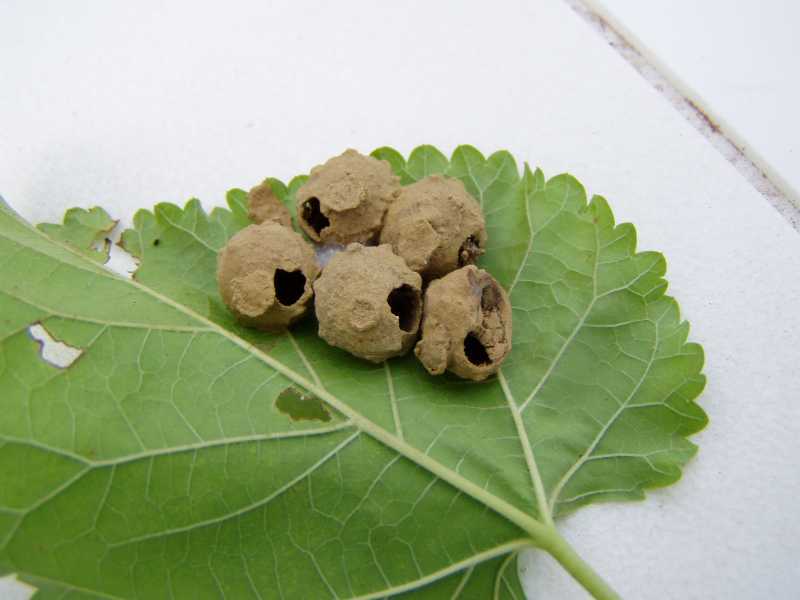 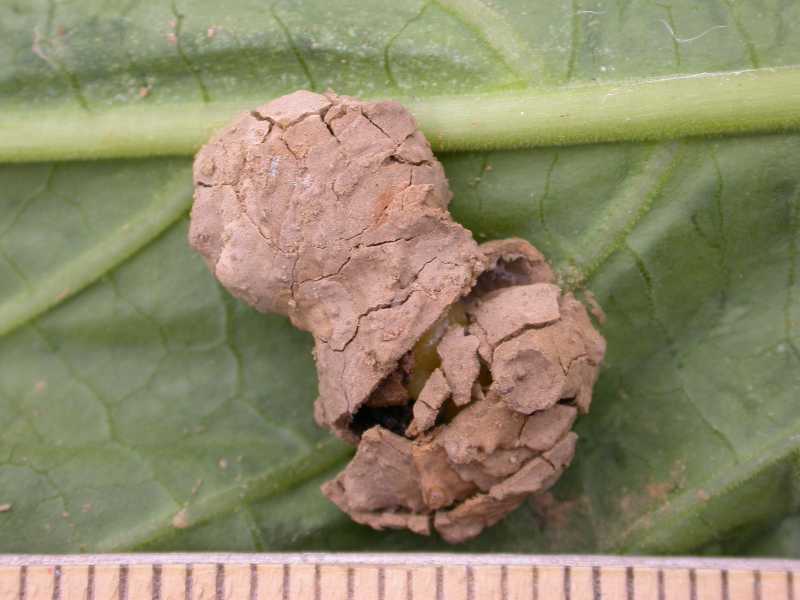 These solitary wasps build nurseries of mud and stock them with prey. 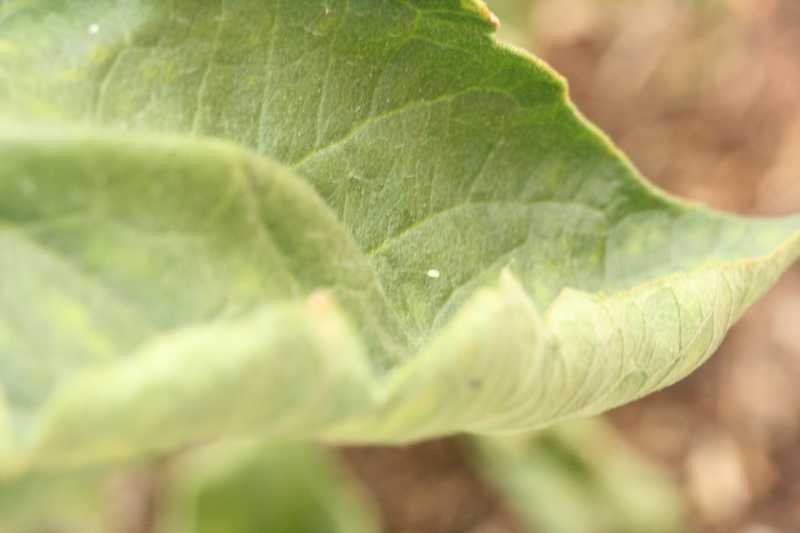 Monarch crysalis (Lepidoptera). 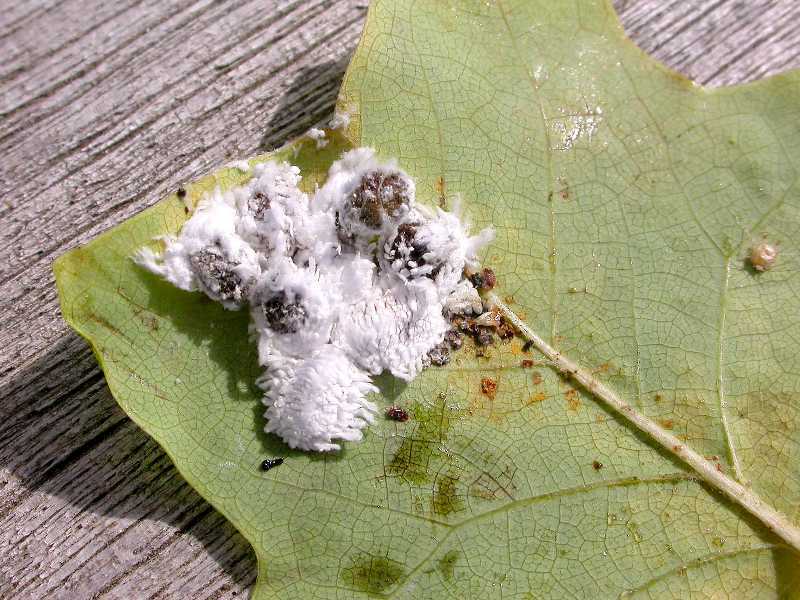 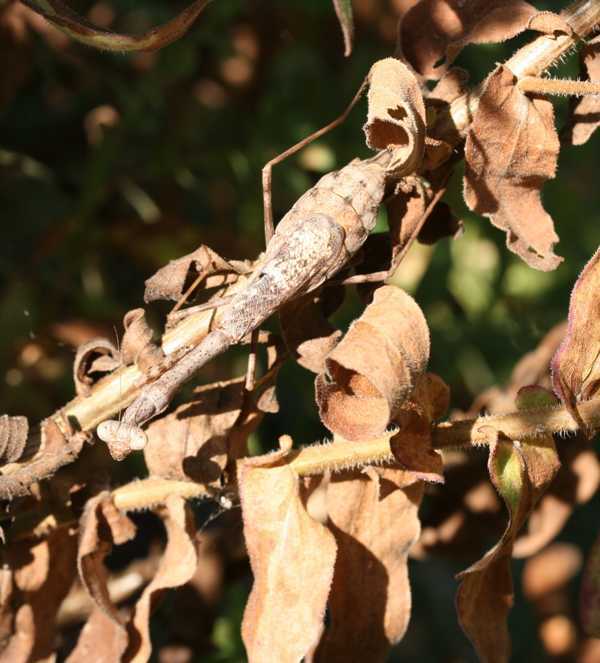 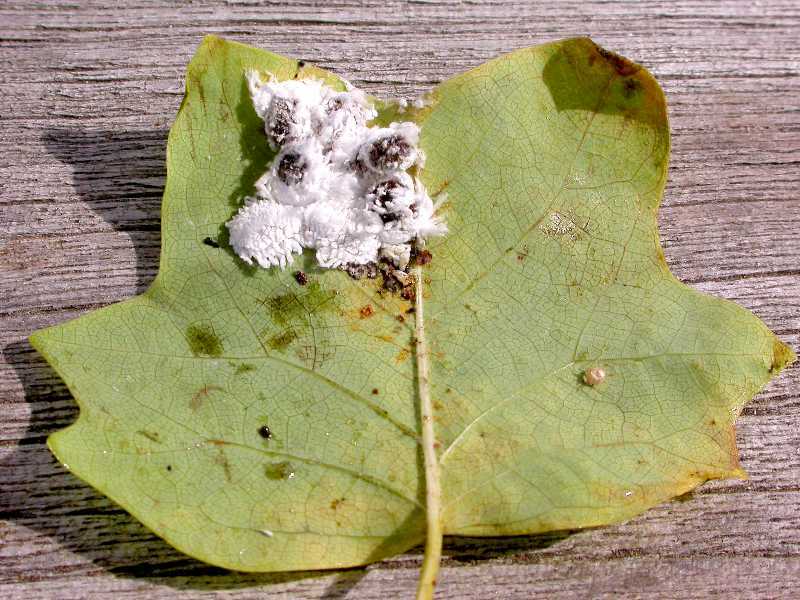 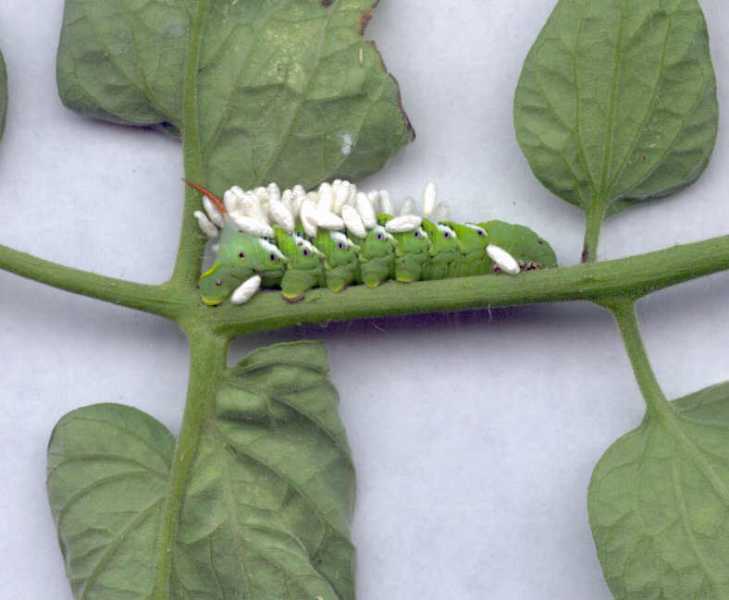 The caterpillars of many butterflies and moths leave their larval food plant and move to a taller vertical surface, like a post lying in a truck bed. 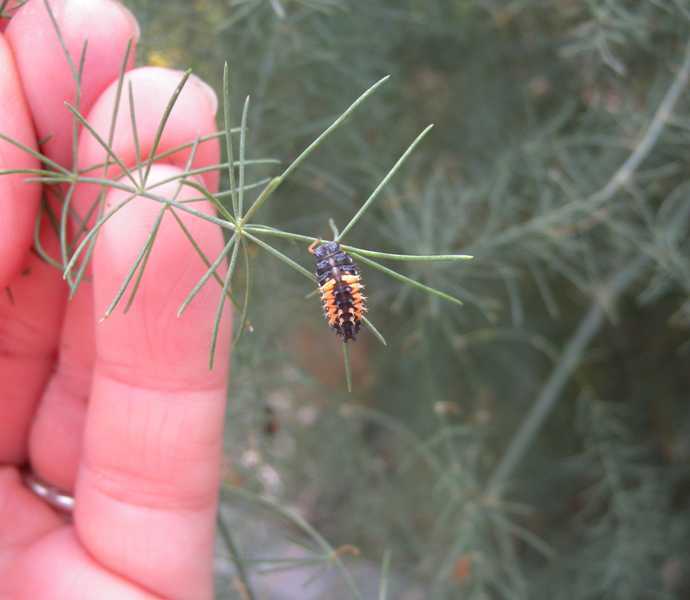 Black swallowtail crysalis (Lepidoptera). 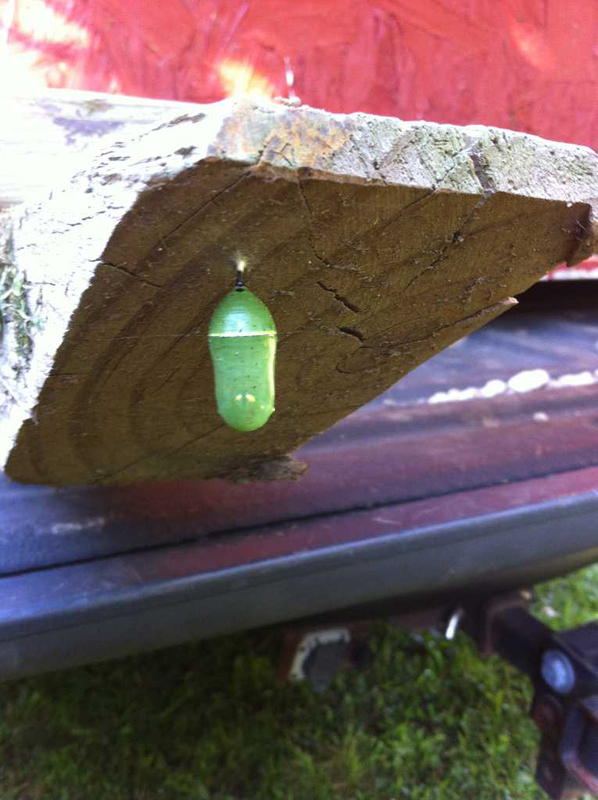 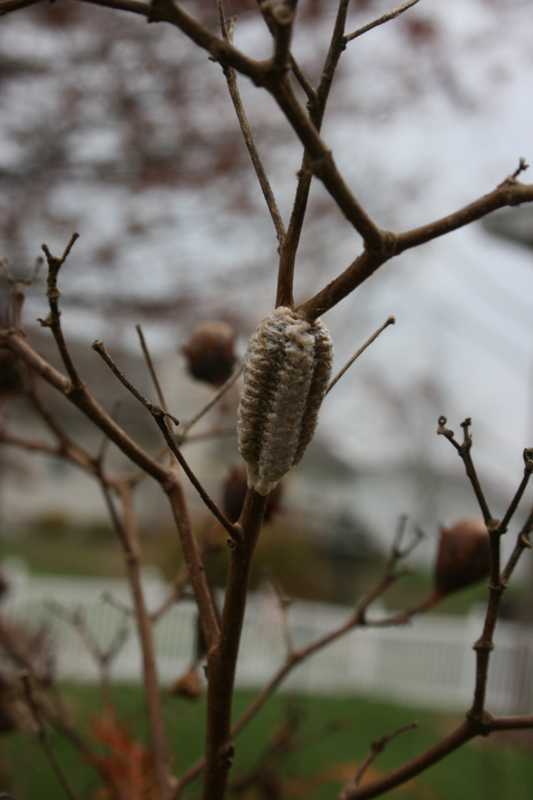 Caterpillar moved from dill plants to a crape myrtle to pupate. 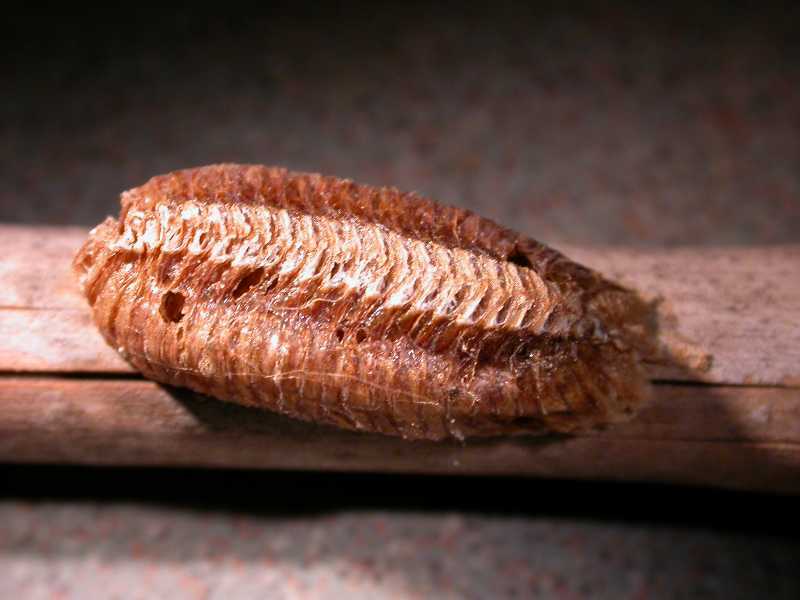 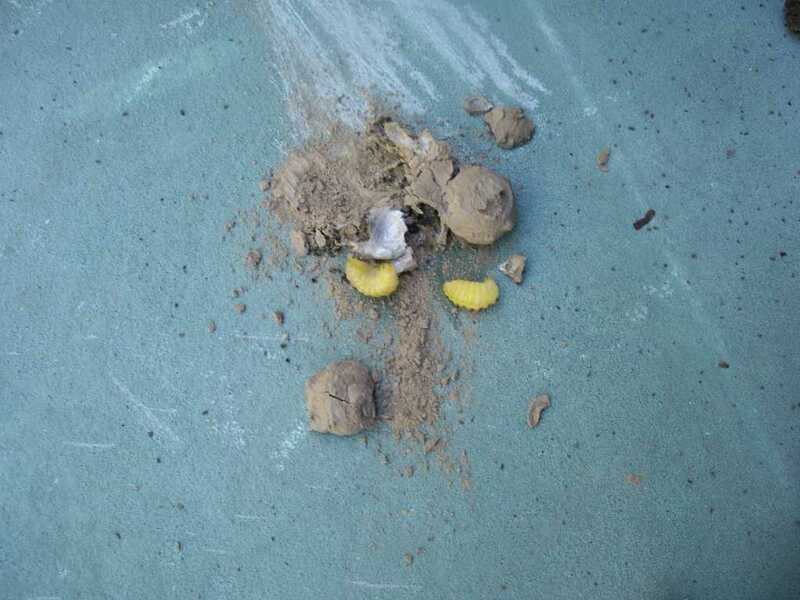 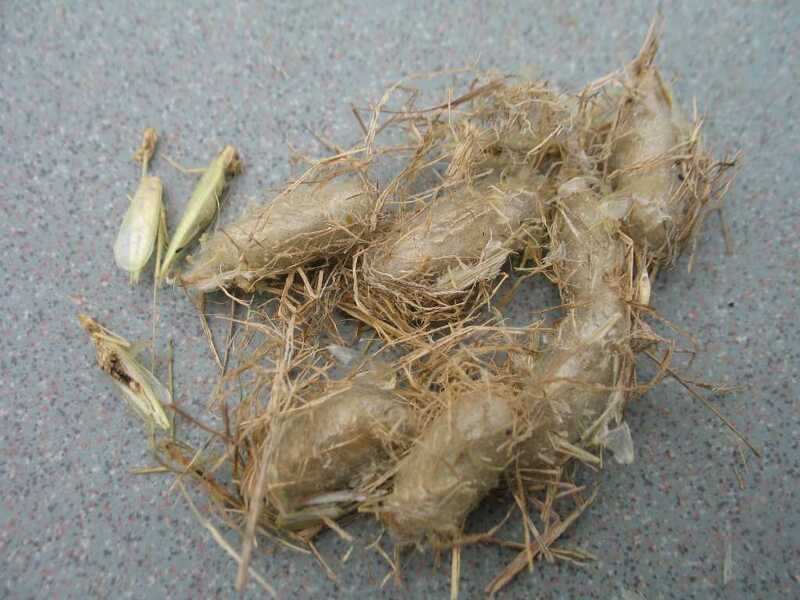 Ichneumon wasp pupa, a campopleginae cocoon, (Hymenoptera) with remains of host insect attached. 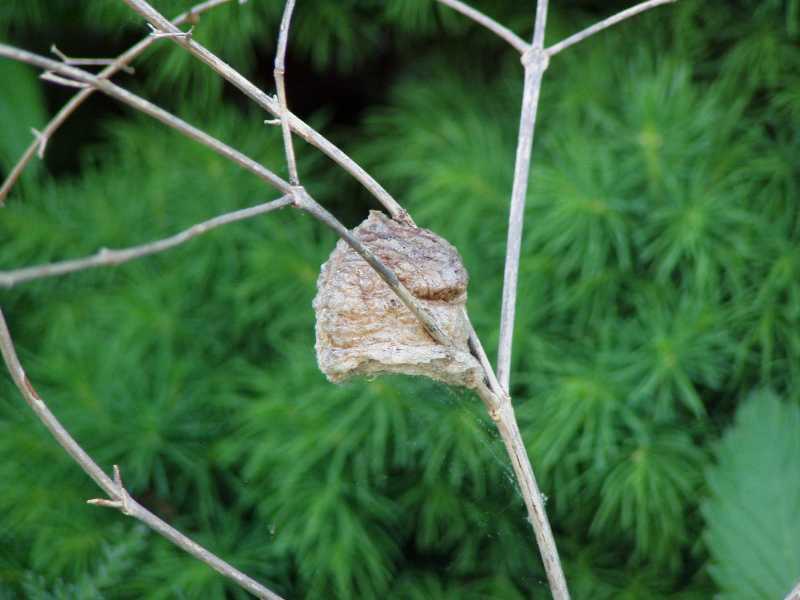 Spider egg cases on an azalea bush (Rhododendron); all spiders (Araneae) are beneficial predators.